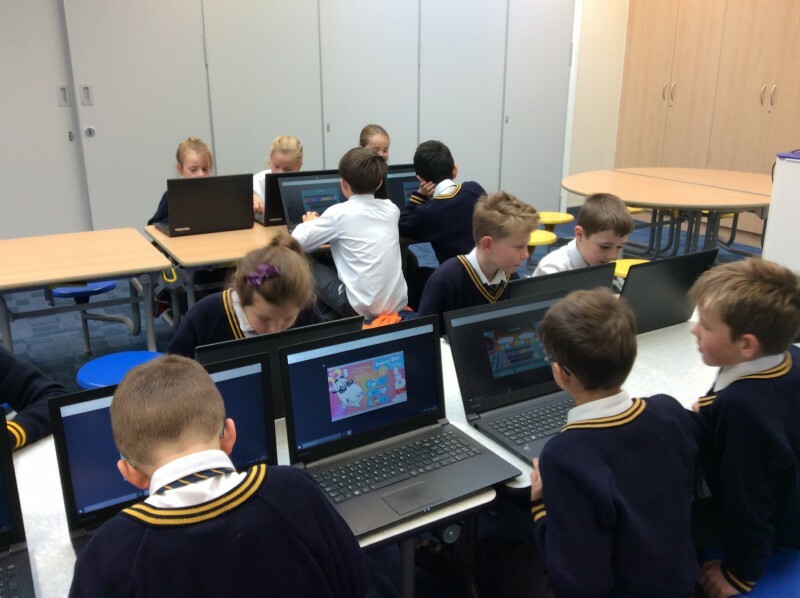 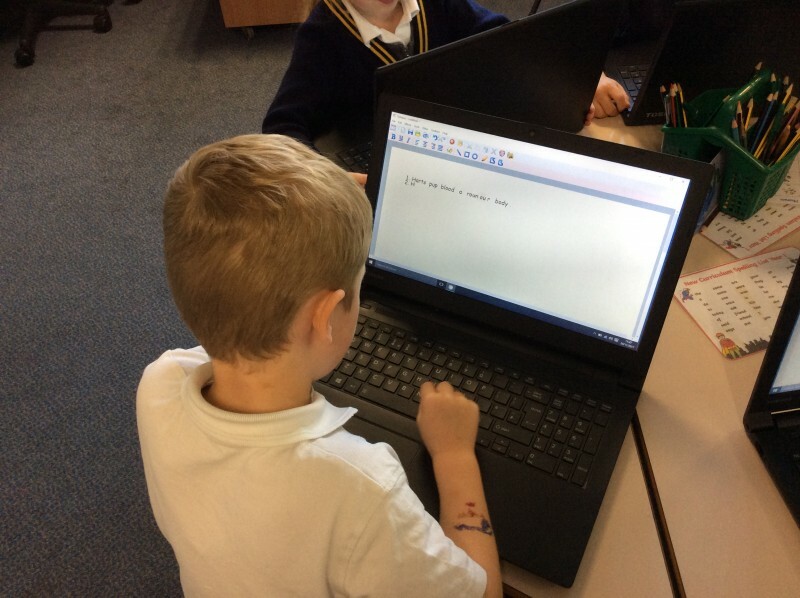 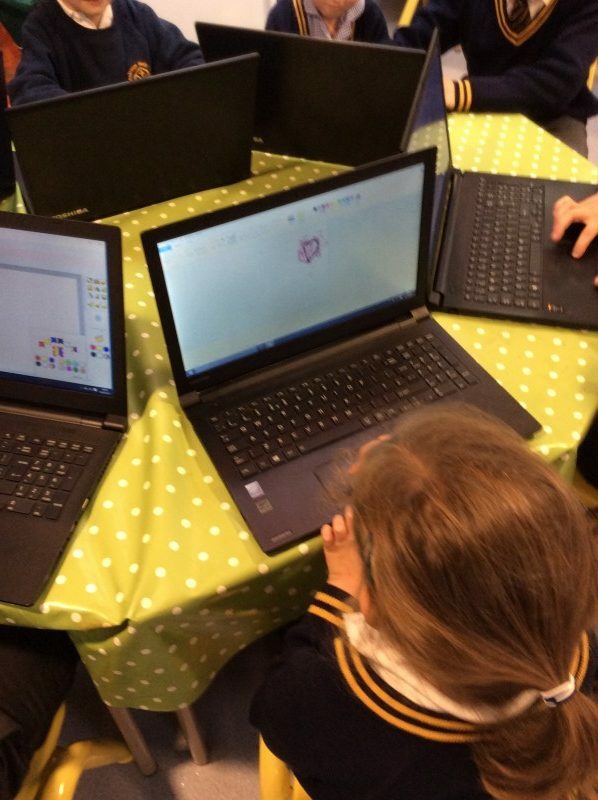 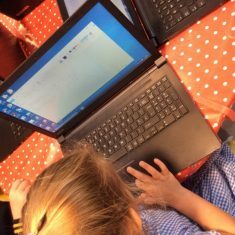 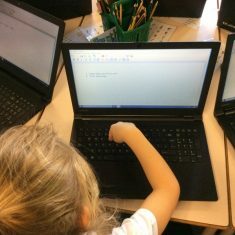 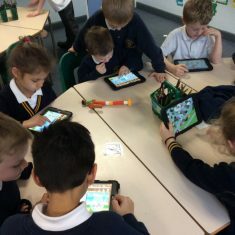 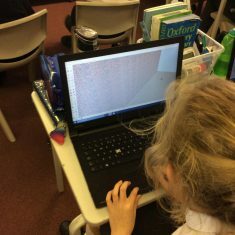 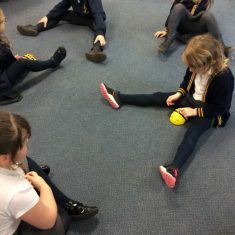 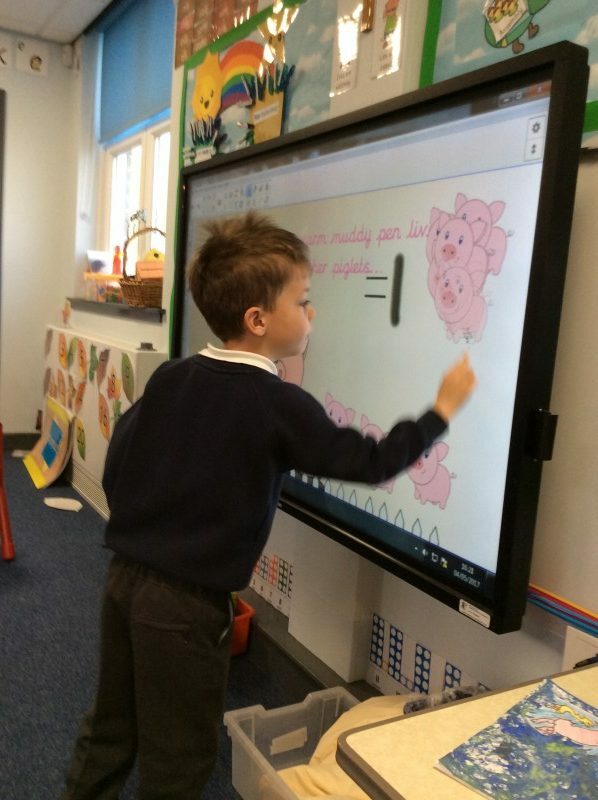 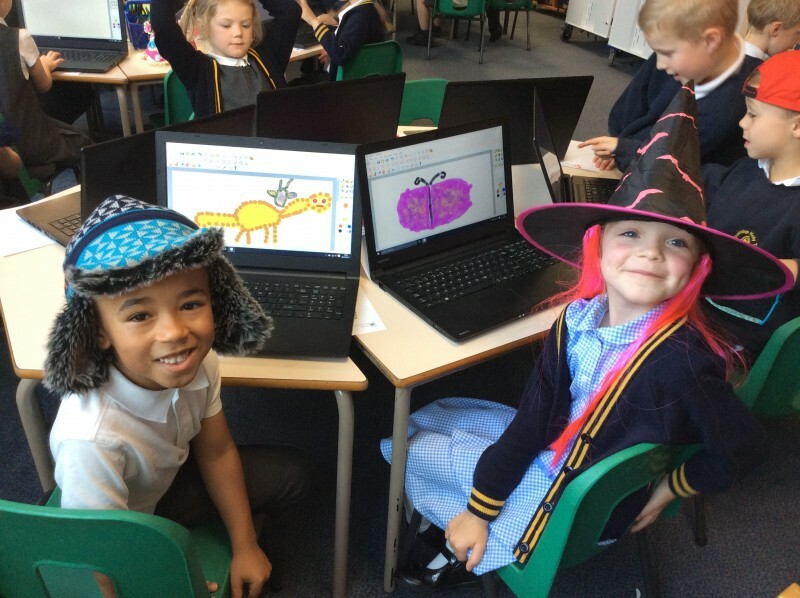 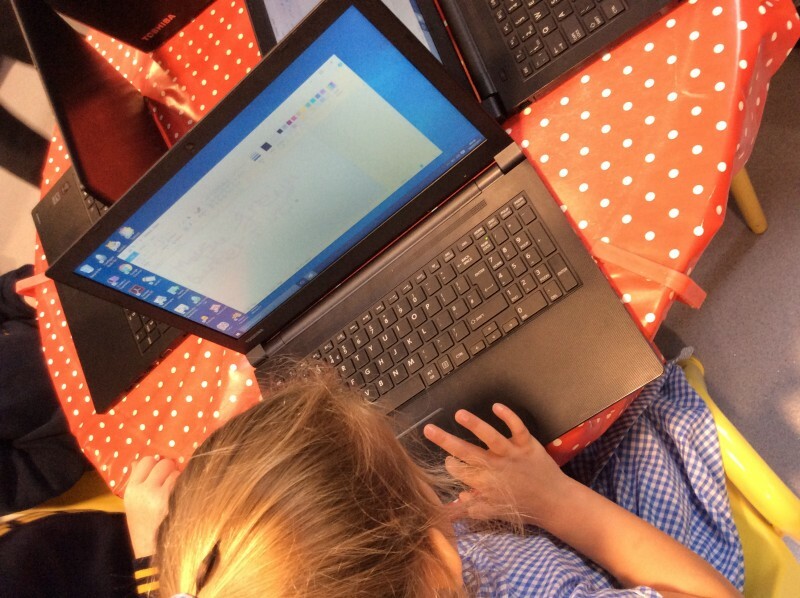 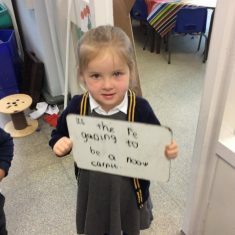 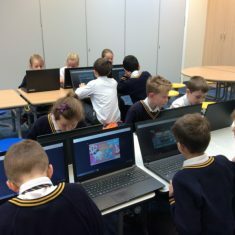 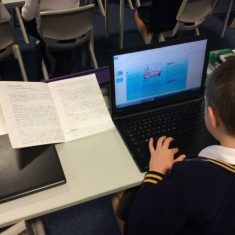 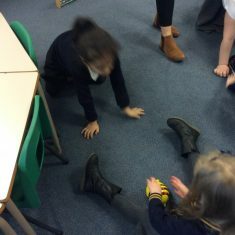 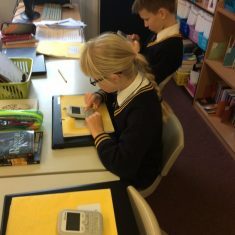 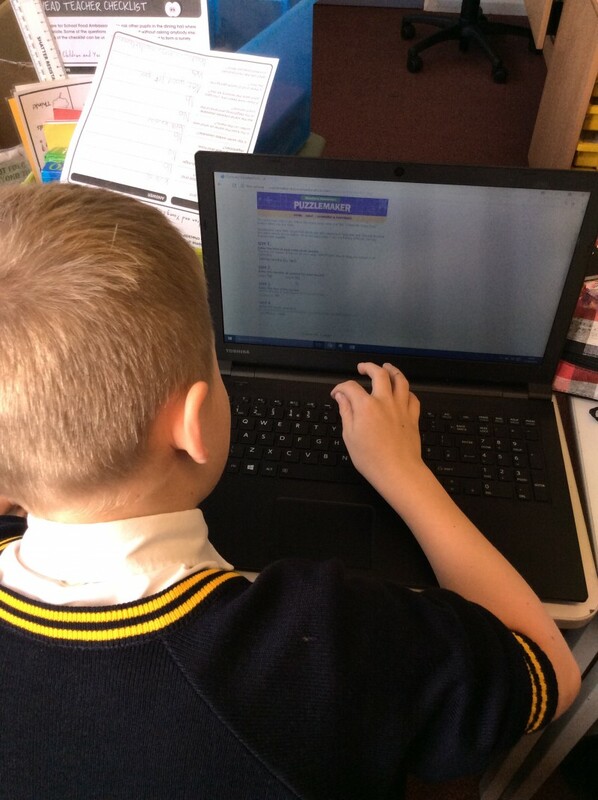 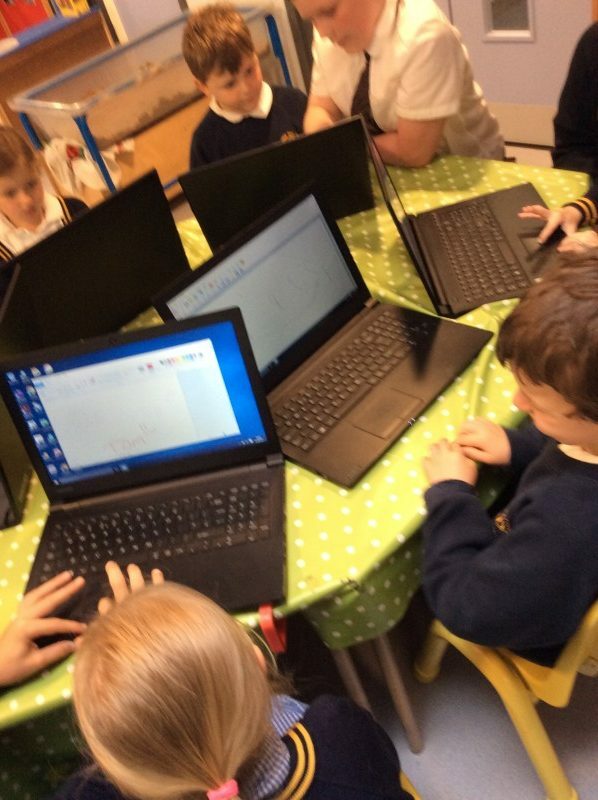 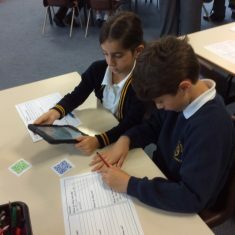 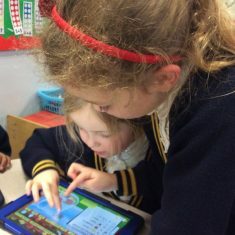 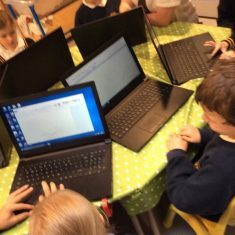 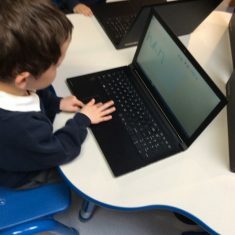 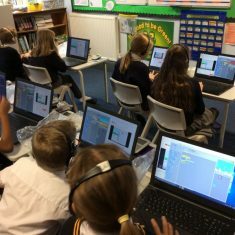 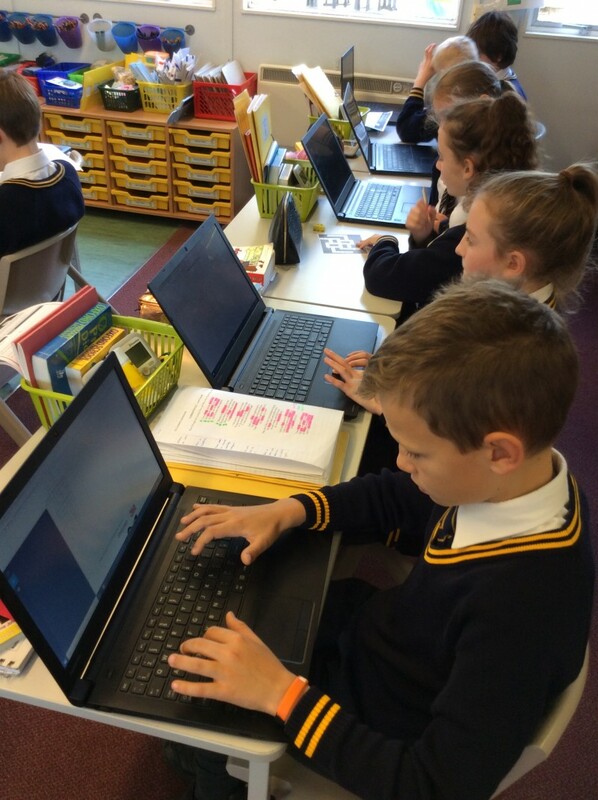 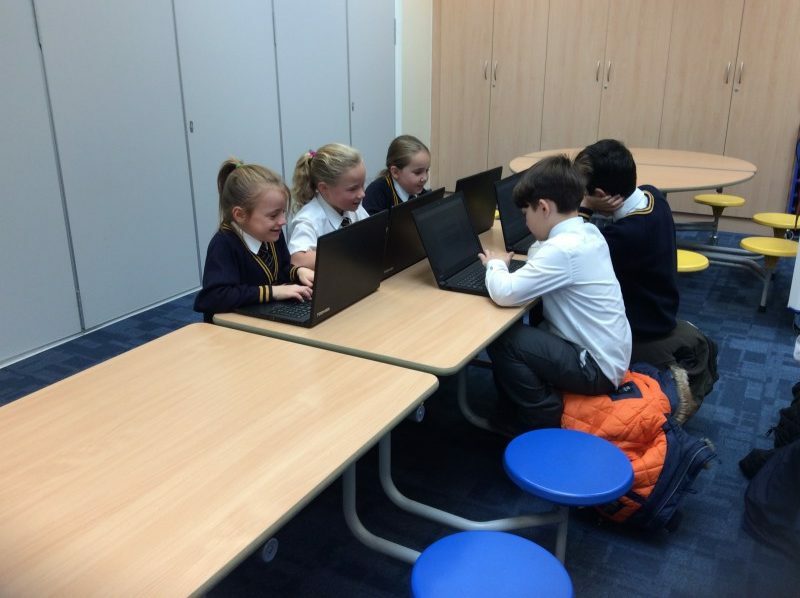 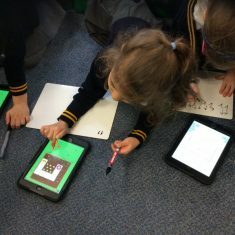 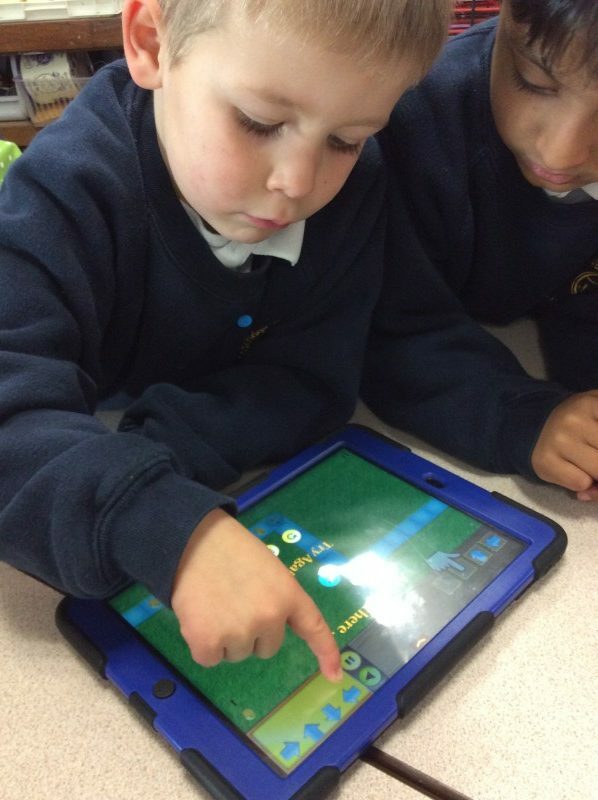 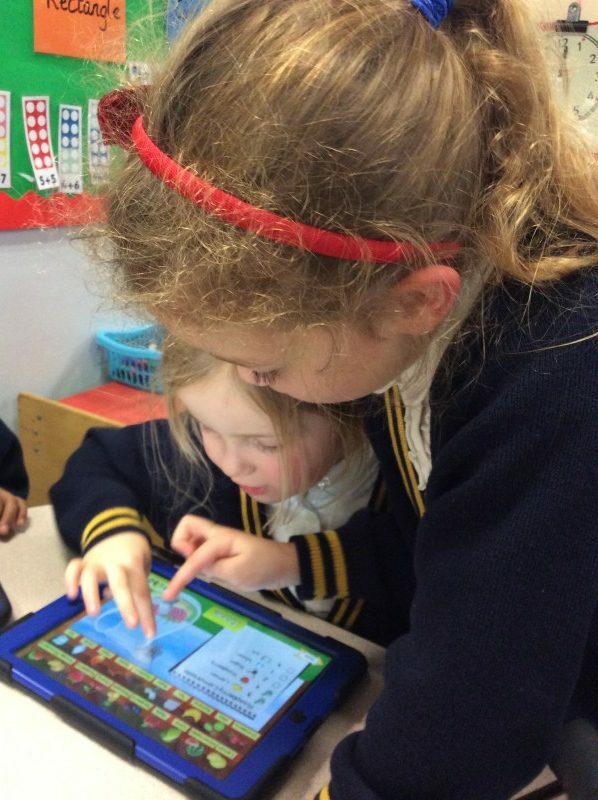 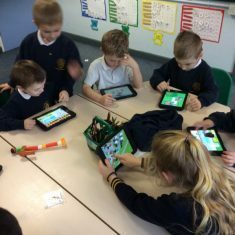 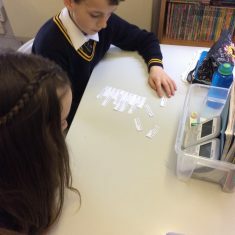 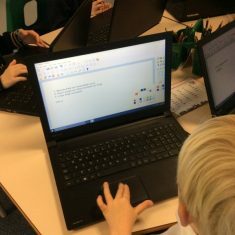 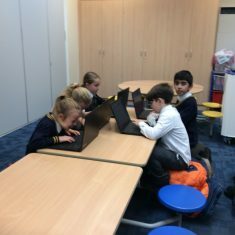 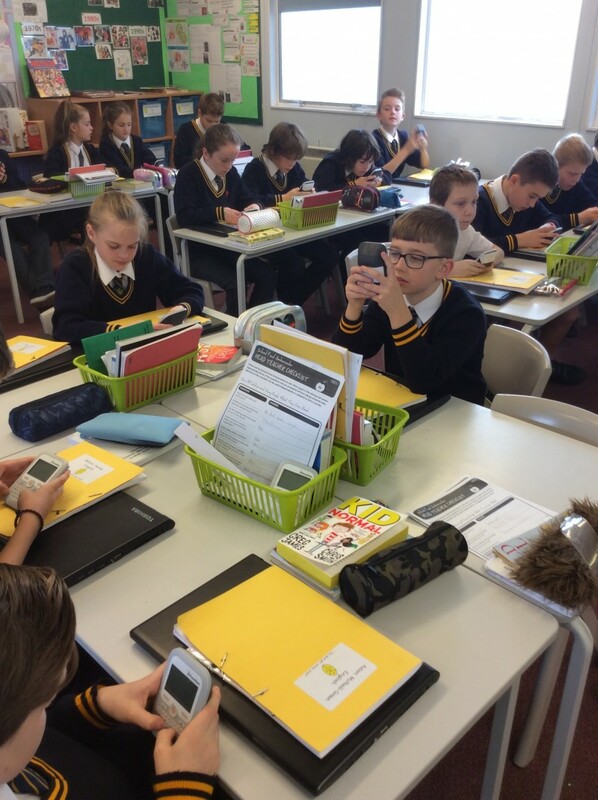 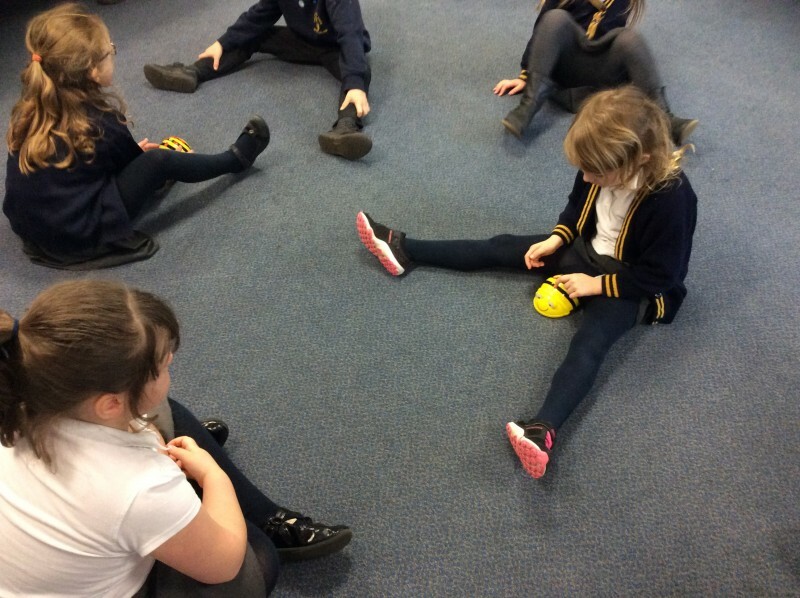 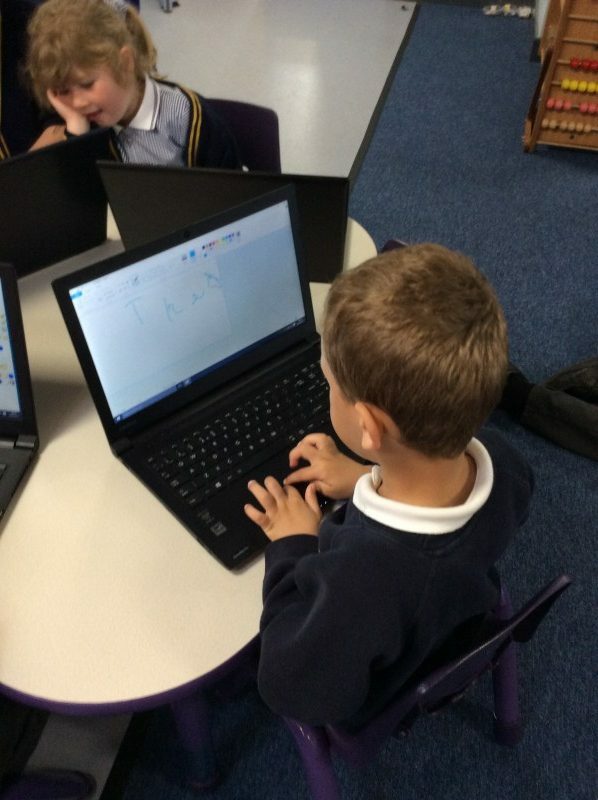 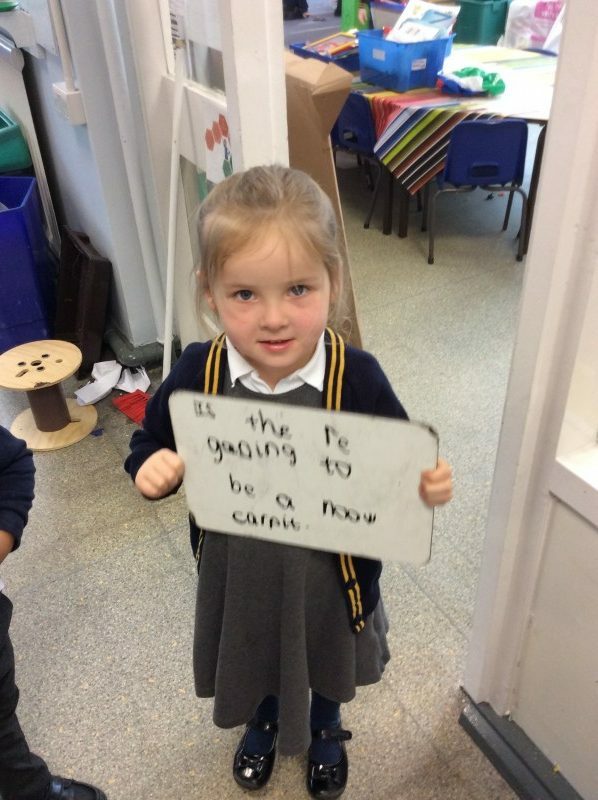 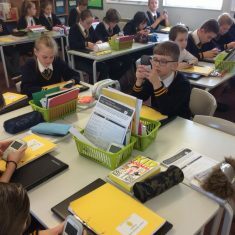 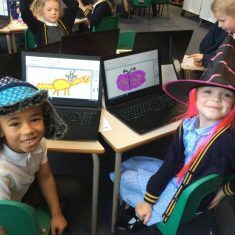 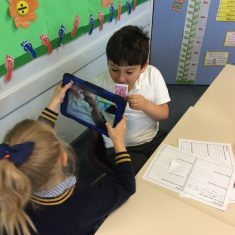 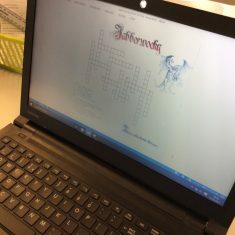 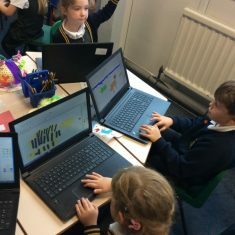 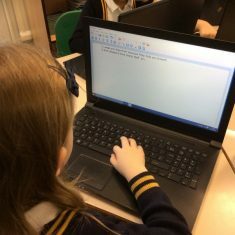 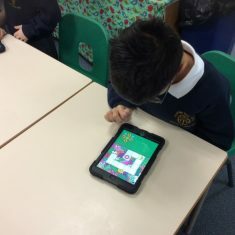 At Cookridge Holy Trinity Primary school we value the importance of Computing as an important life skill and it is a part of everyday life for us at Holy Trinity. 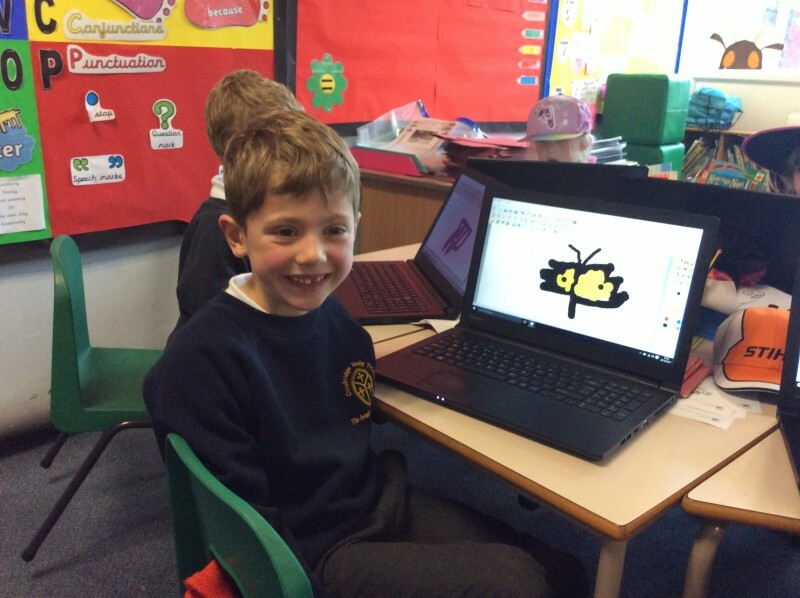 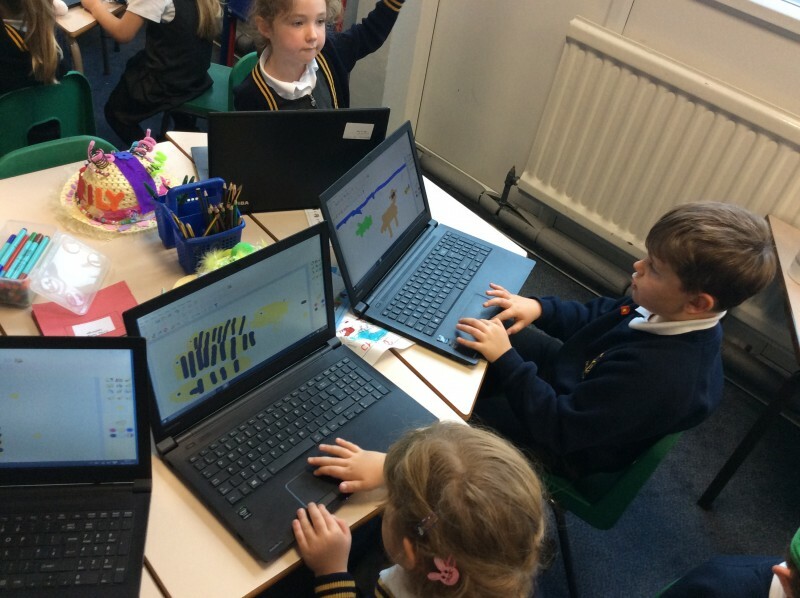 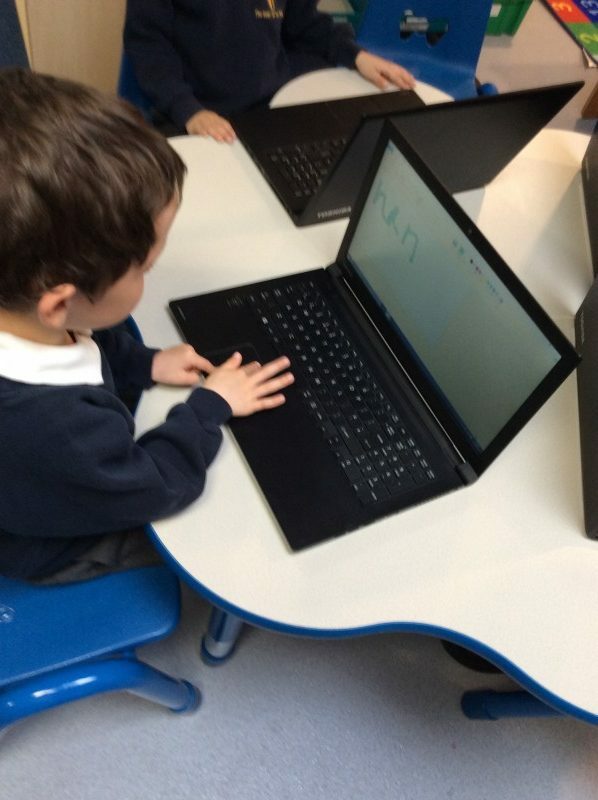 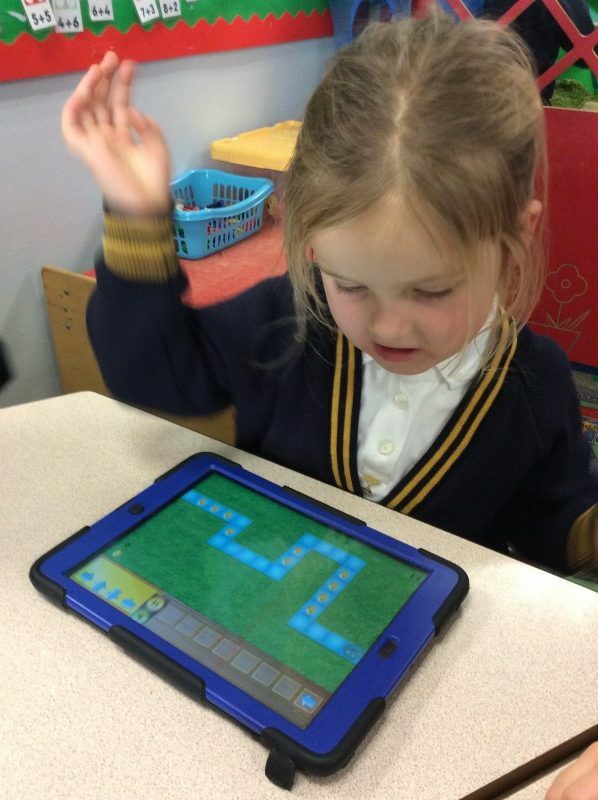 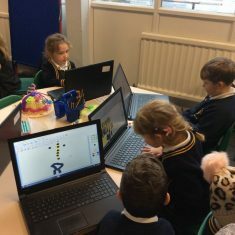 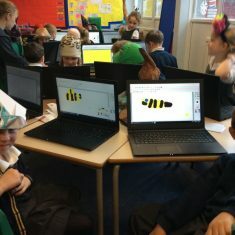 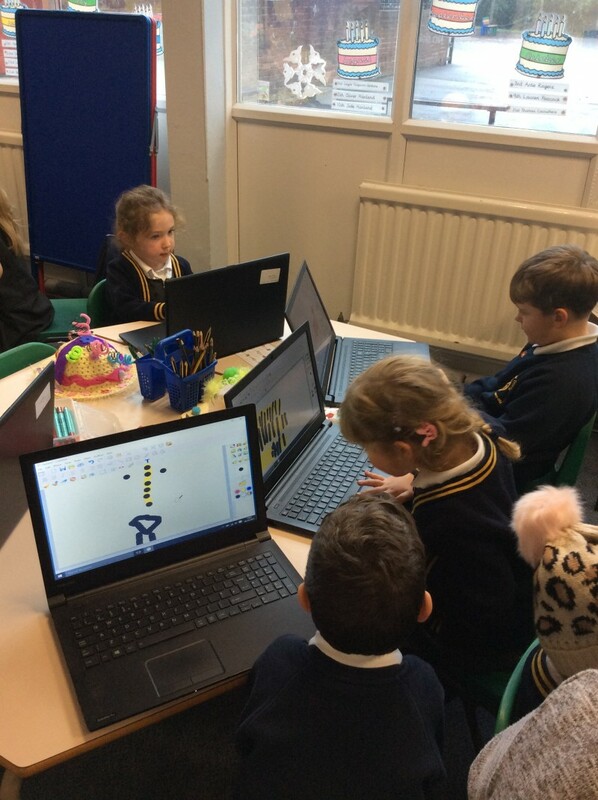 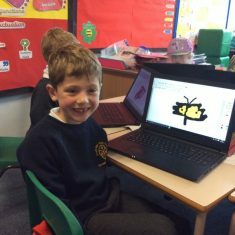 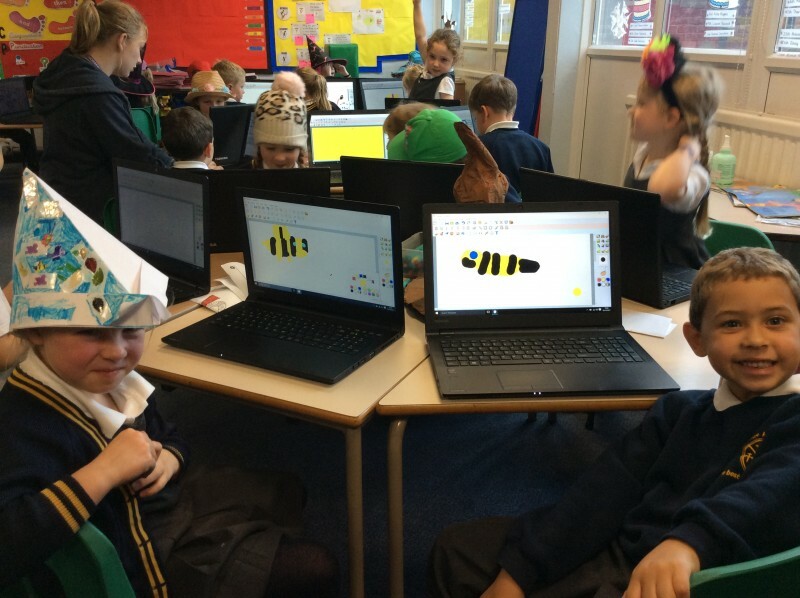 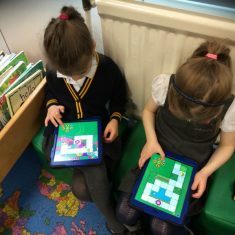 We are fortunate to have 30 children laptops, Ipads, Chromebooks, Beebots and Probots which allow us to learn vital IT skills in our computing lessons as well as enhancing our learning in other curriculum areas. 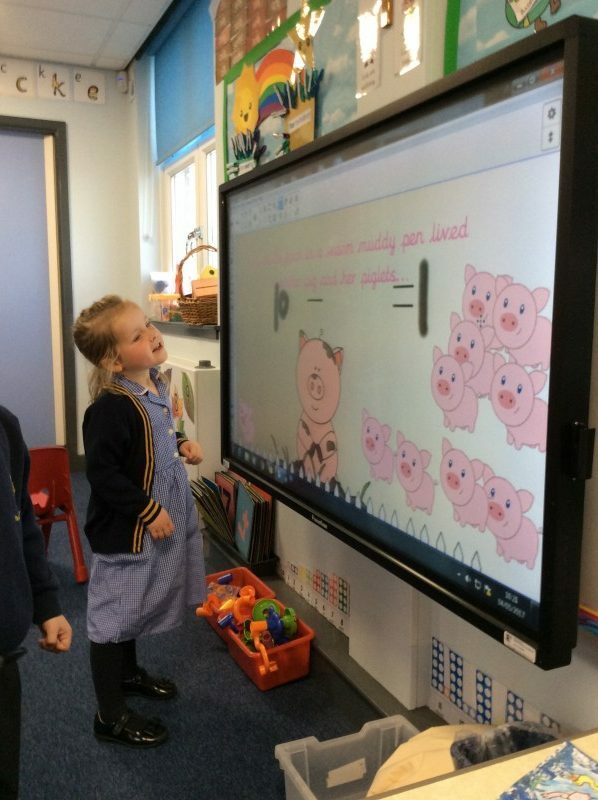 Computing is changing the lives of everyone. 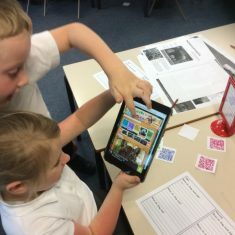 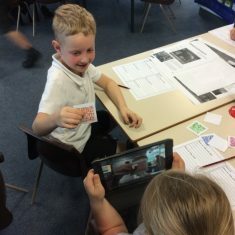 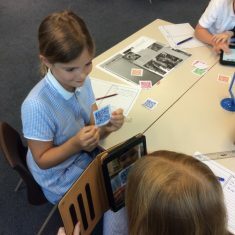 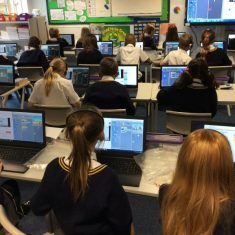 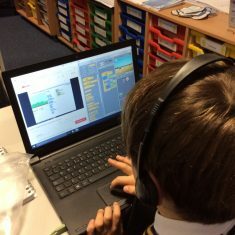 Through teaching Computing we equip children to participate in a rapidly-changing world where work and leisure activities are increasingly transformed by technology. 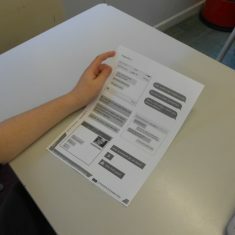 We enable them to find, explore, analyse, exchange and present information. 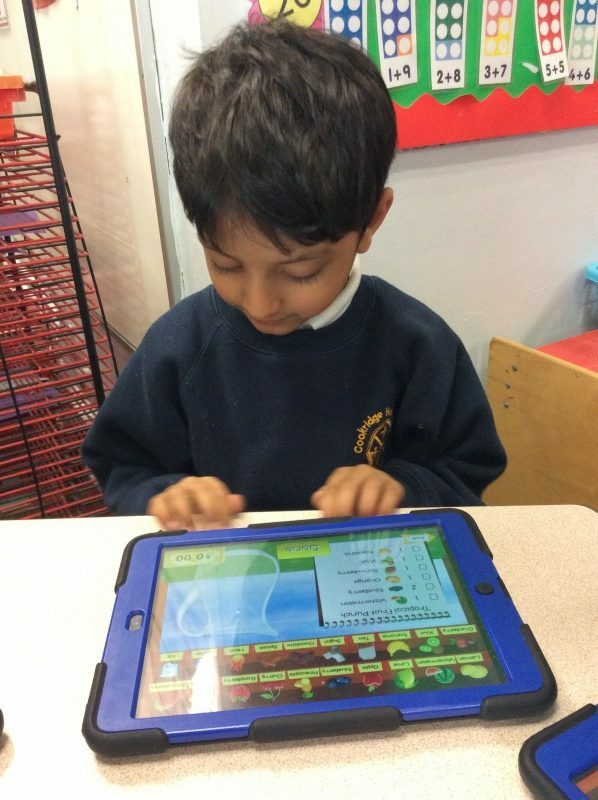 We also focus on developing the skills necessary for children to be able to use information in a discriminating and effective way. 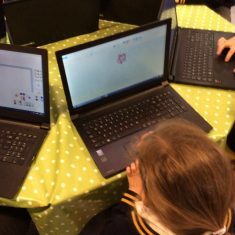 IT skills are a major factor in enabling children to be confident, creative and independent learners. 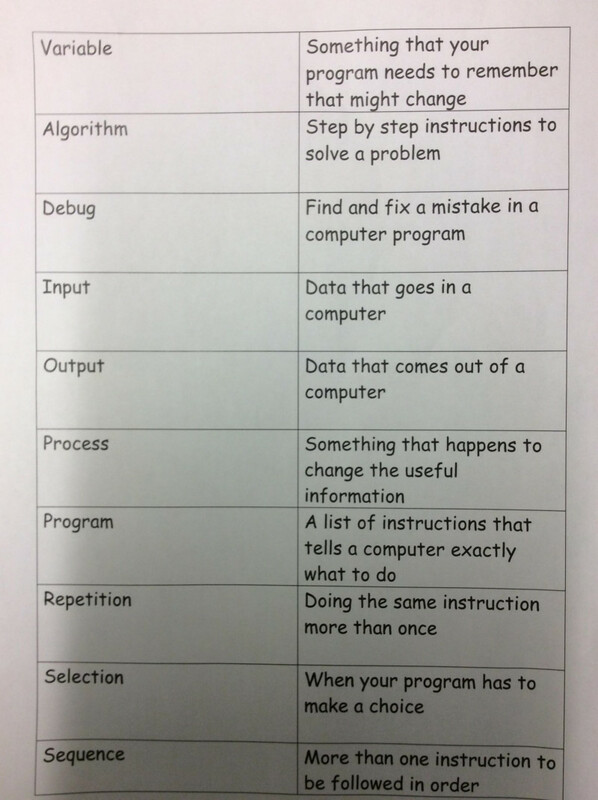 We teach Computing using the Chris Quigley Essentials scheme of learning. 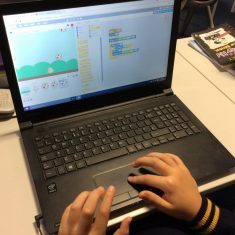 Competence in coding for a variety of practical and inventice purposes, including the application of ideas within other subjects. 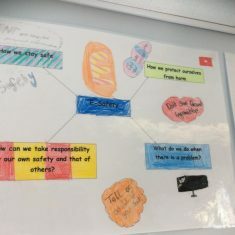 The ability to connect with others safely and respectfully, understanding the need to act within the law and with moral and ethical integrity. 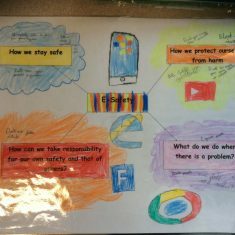 An understanding of the connected nature of devices. 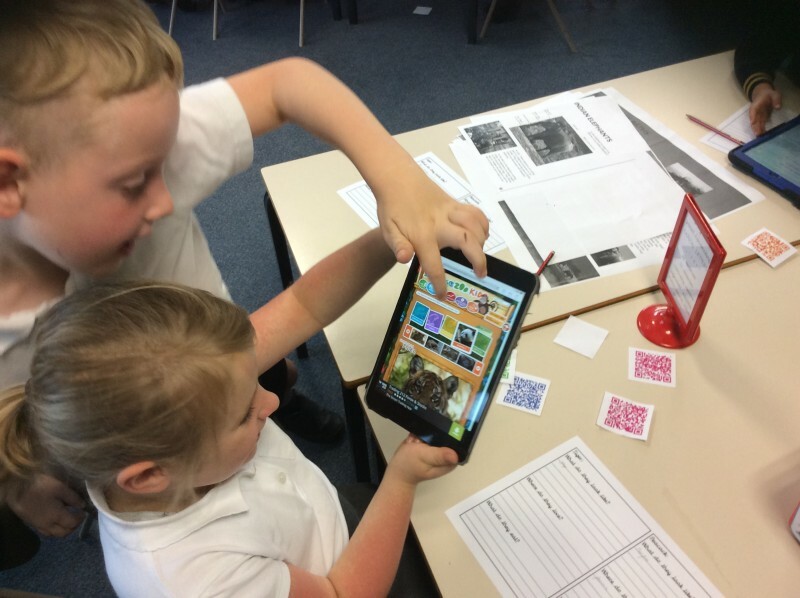 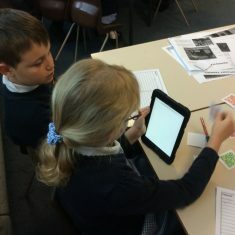 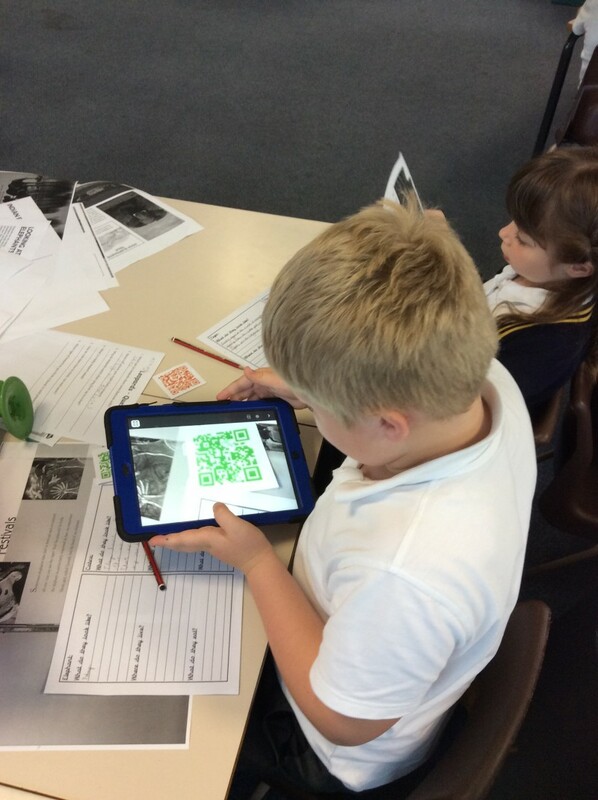 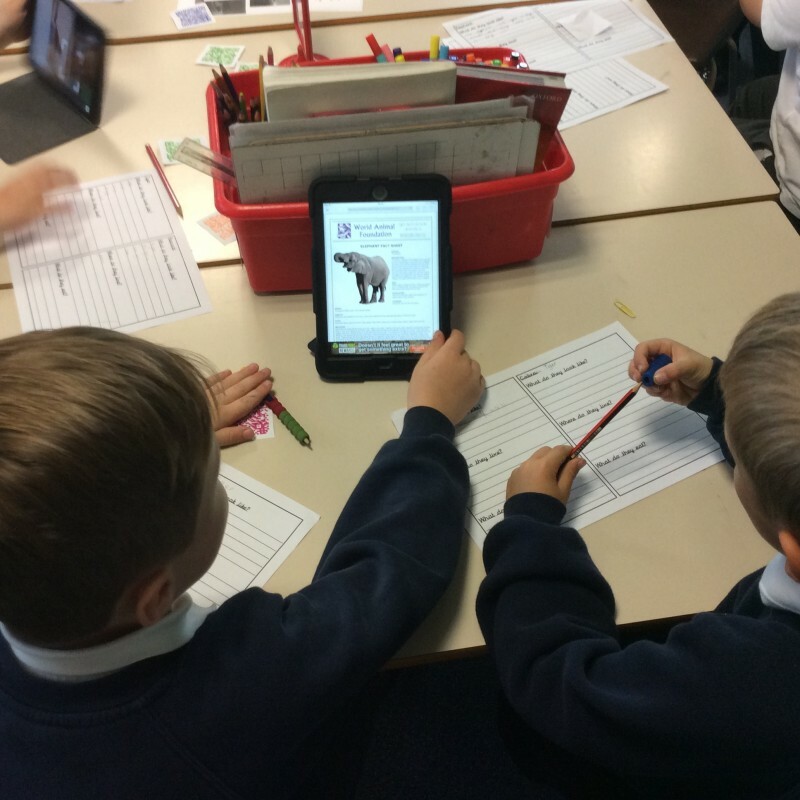 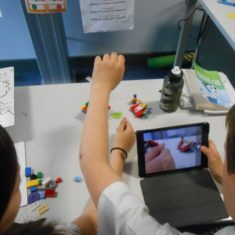 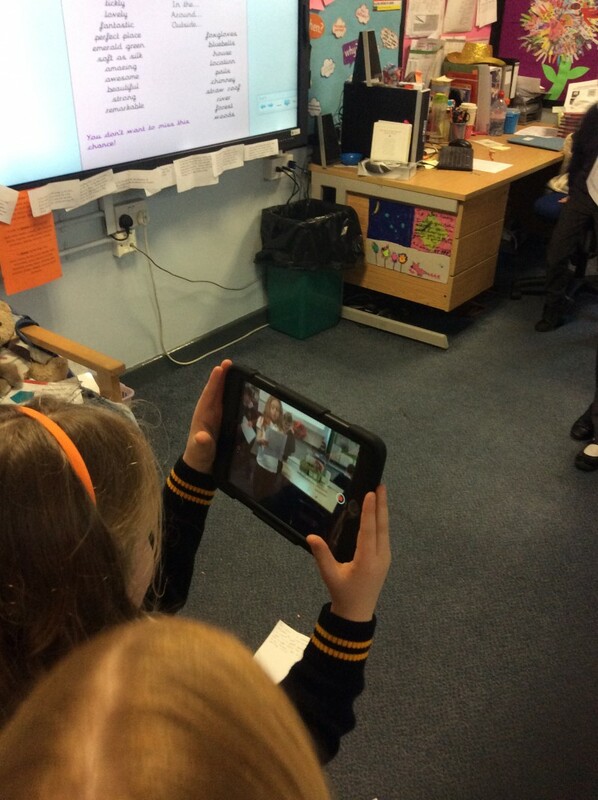 The ability to communicate ideas well by using applications and devices throughout the curriculum. 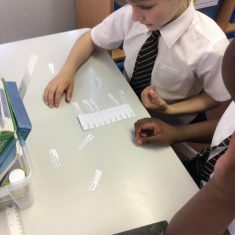 The ability to connect, organise and manipulate data effectively. 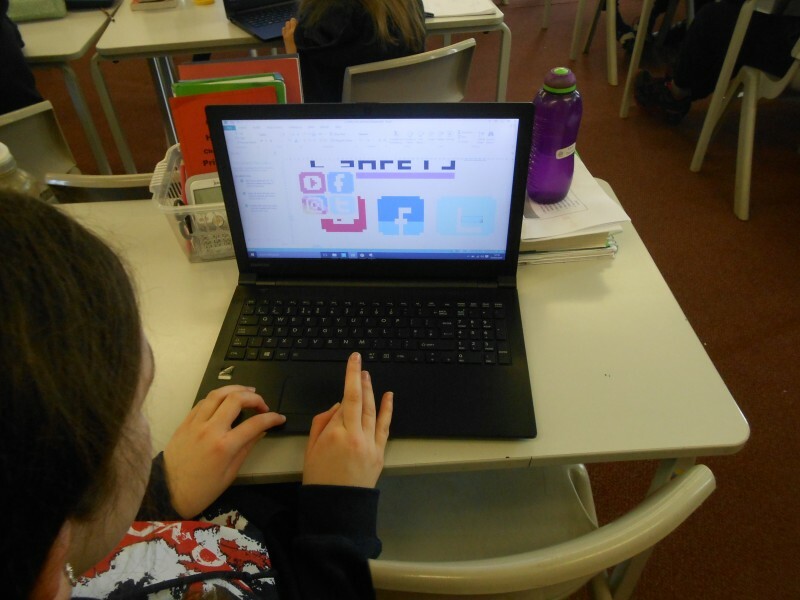 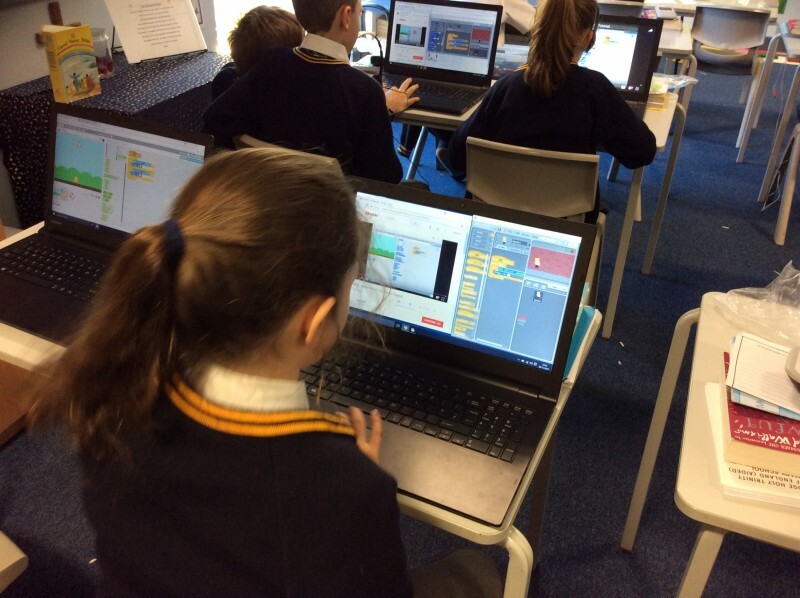 Programming – learn Scratch – it’s all the rage!! 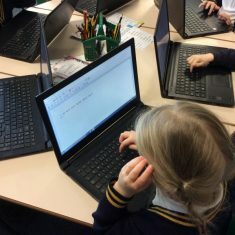 Want to be able type faster? 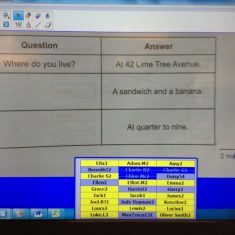 Try this!! 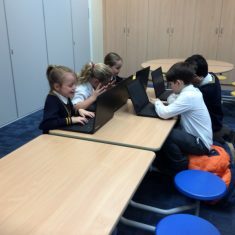 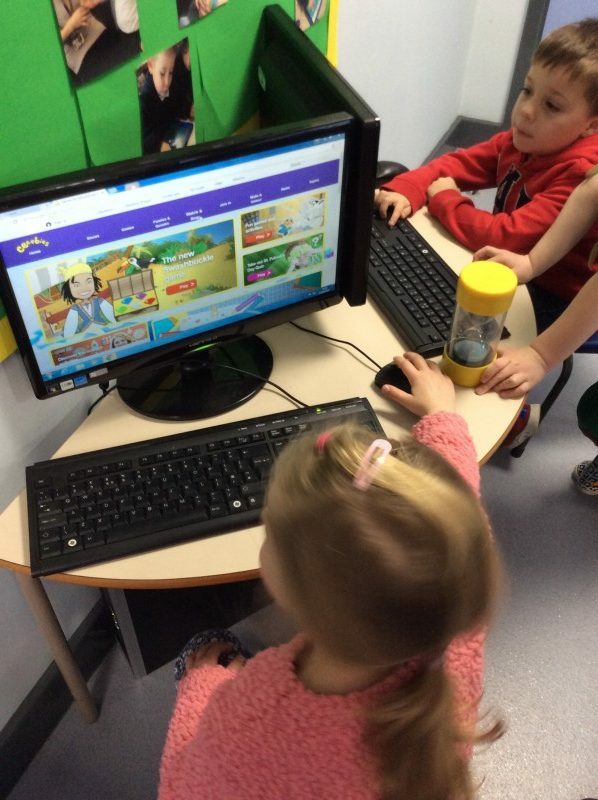 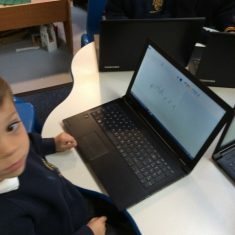 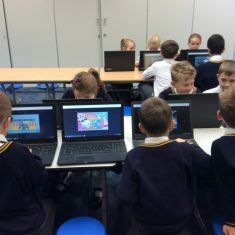 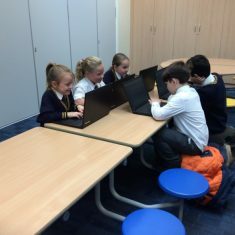 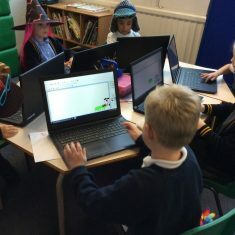 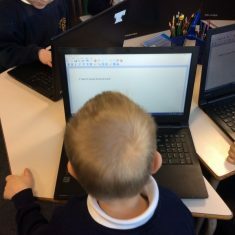 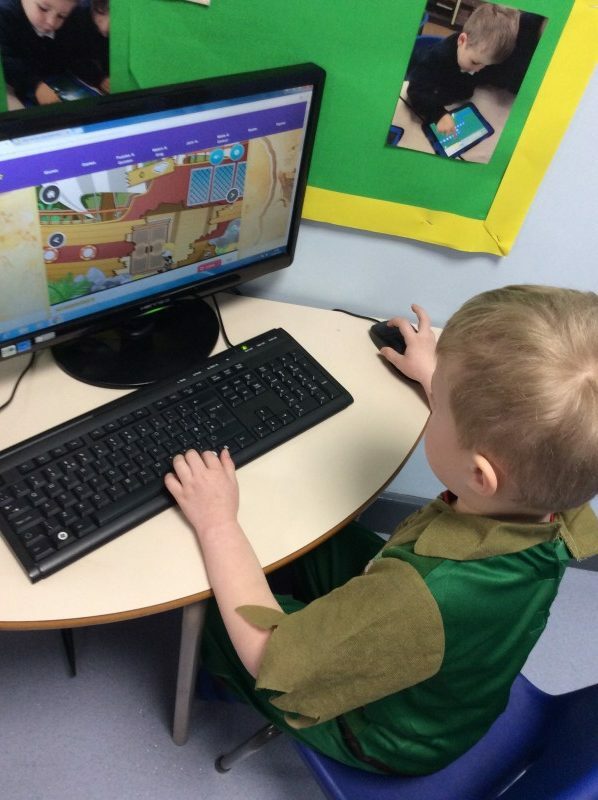 Children are introduced to technology using the class computers, using age appropriate software. 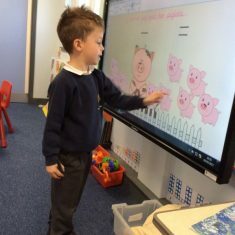 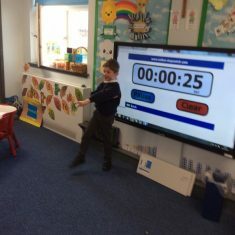 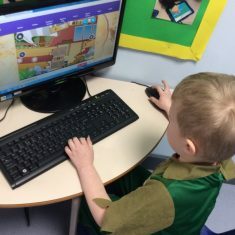 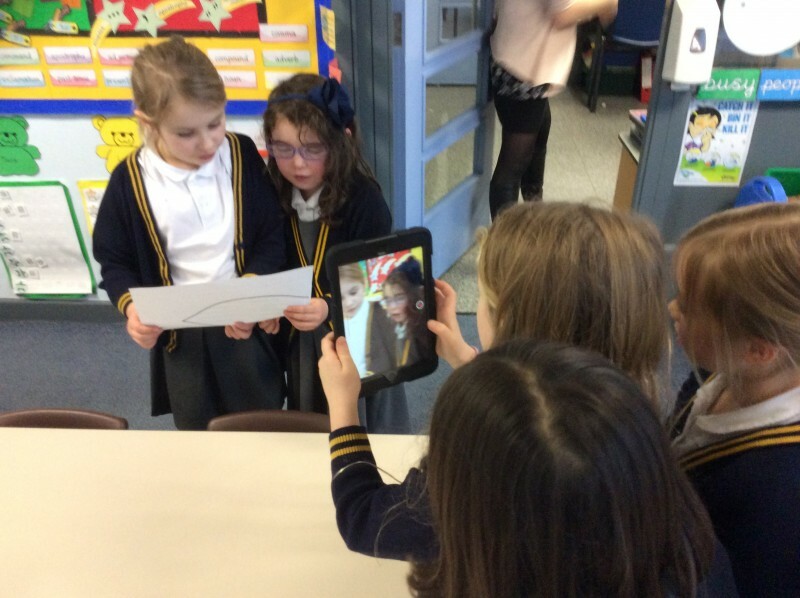 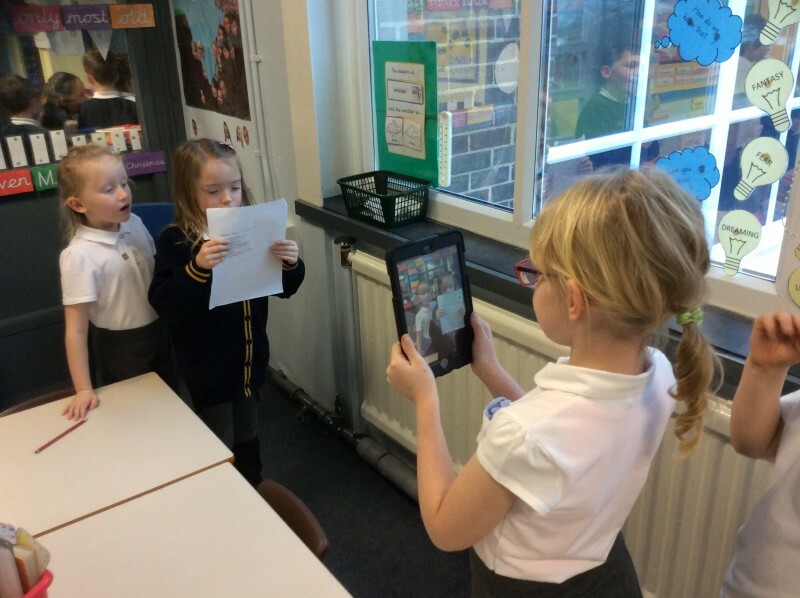 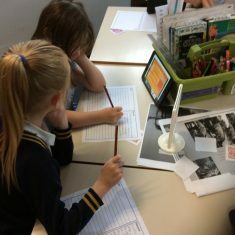 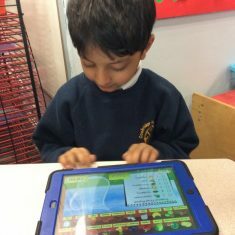 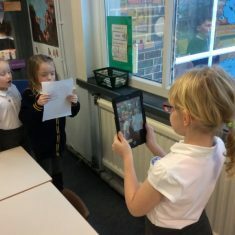 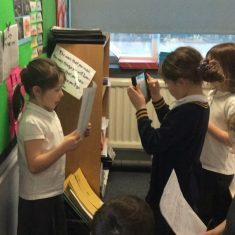 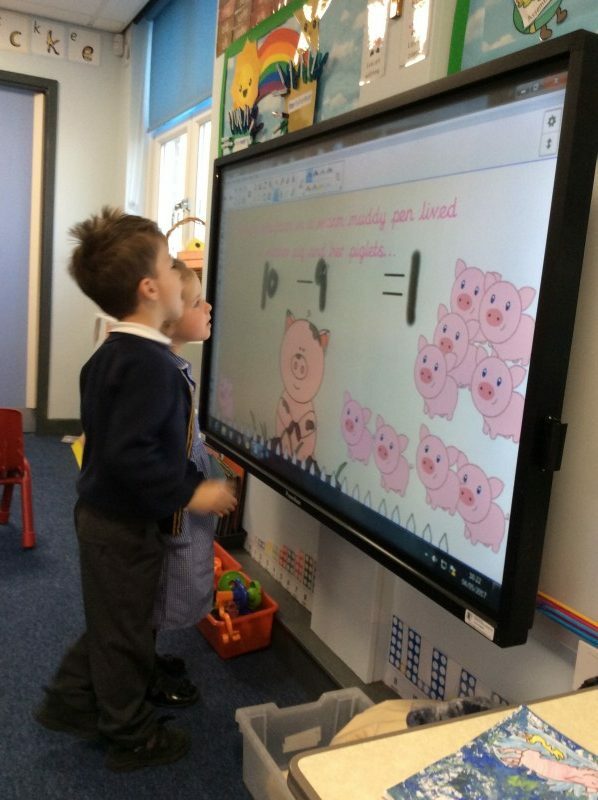 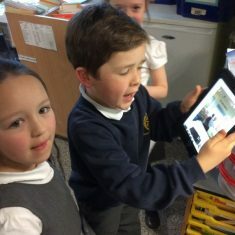 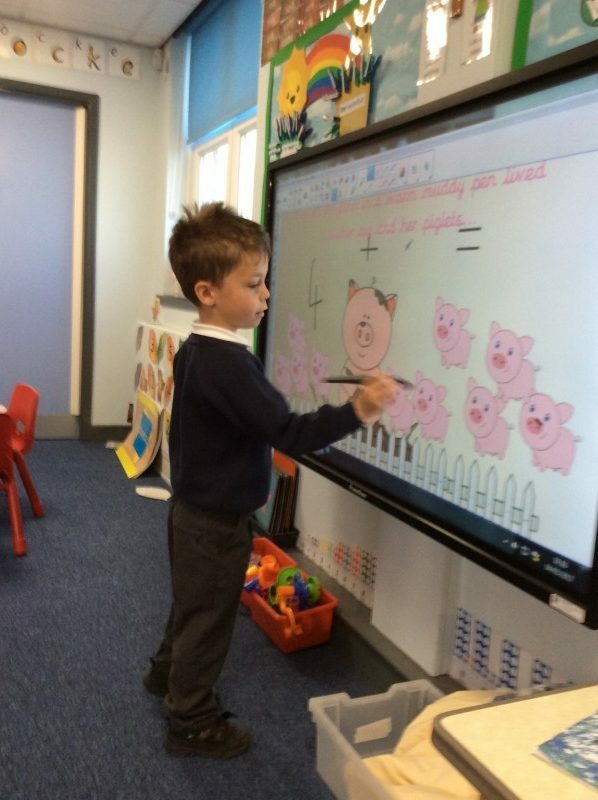 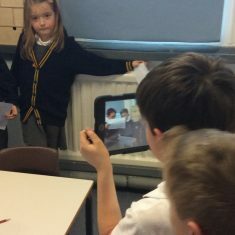 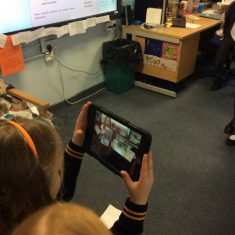 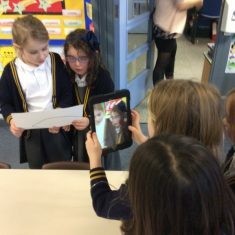 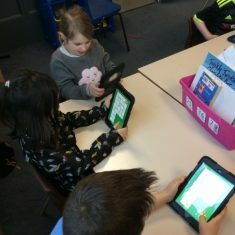 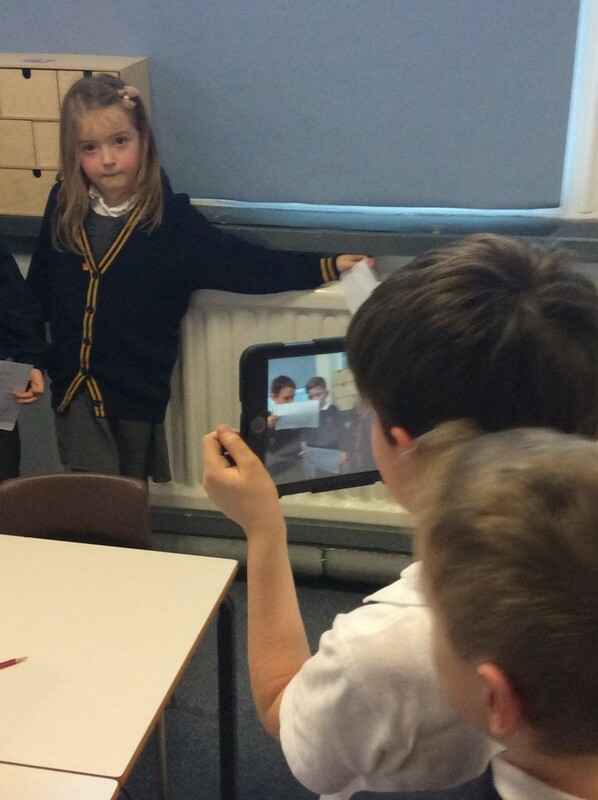 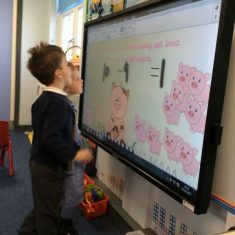 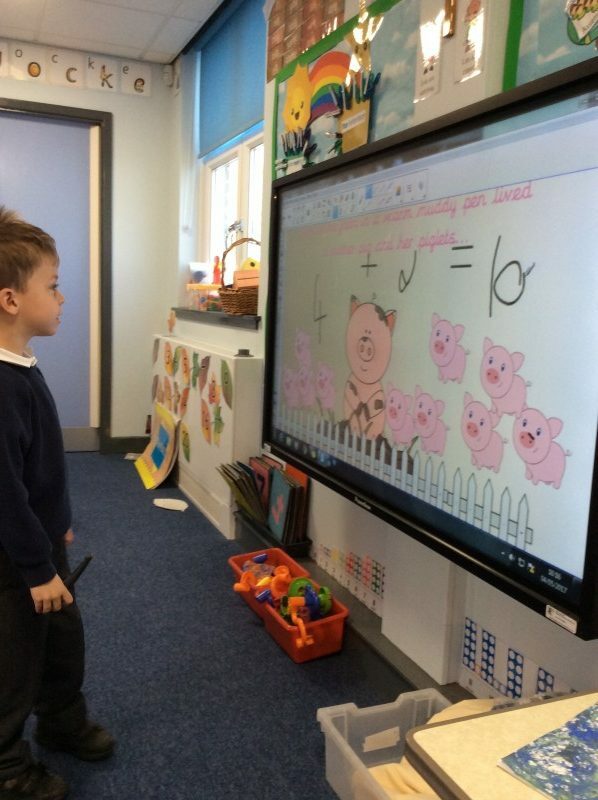 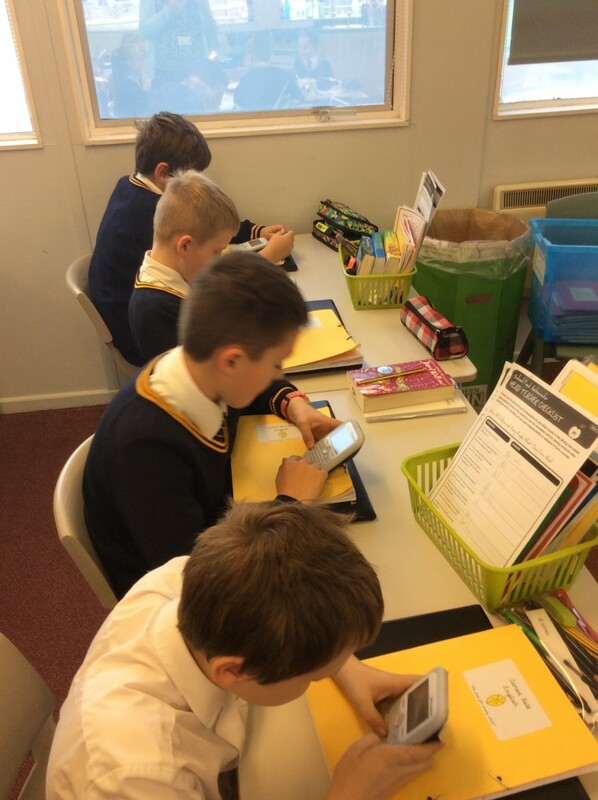 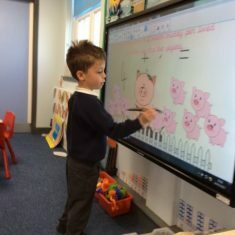 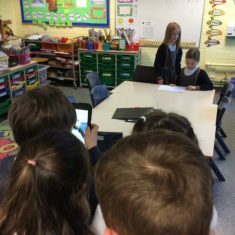 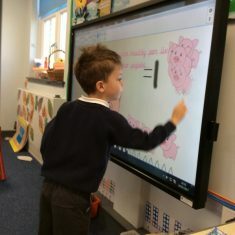 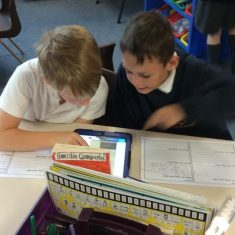 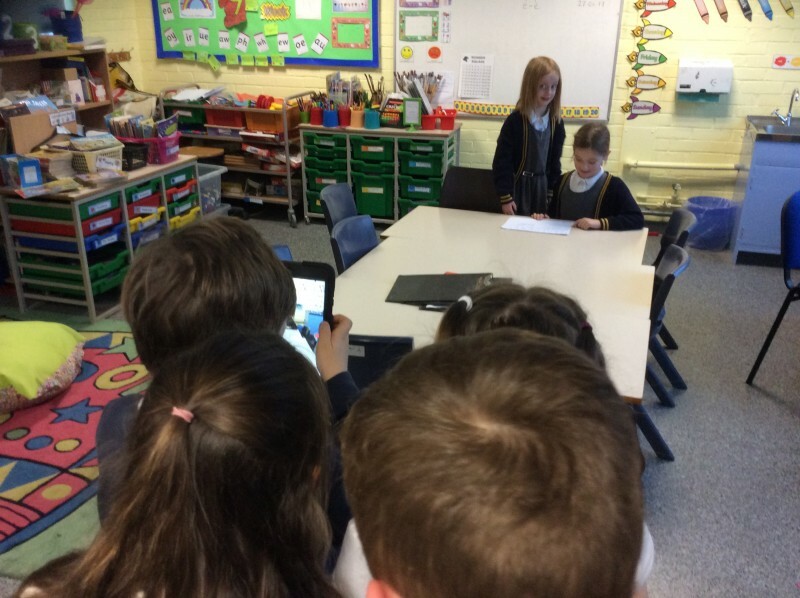 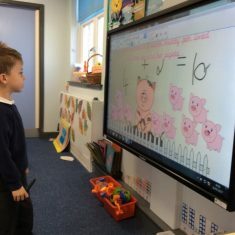 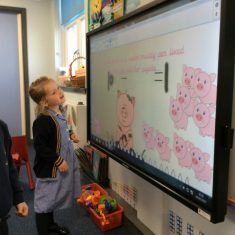 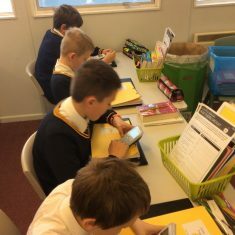 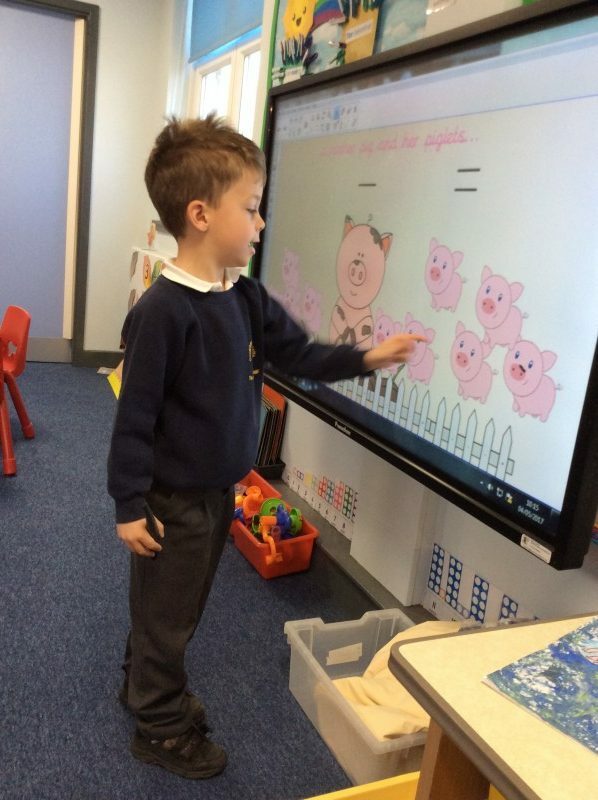 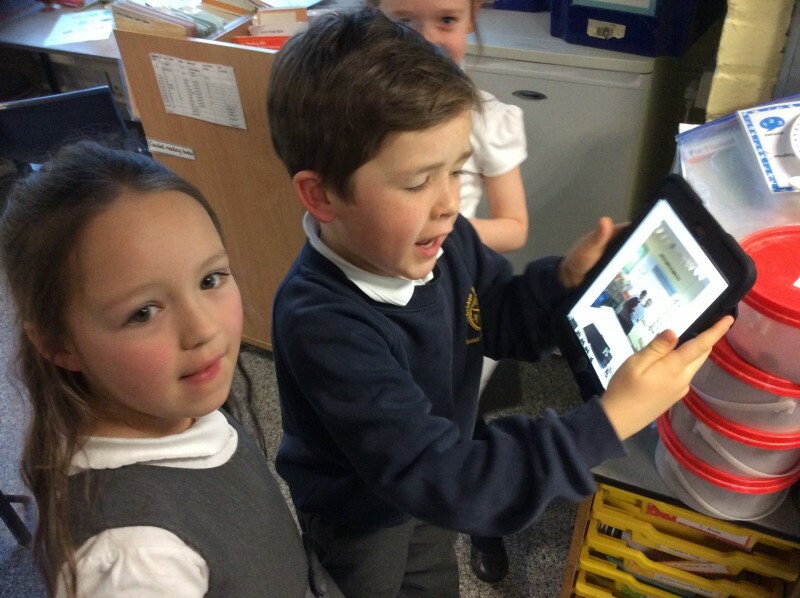 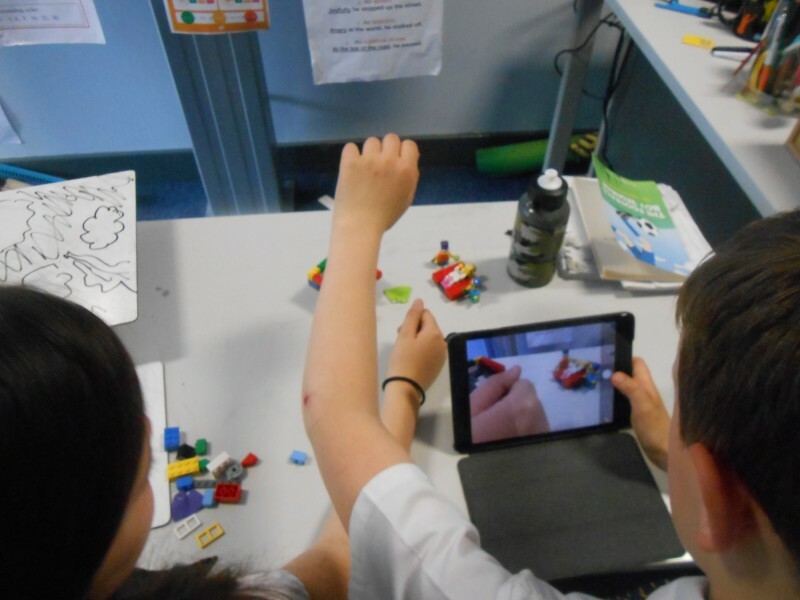 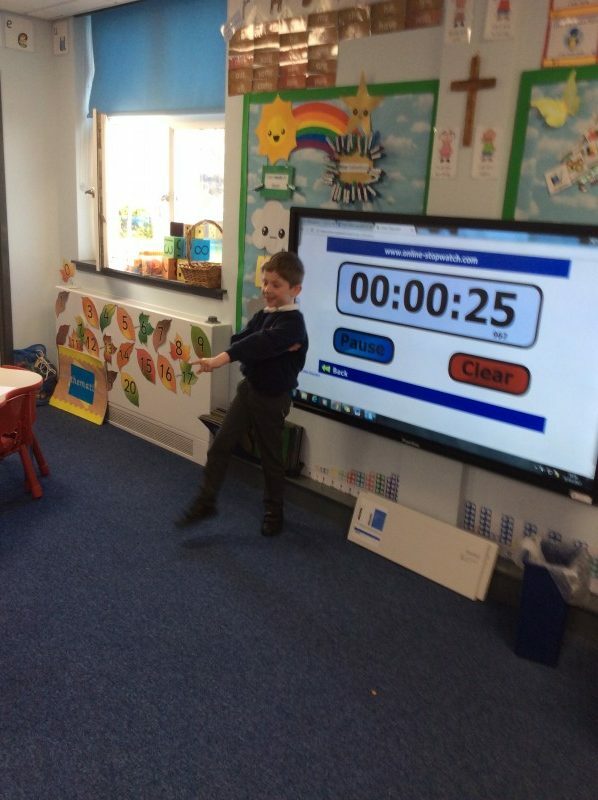 The children have access to Ipads, CD players, touch screen Promethean boards, easi-phones, remote control cars, microphones/karaoke machine and torches in their provision. 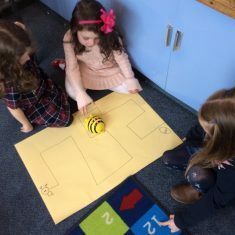 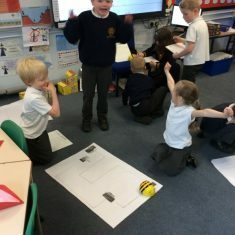 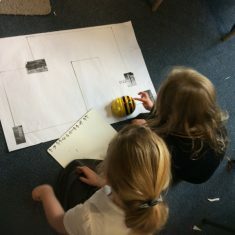 During the year, the children are then exposed to bee-bots and early programming. 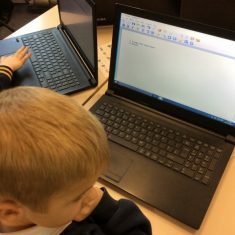 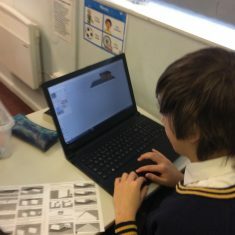 During their final term, they are taught how to log onto a laptop, create and print a piece of work with support from the Year 6 children. 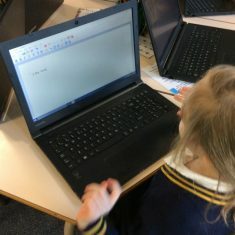 Children are taught how to log on to the laptops and start using programs eg Textease for purpose. 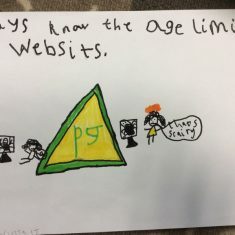 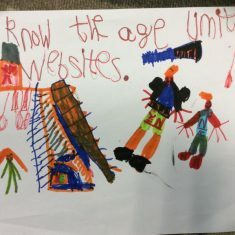 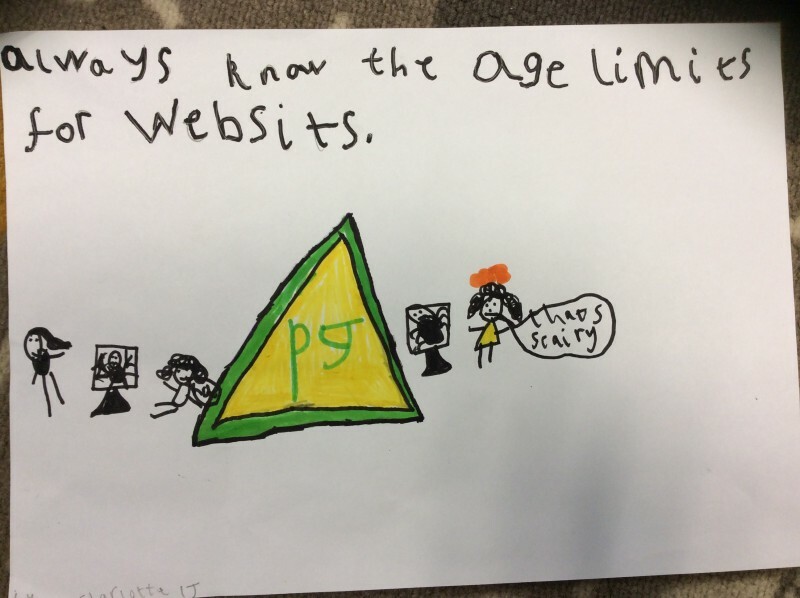 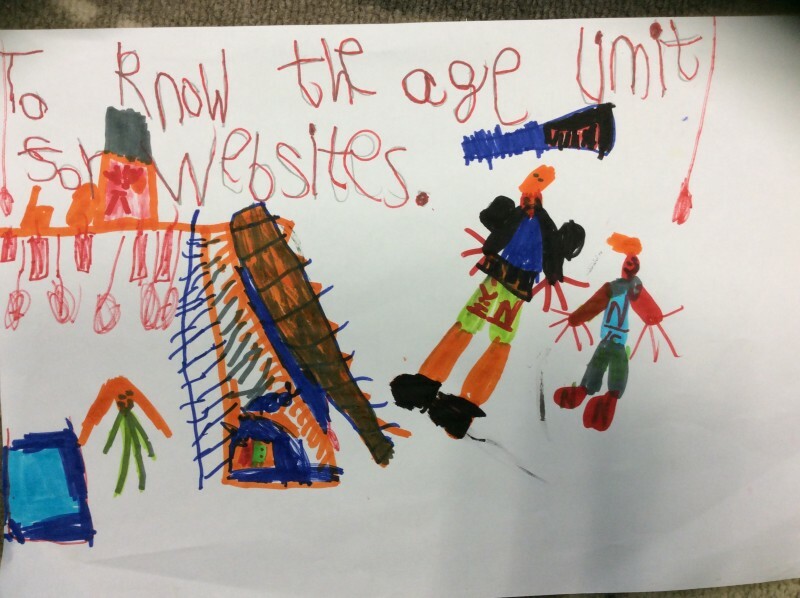 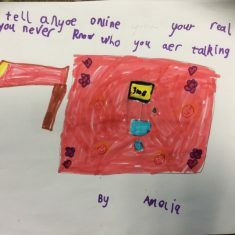 They are taught about keeping safe online and the age rules of sites. 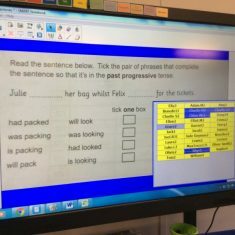 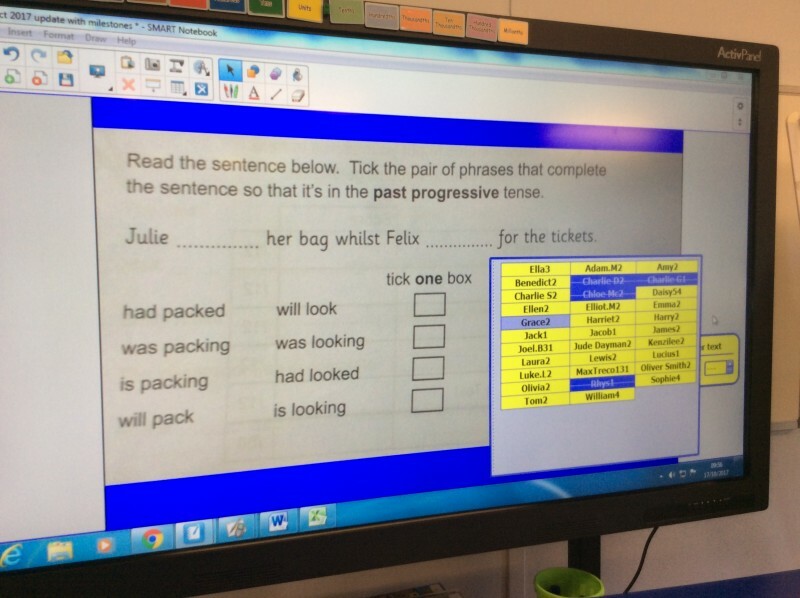 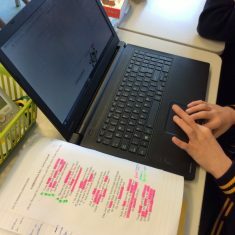 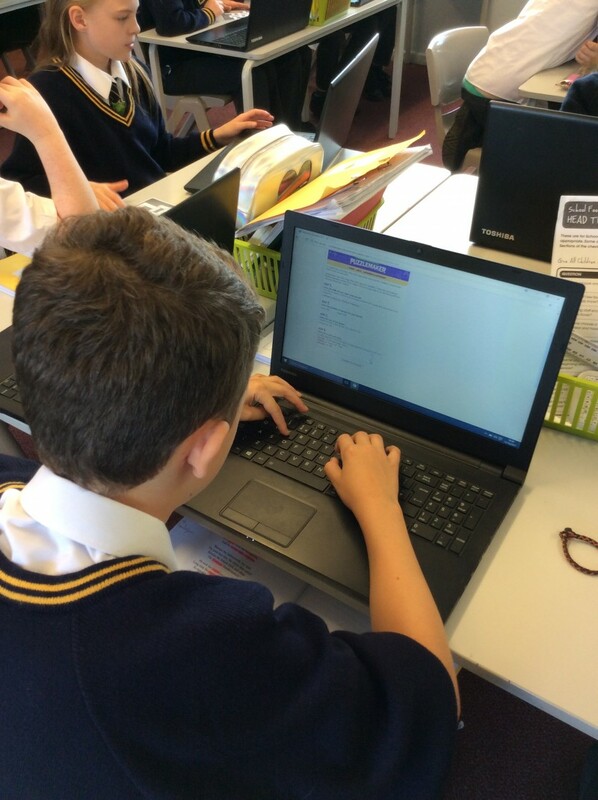 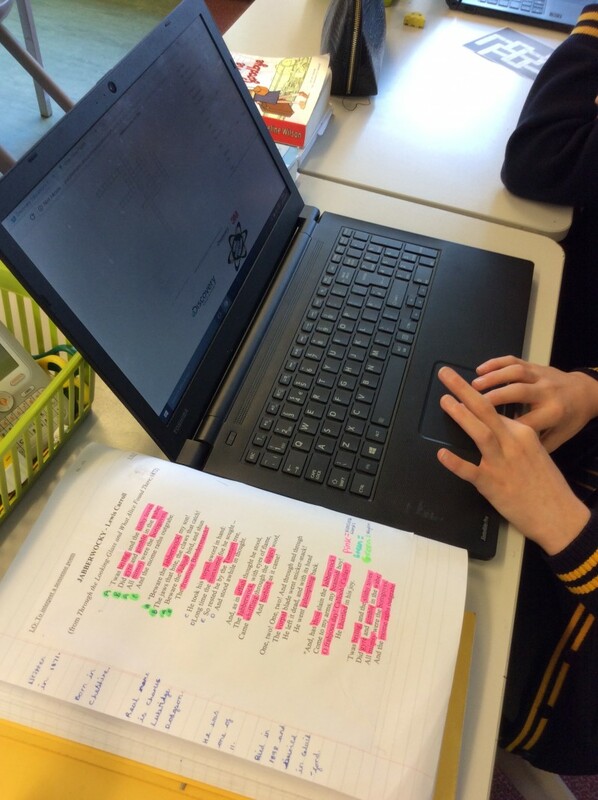 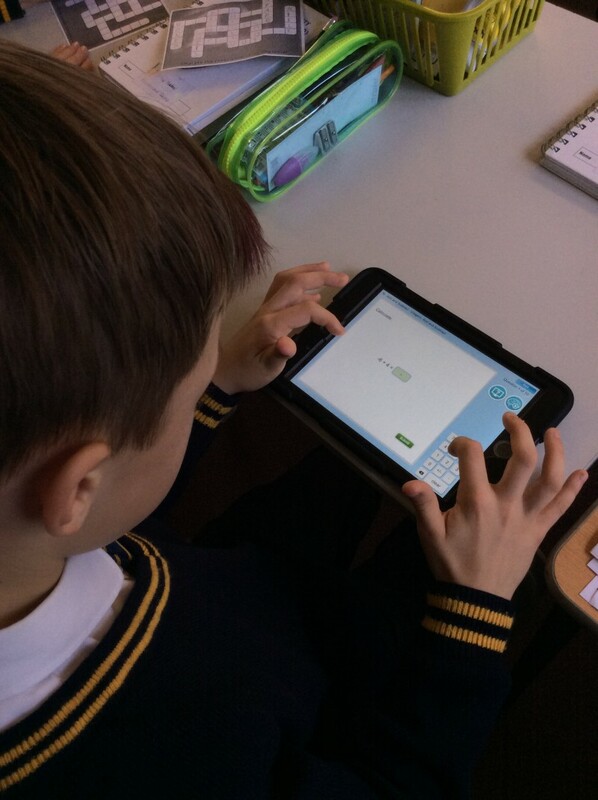 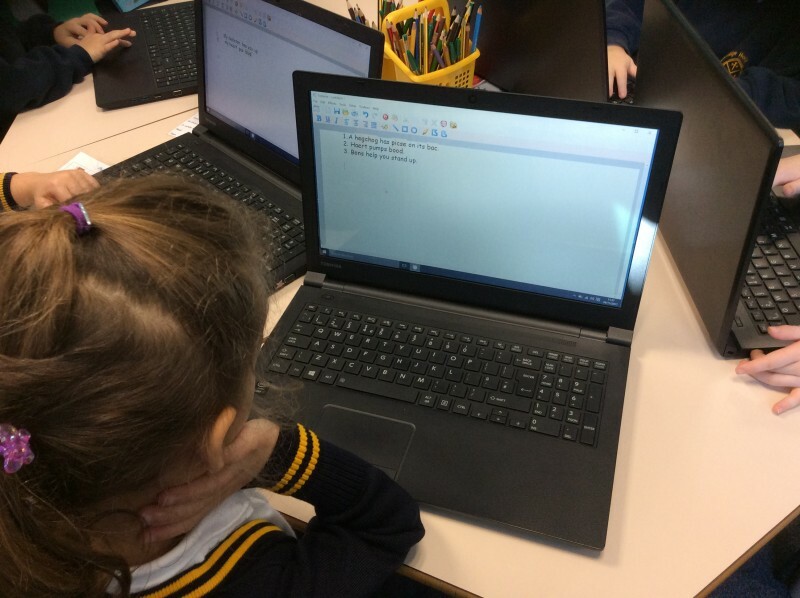 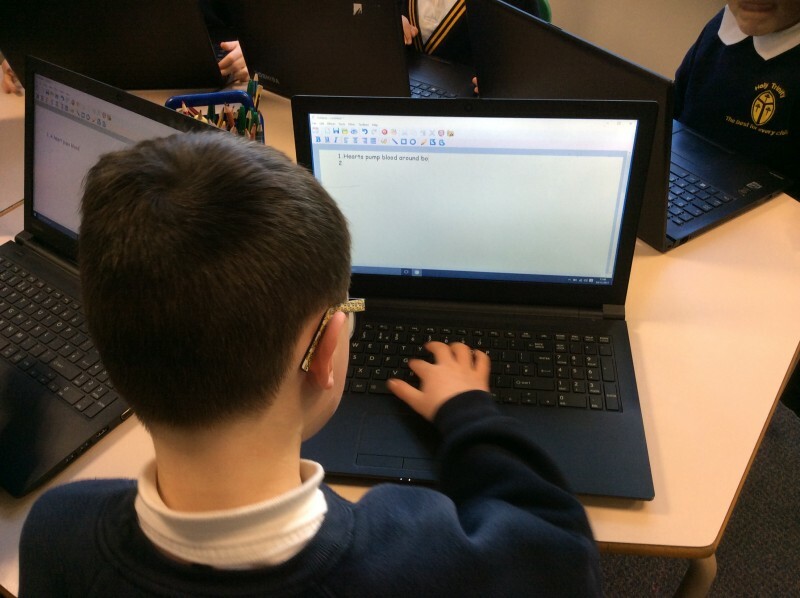 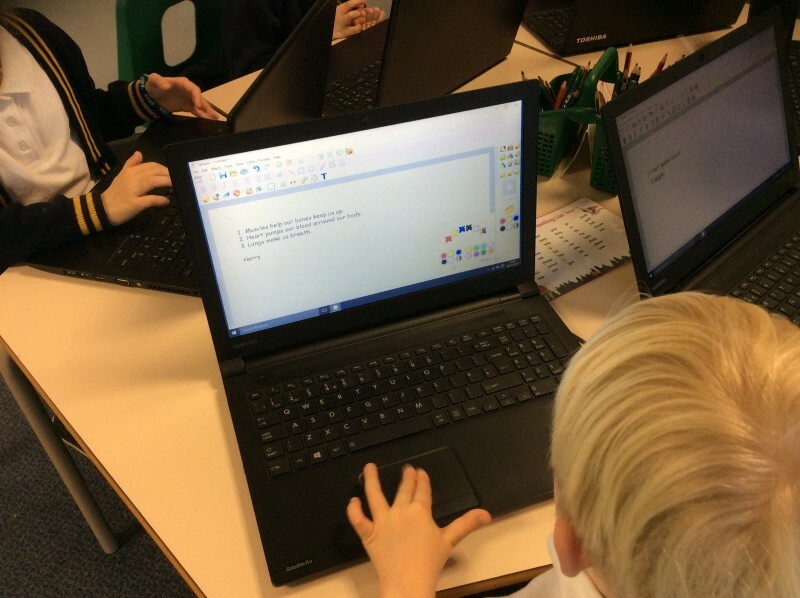 During the Spring term, they practise their typing skills using word to save, edit and retrieve their work. 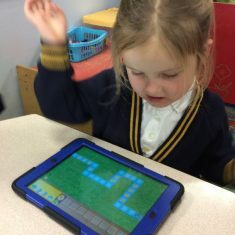 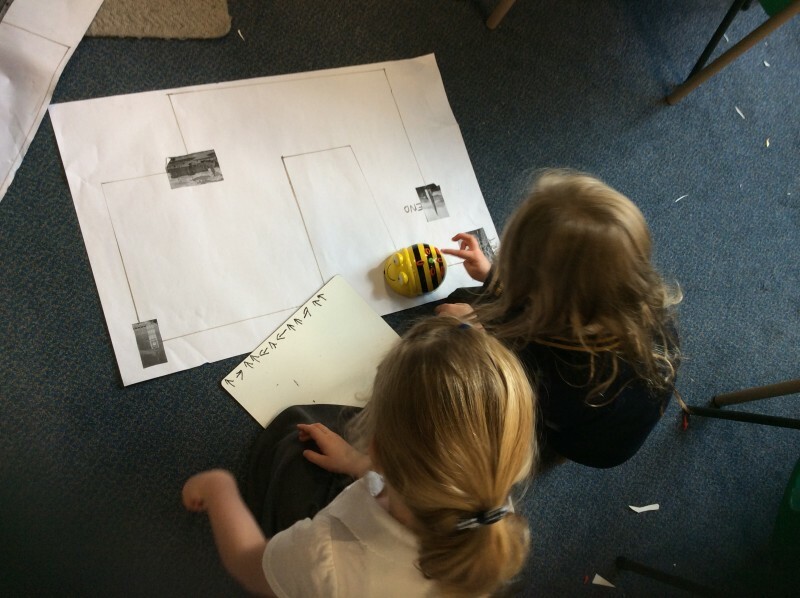 During the Summer term, Year One children are exposed to simple data collecting and introduced to algorithms. 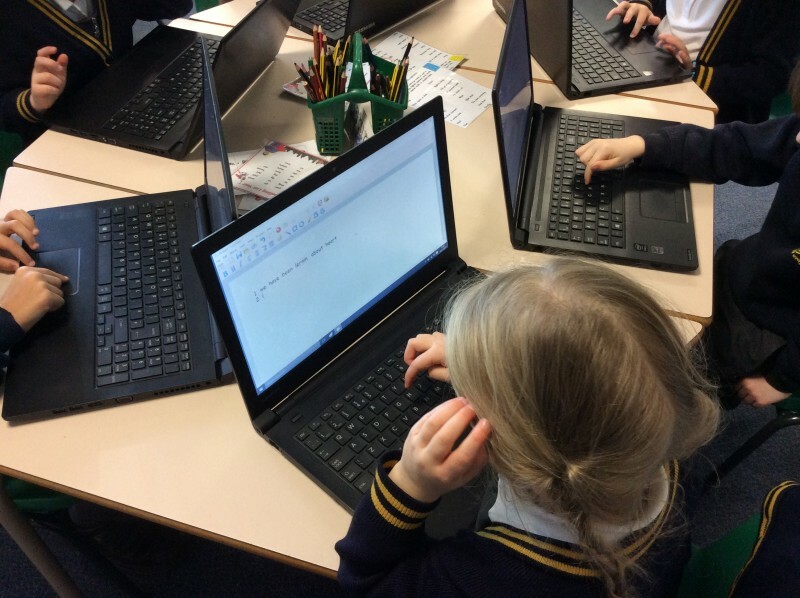 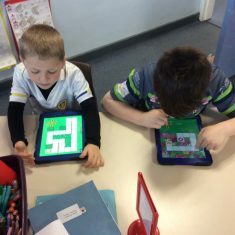 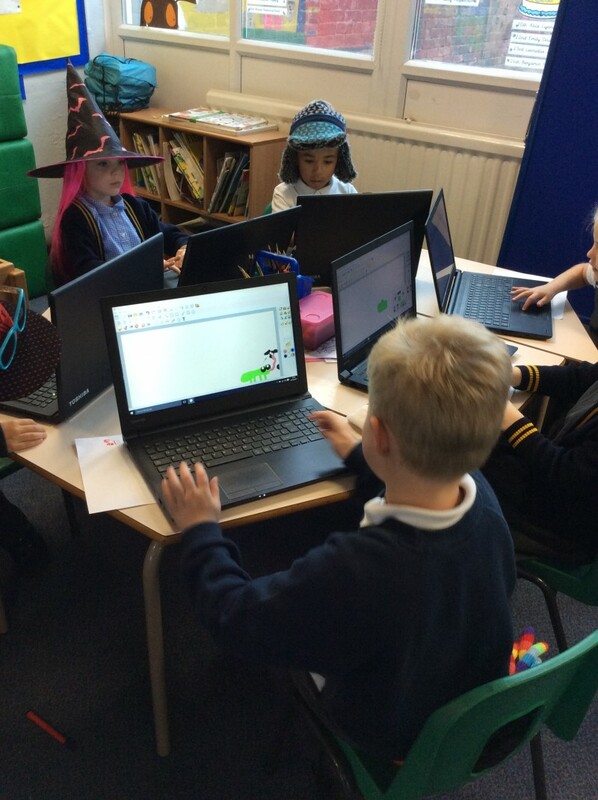 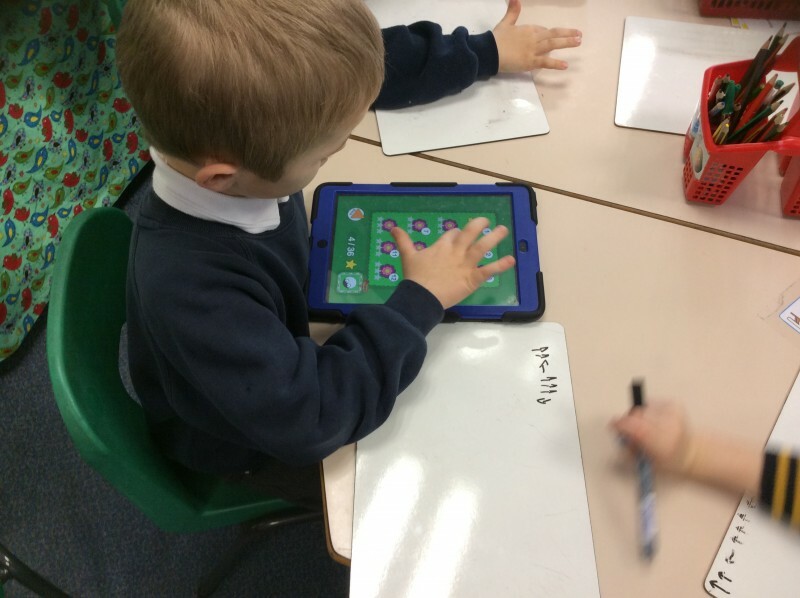 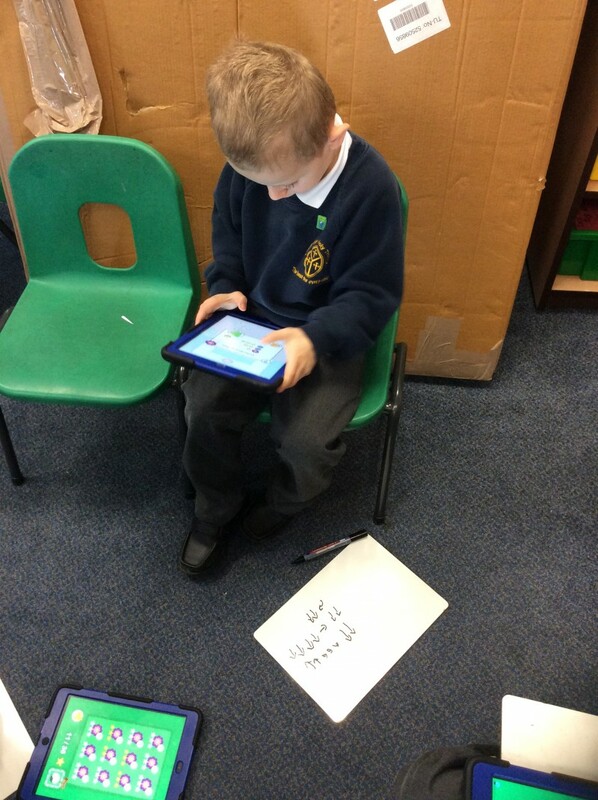 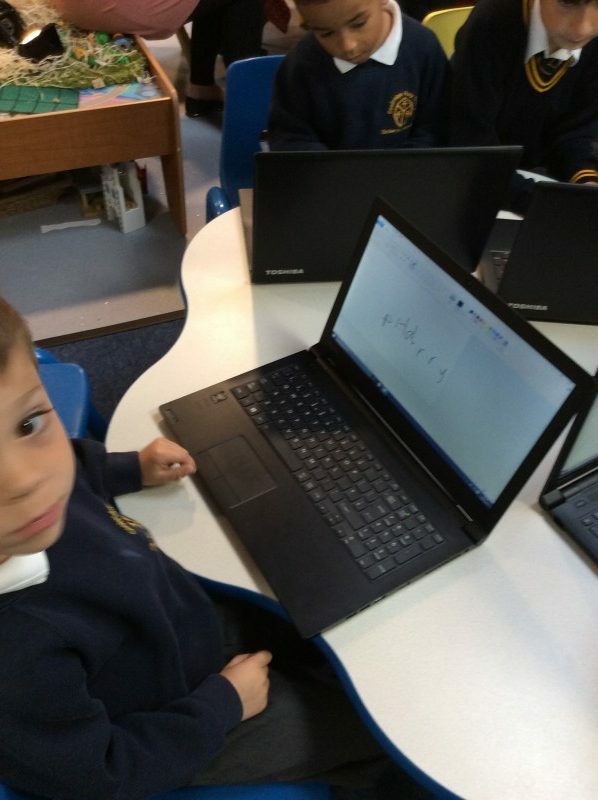 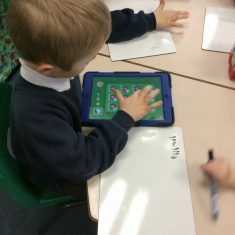 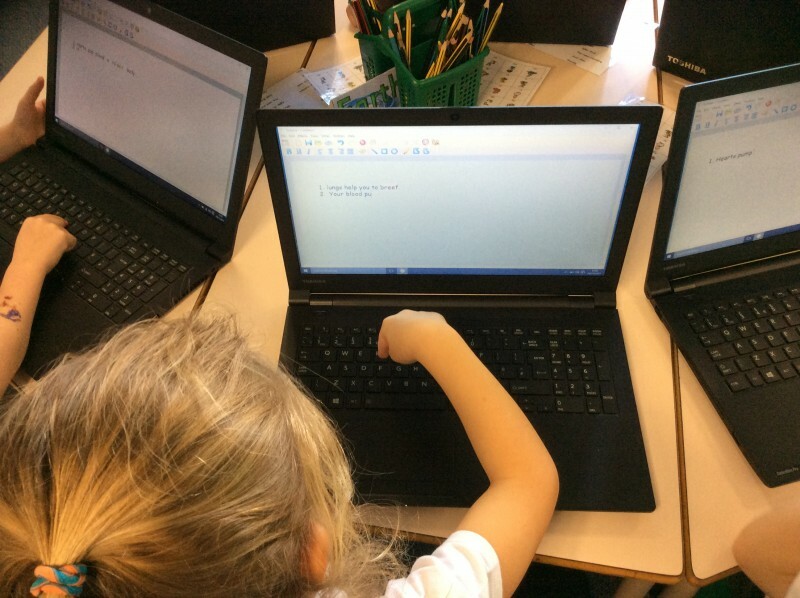 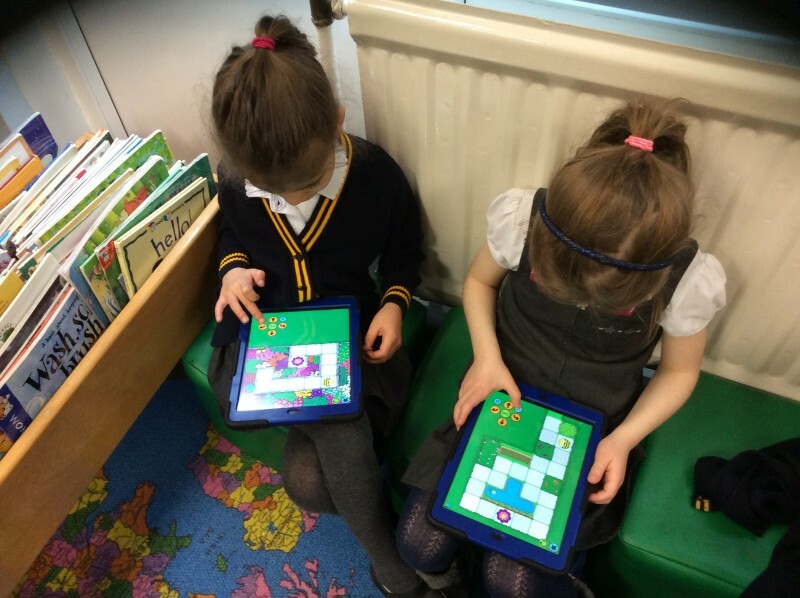 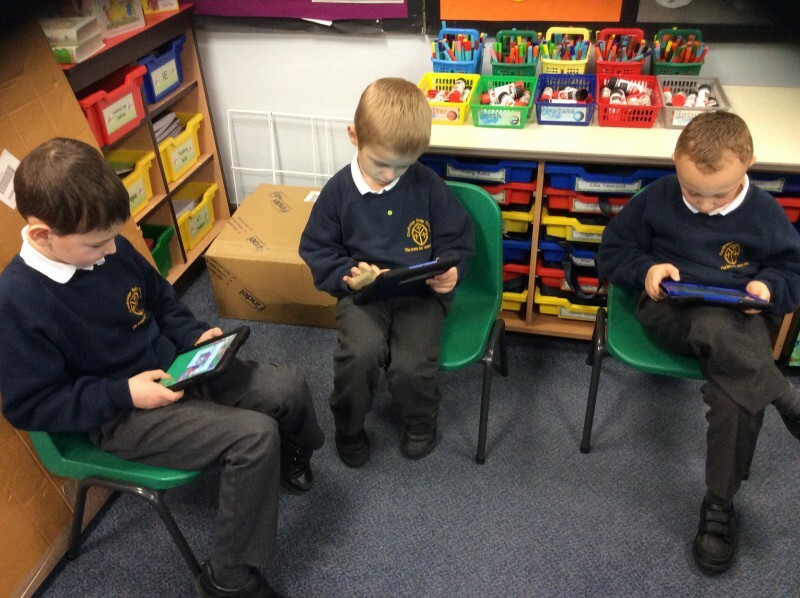 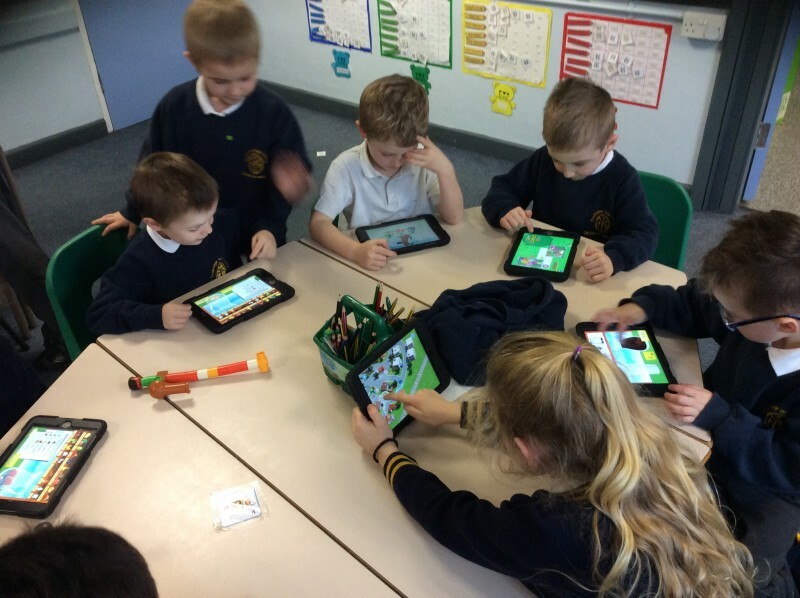 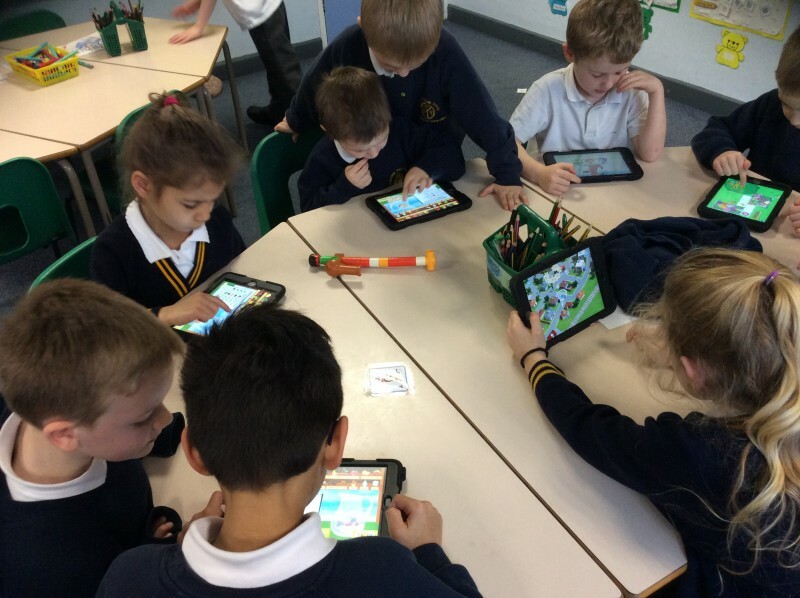 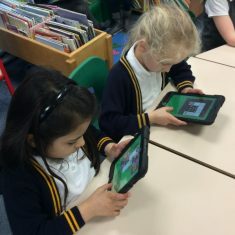 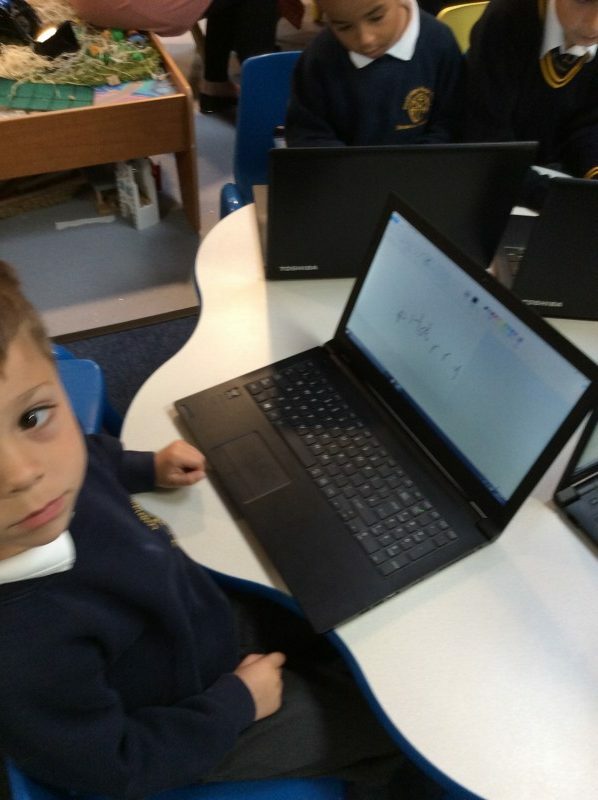 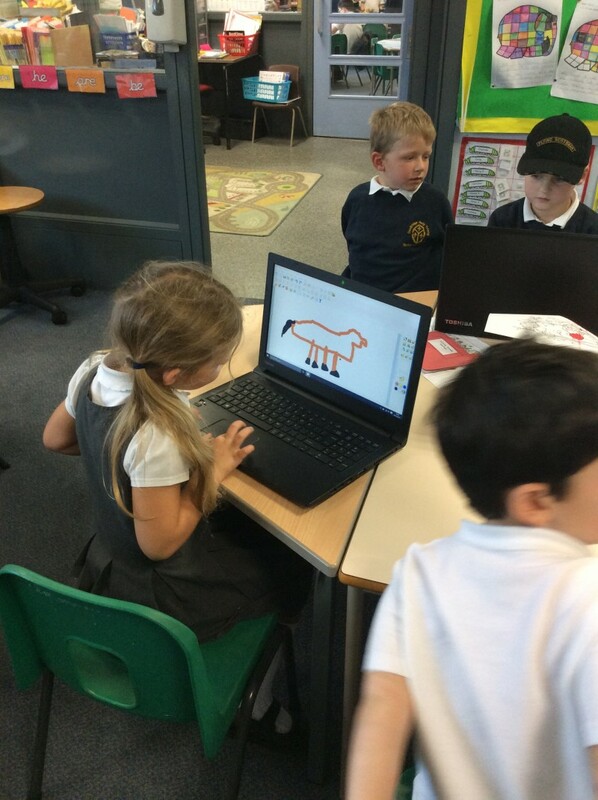 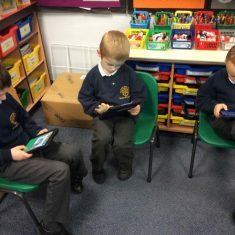 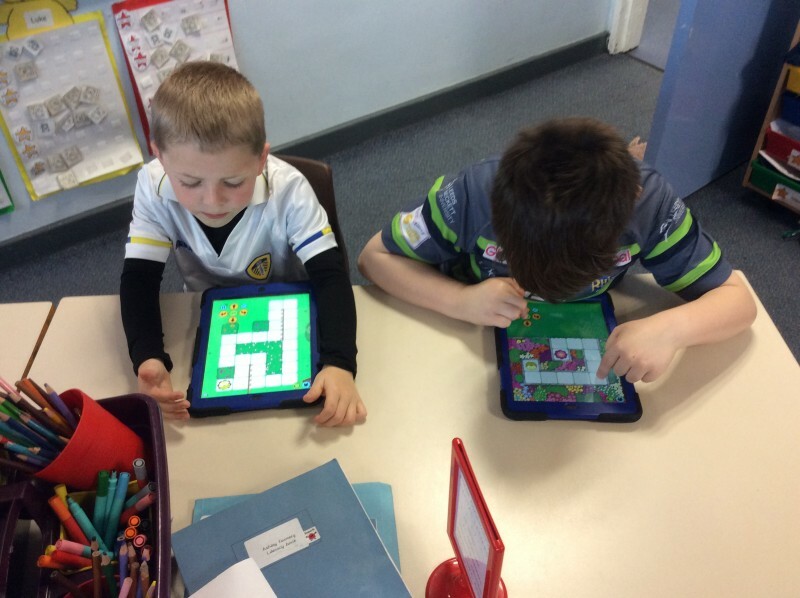 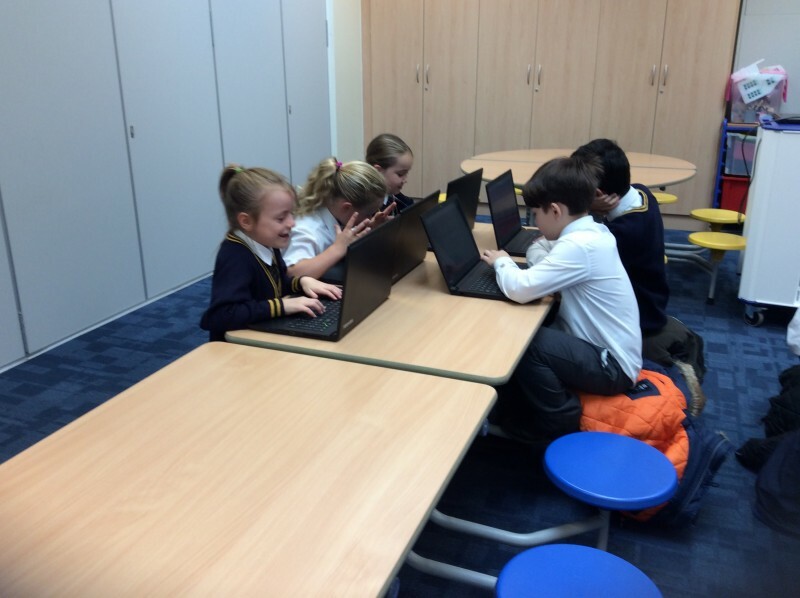 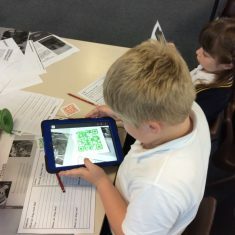 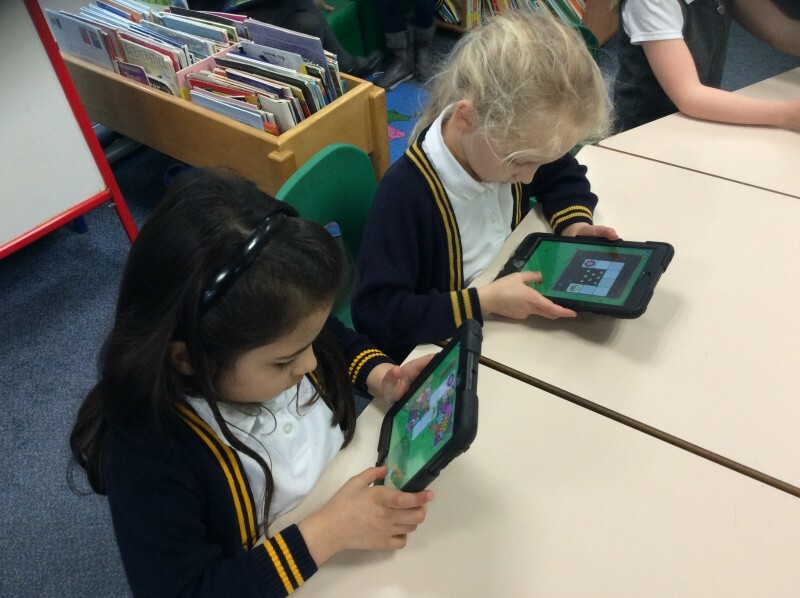 In year 2 we use the laptops and iPads to develop our computing skills. 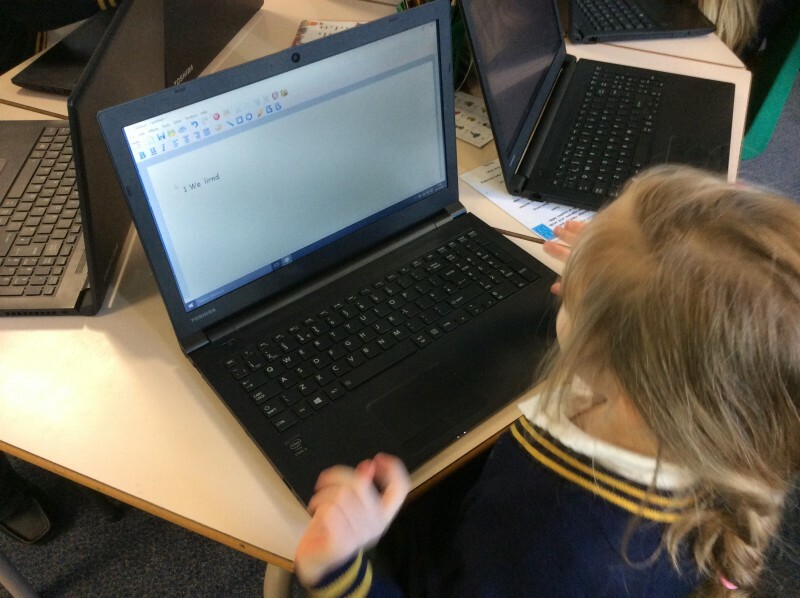 We become familiar with a range of programs such as textease, word and PowerPoint. 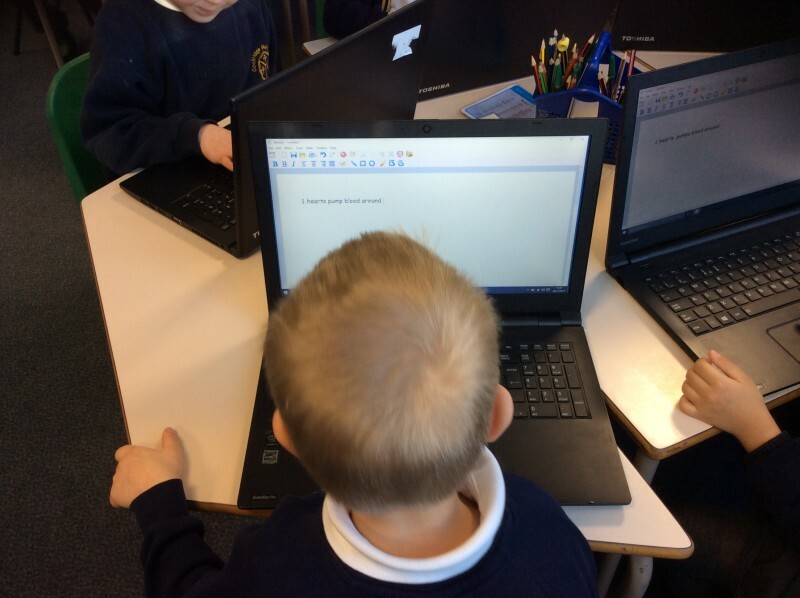 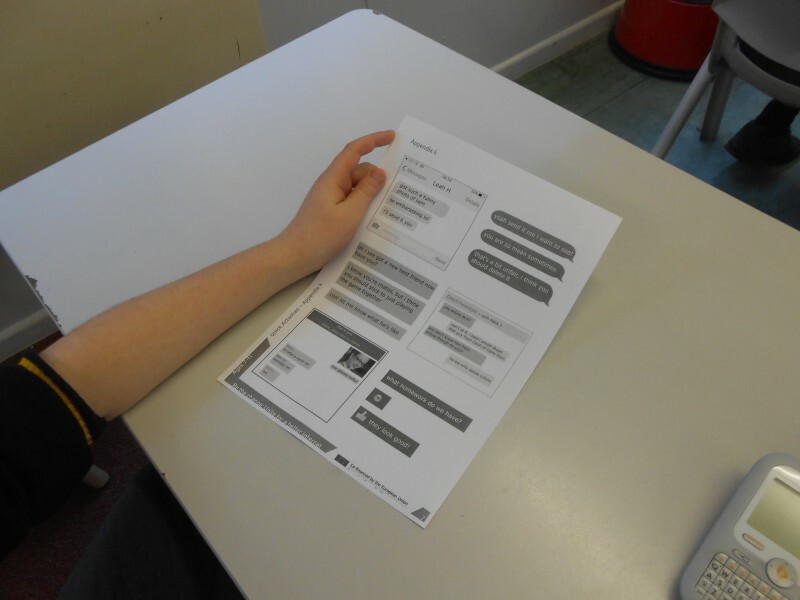 We use the internet to research and learn to copy and paste text and images. 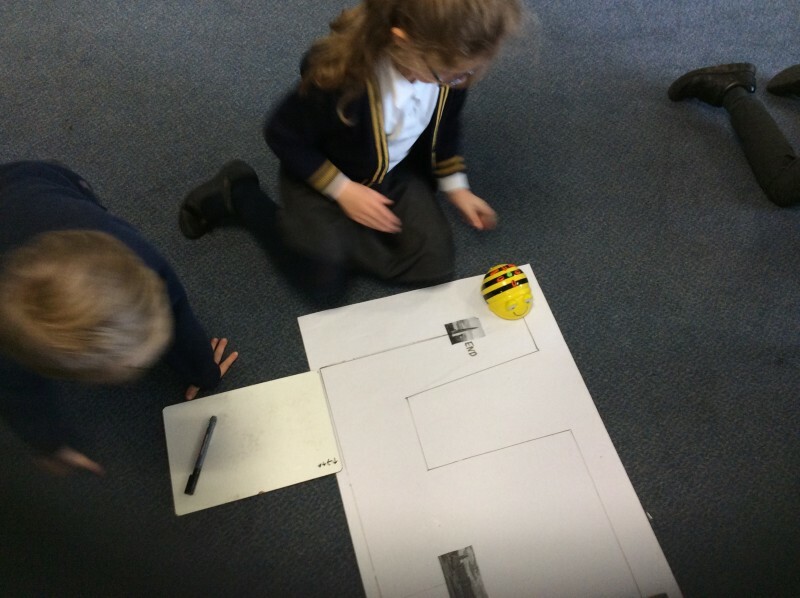 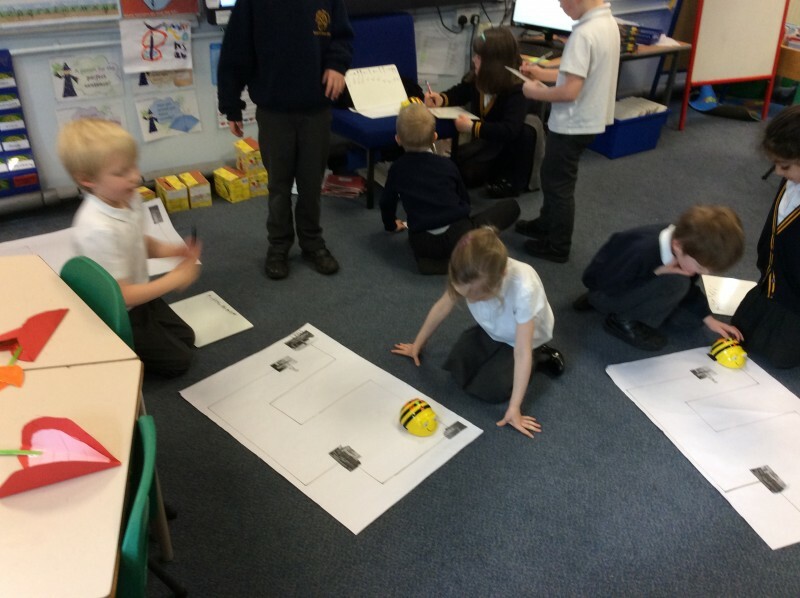 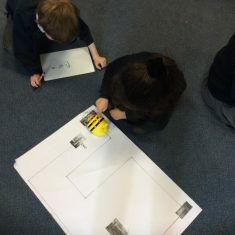 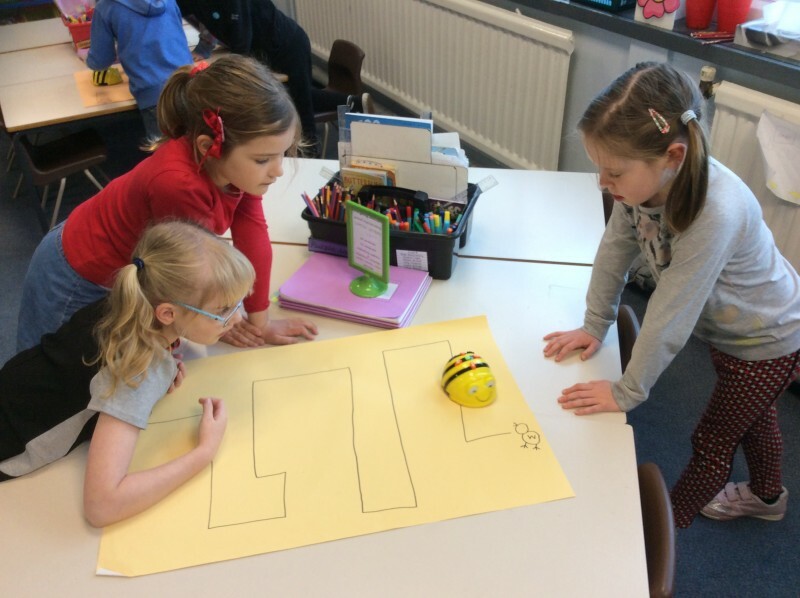 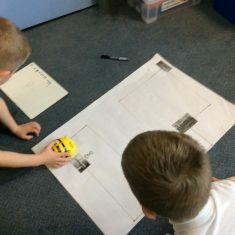 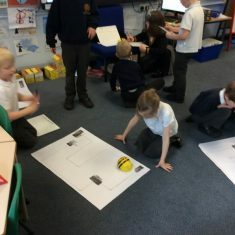 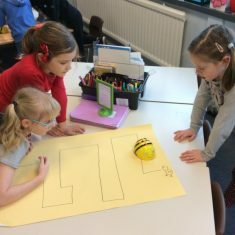 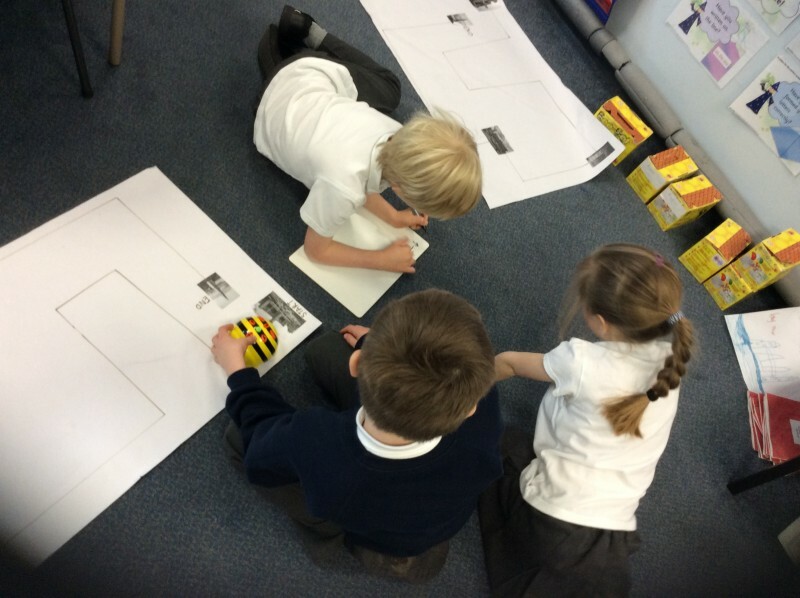 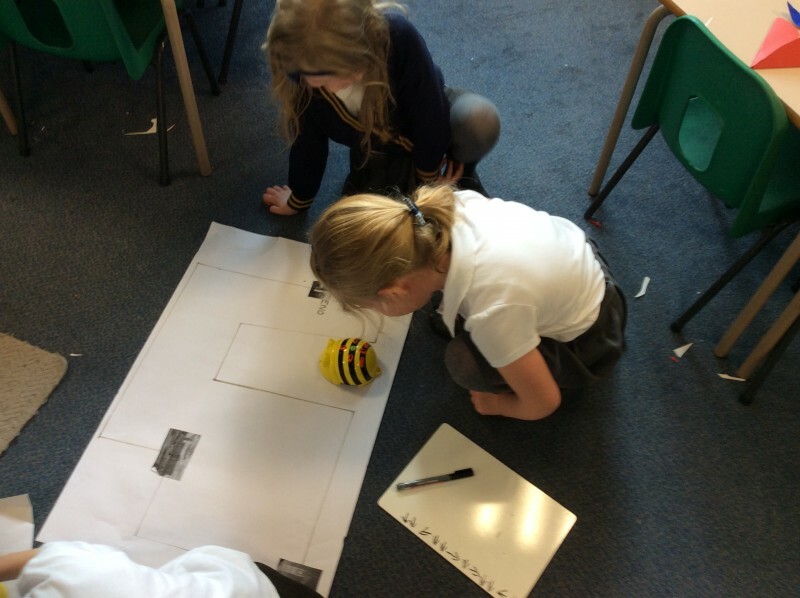 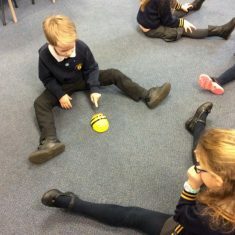 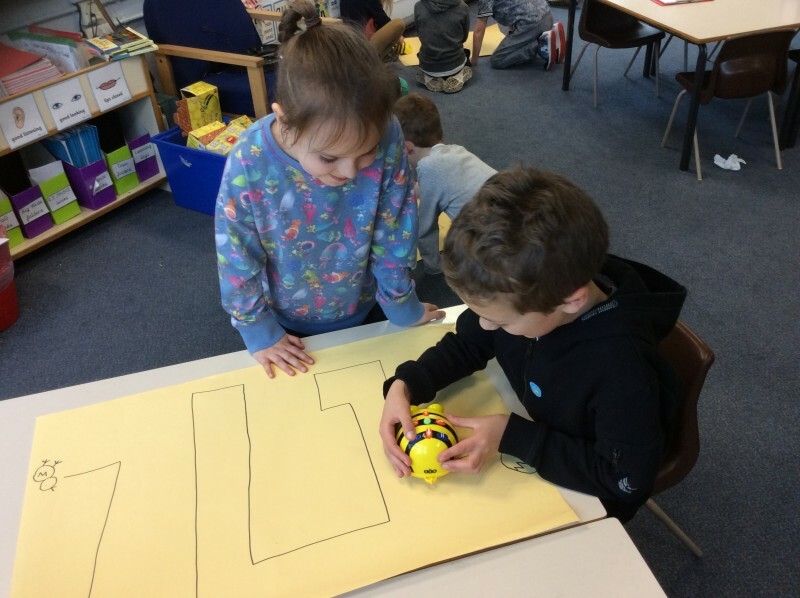 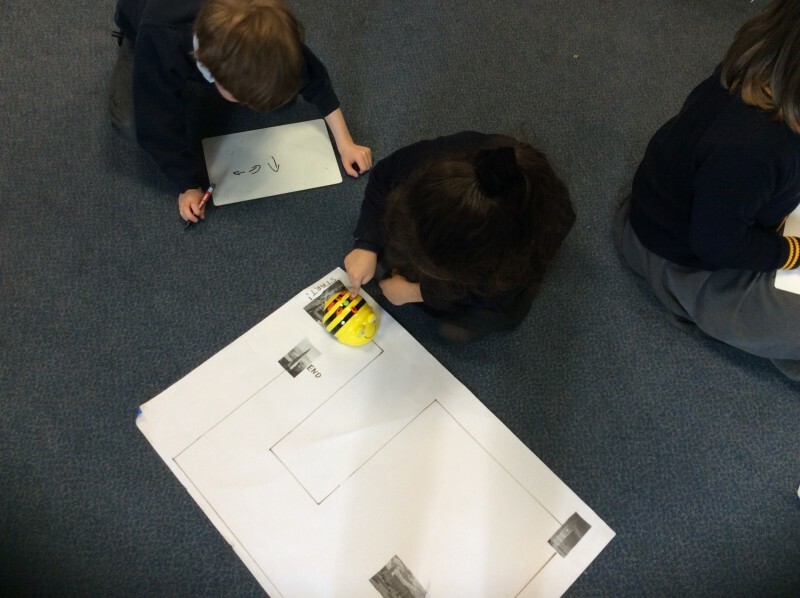 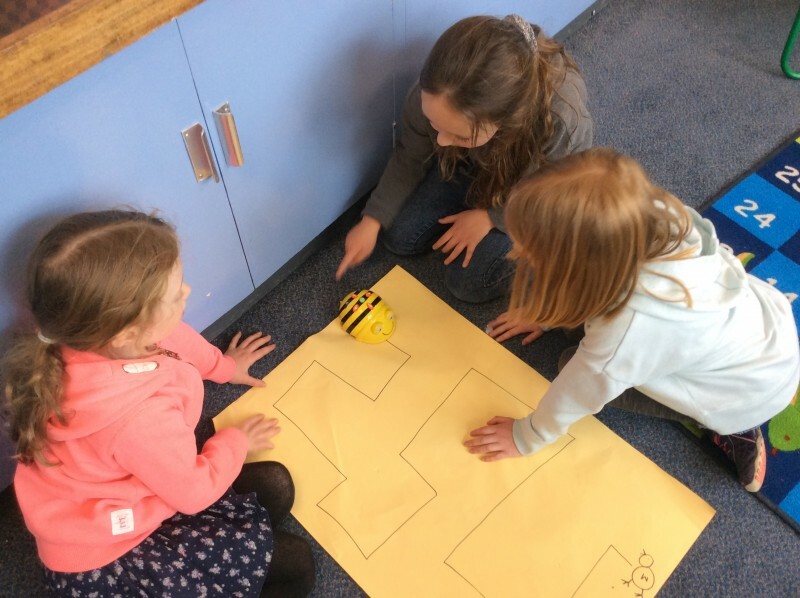 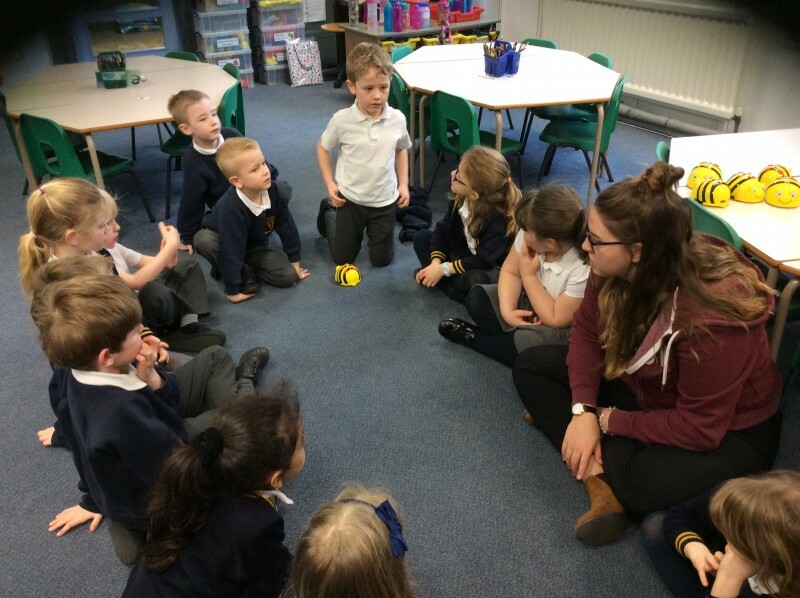 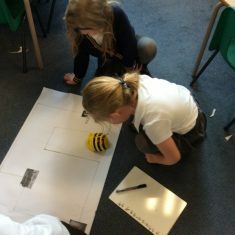 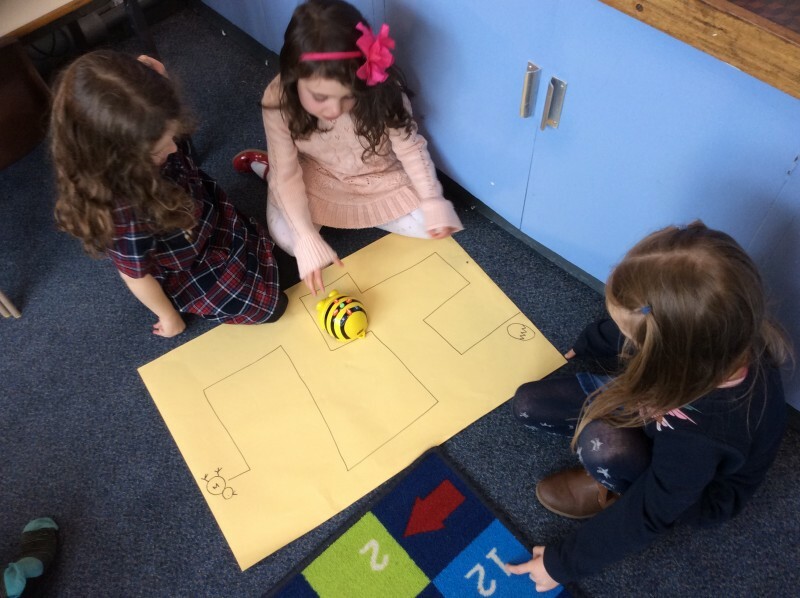 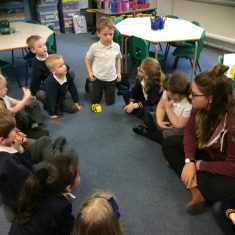 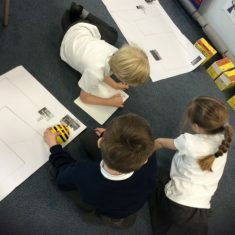 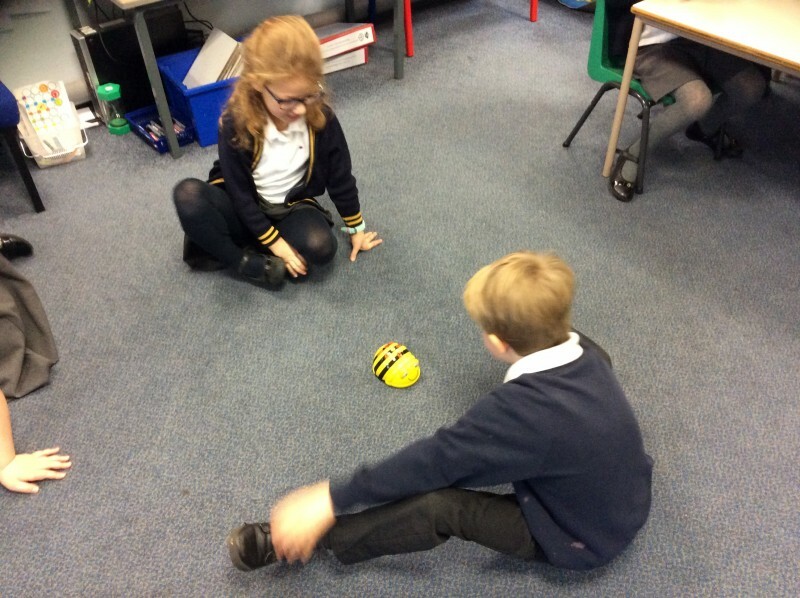 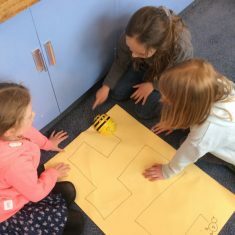 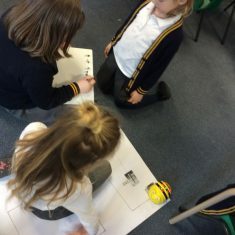 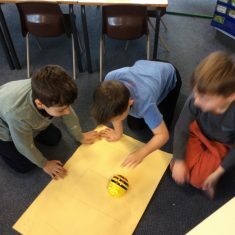 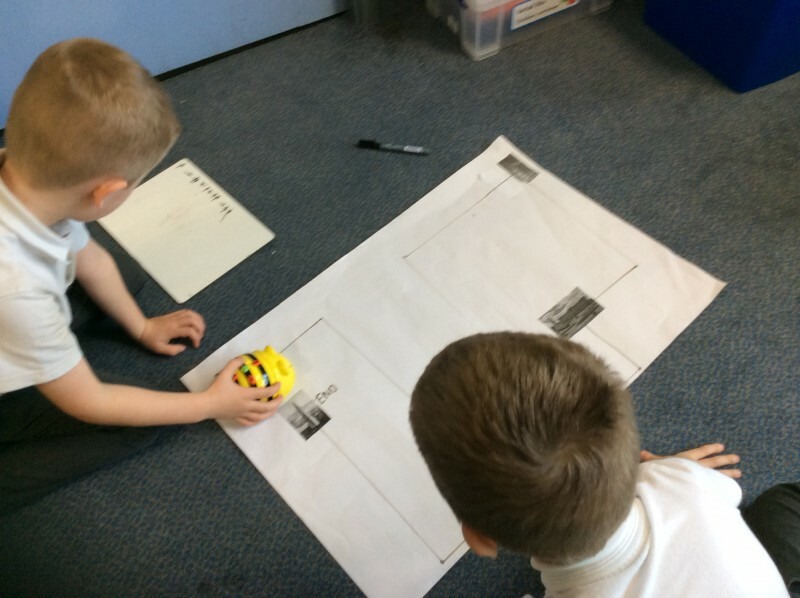 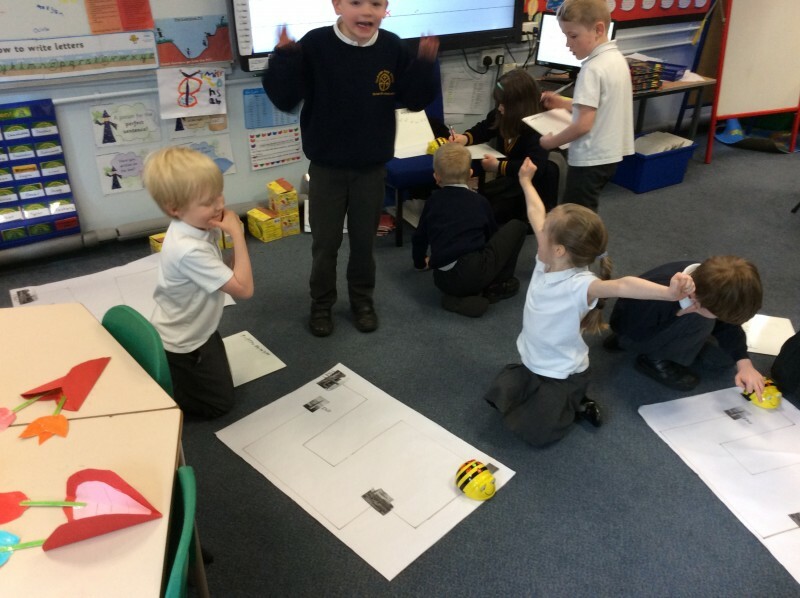 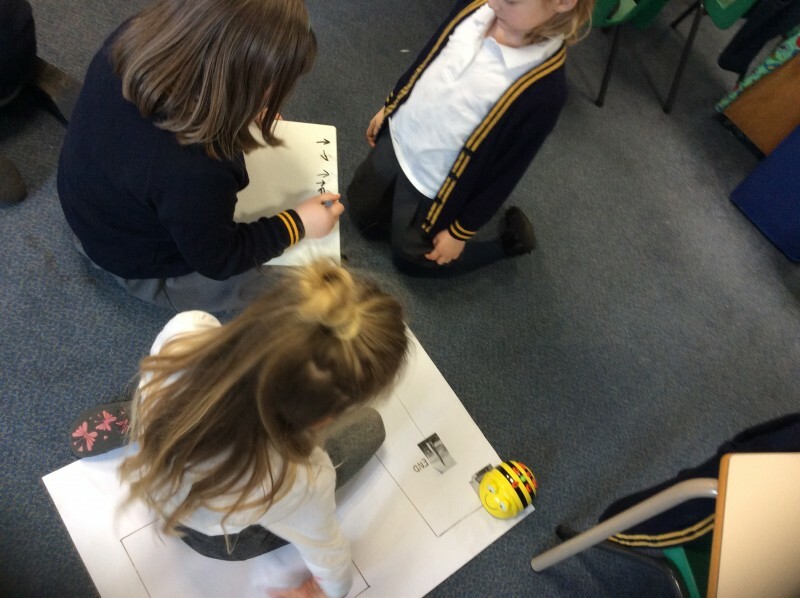 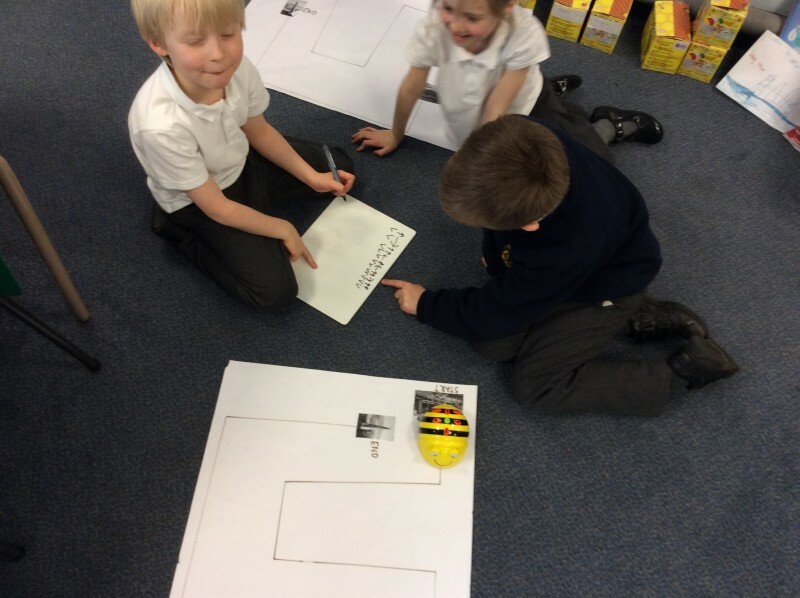 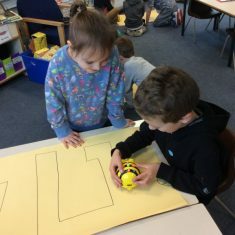 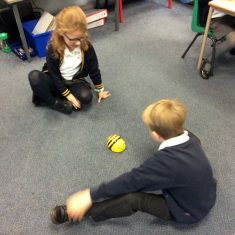 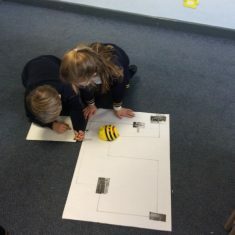 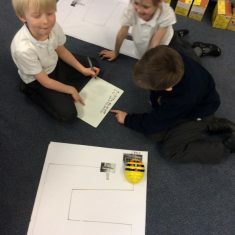 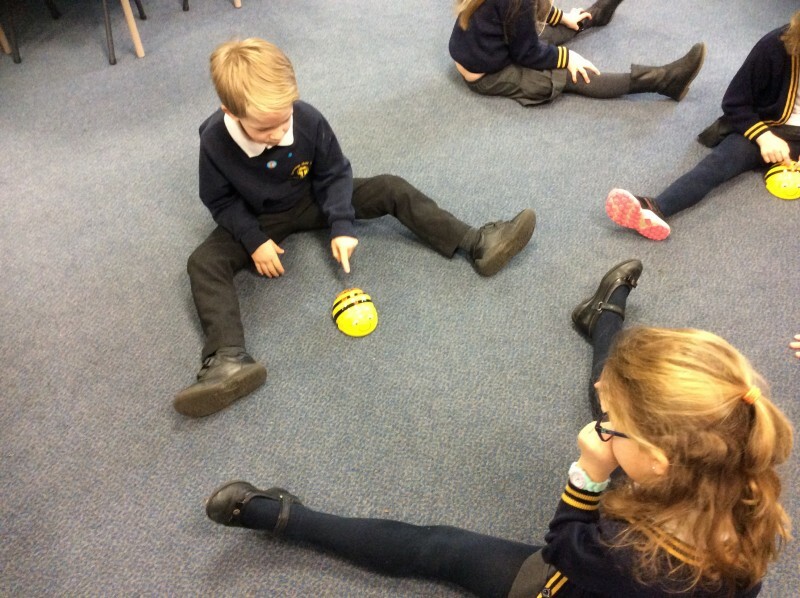 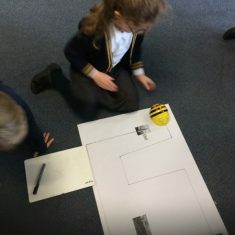 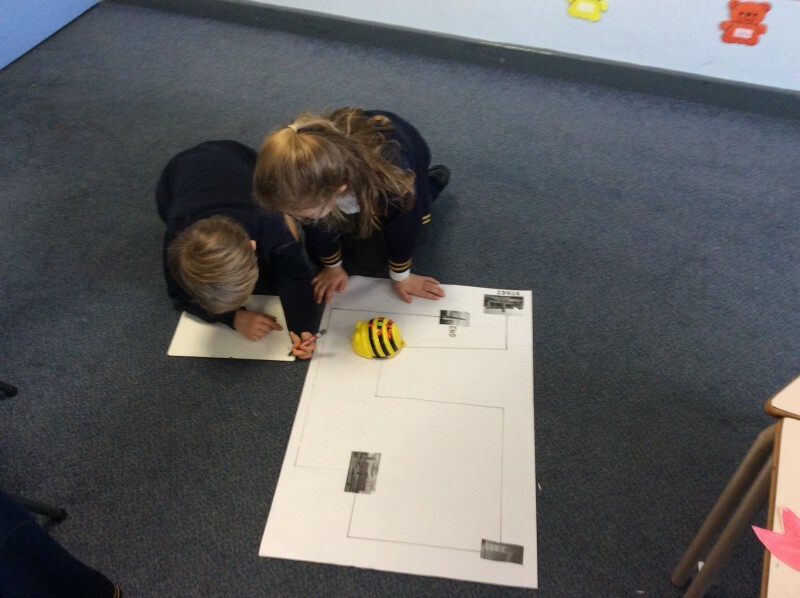 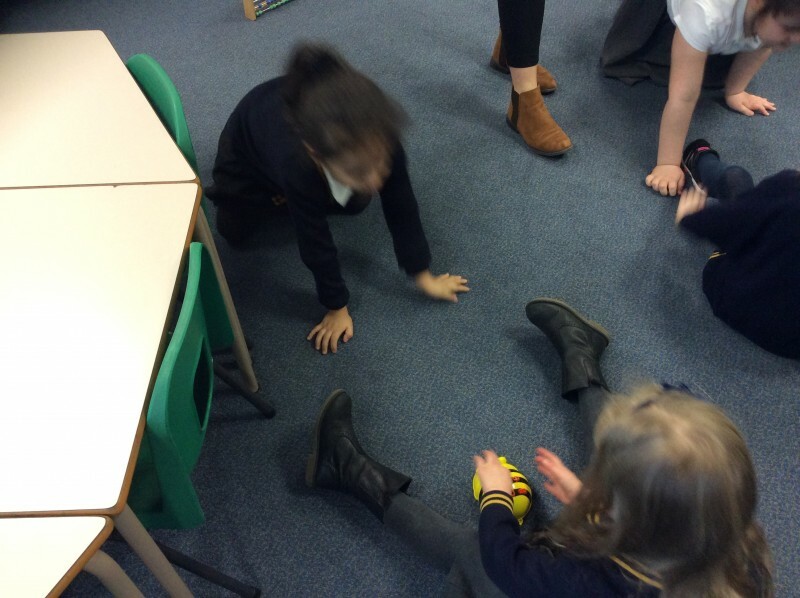 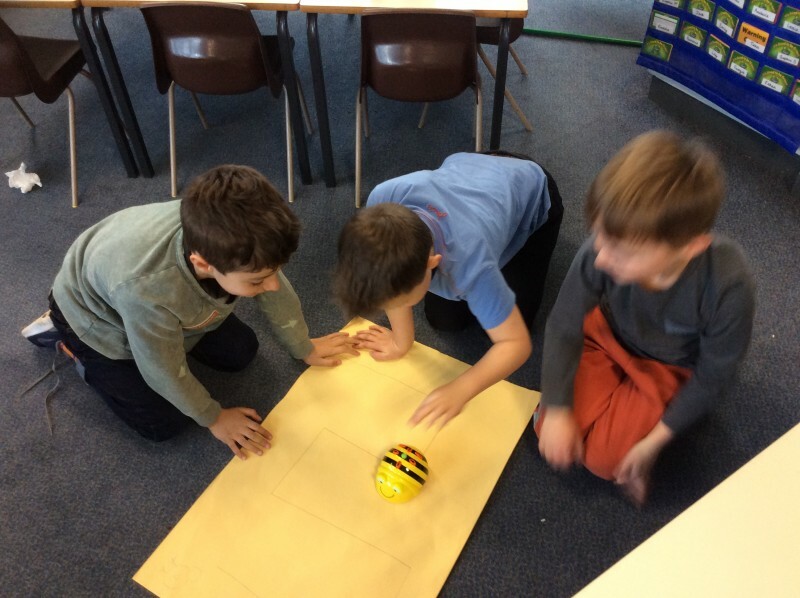 We also progress our learning to code using Beebots; we solve algorithms and debug problems. 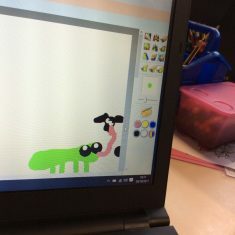 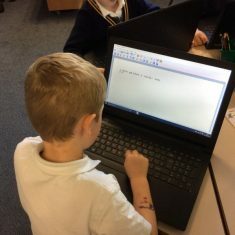 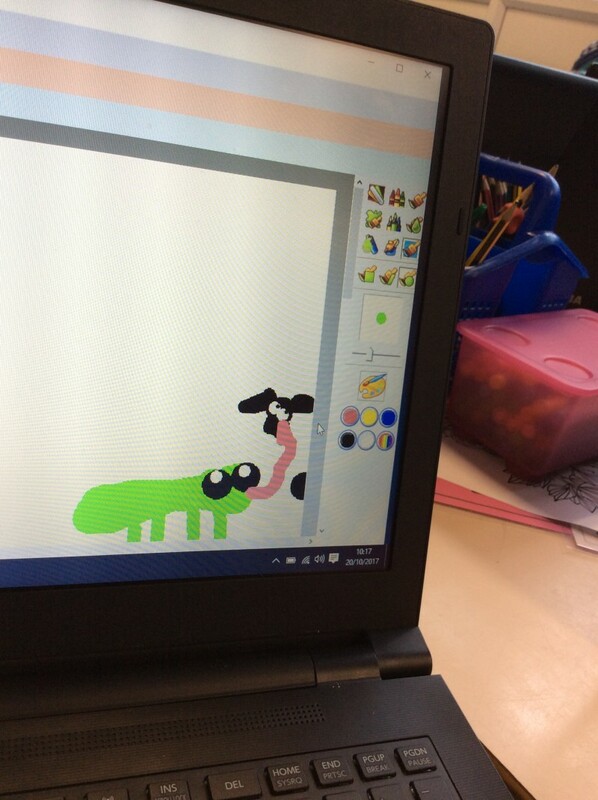 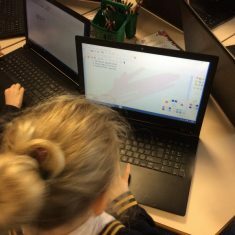 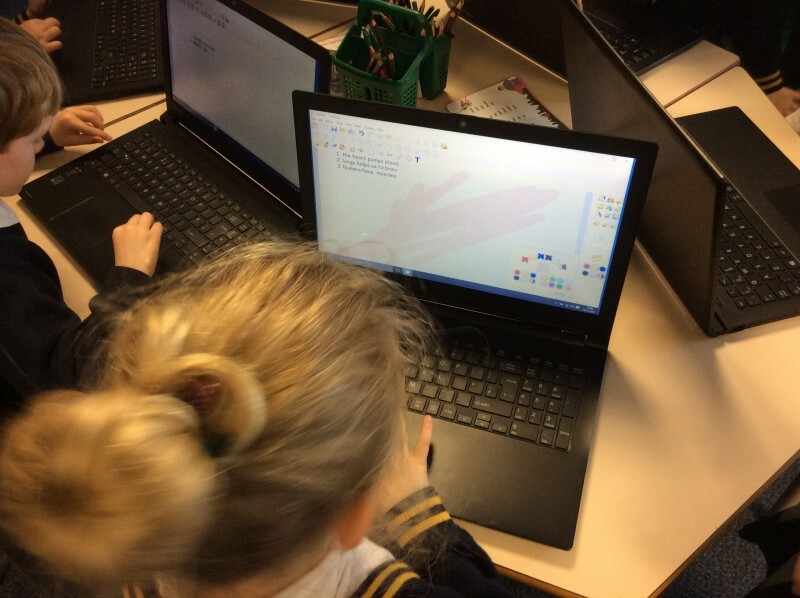 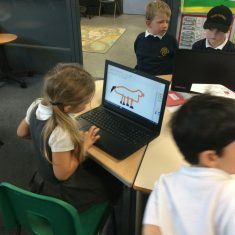 In year 3 we use the laptops to design and make book covers. 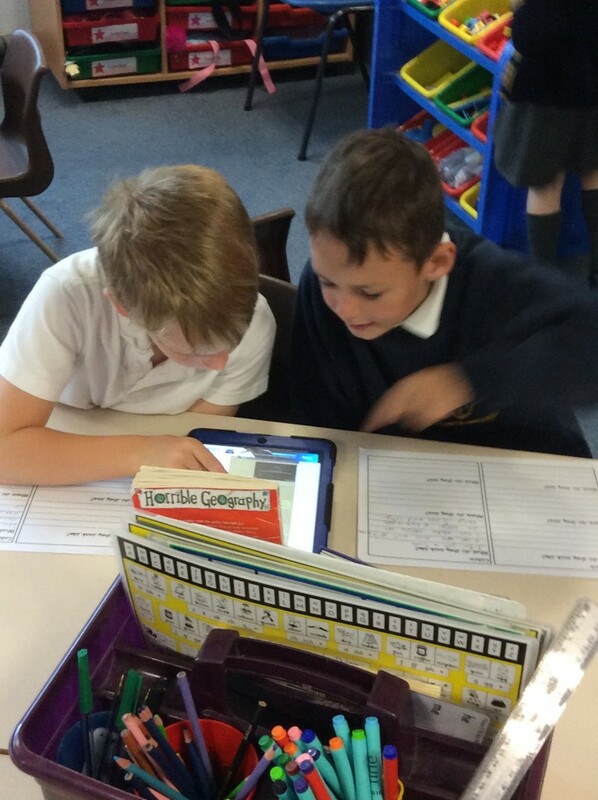 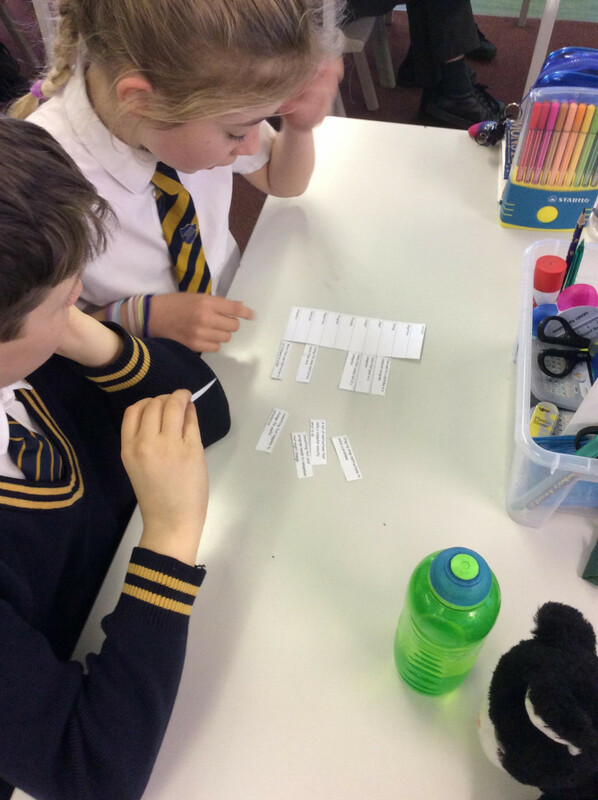 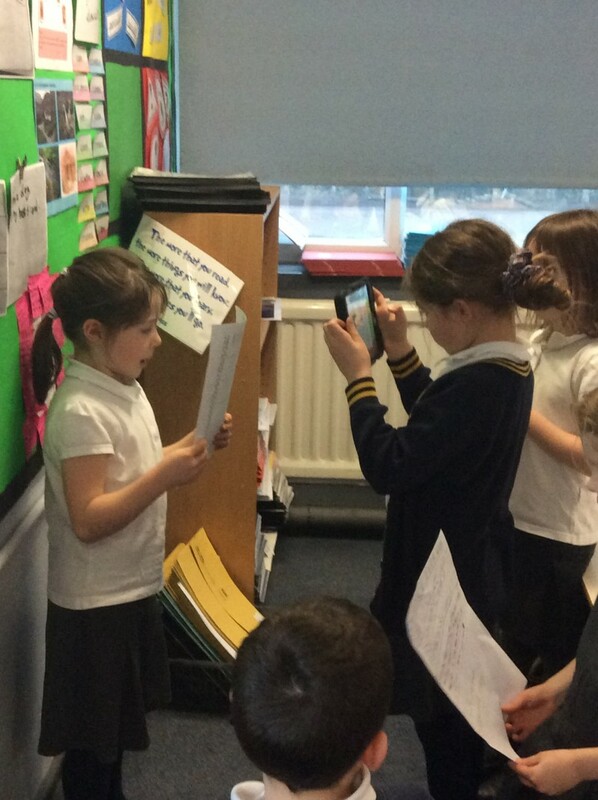 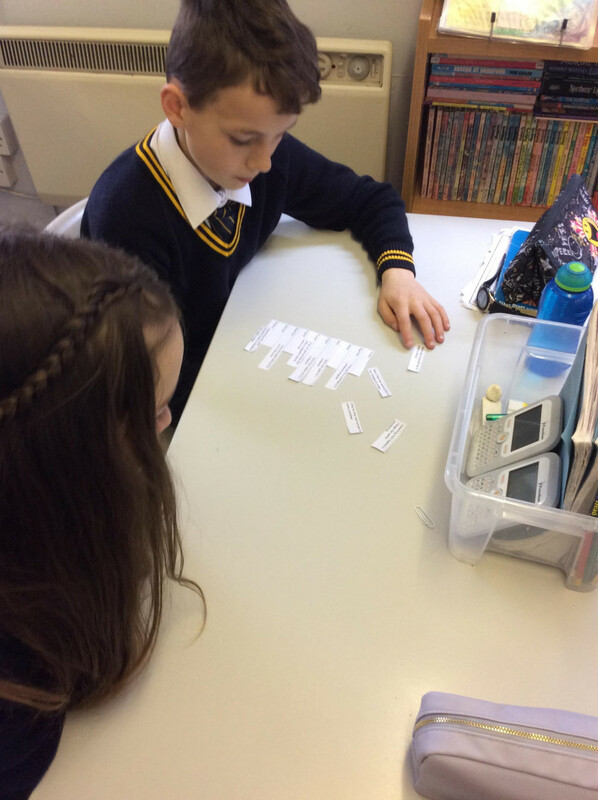 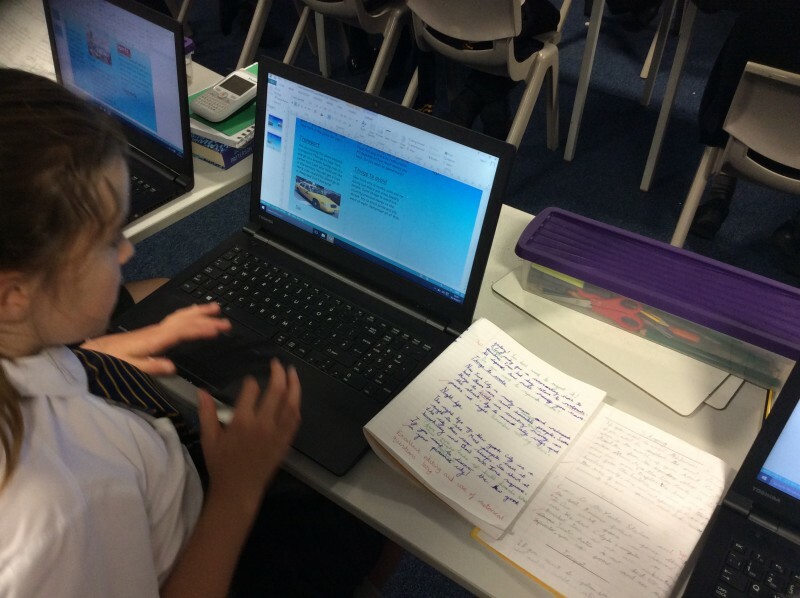 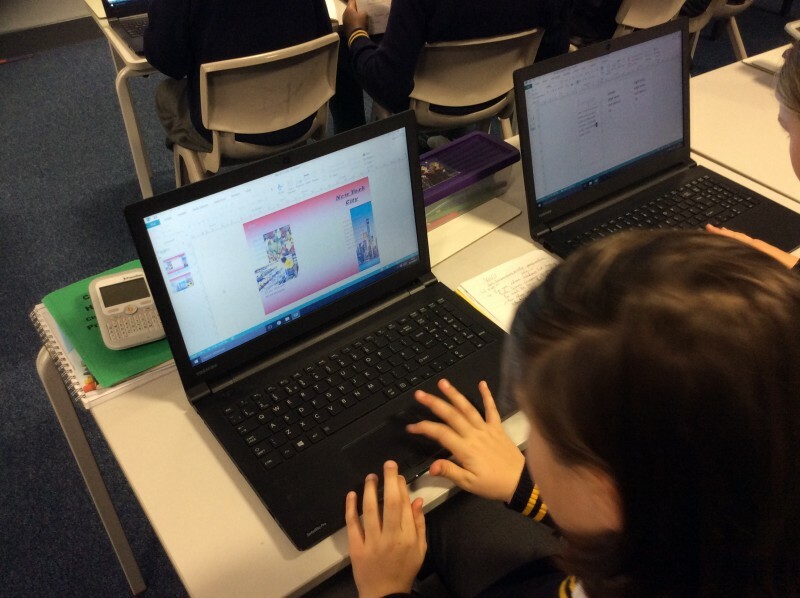 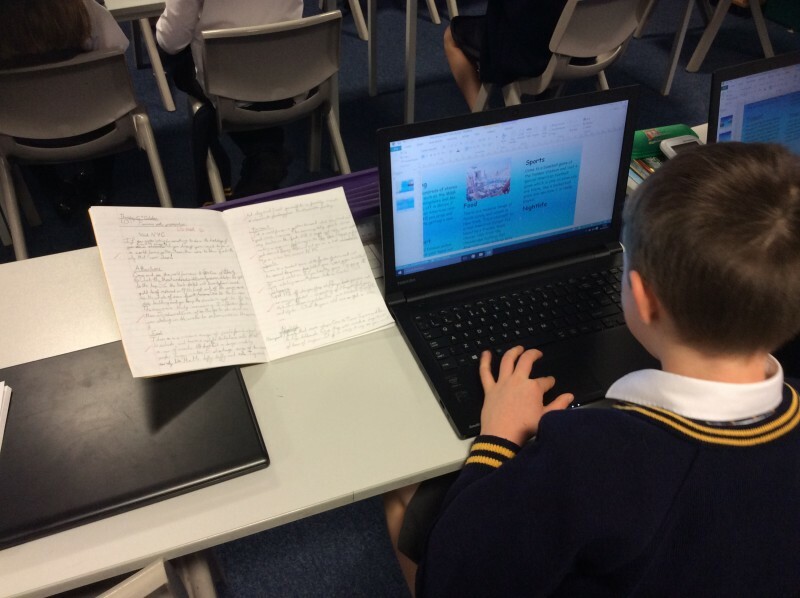 We deepen our knowledge of using word, powerpoint and textease – creating weather powerpoints. 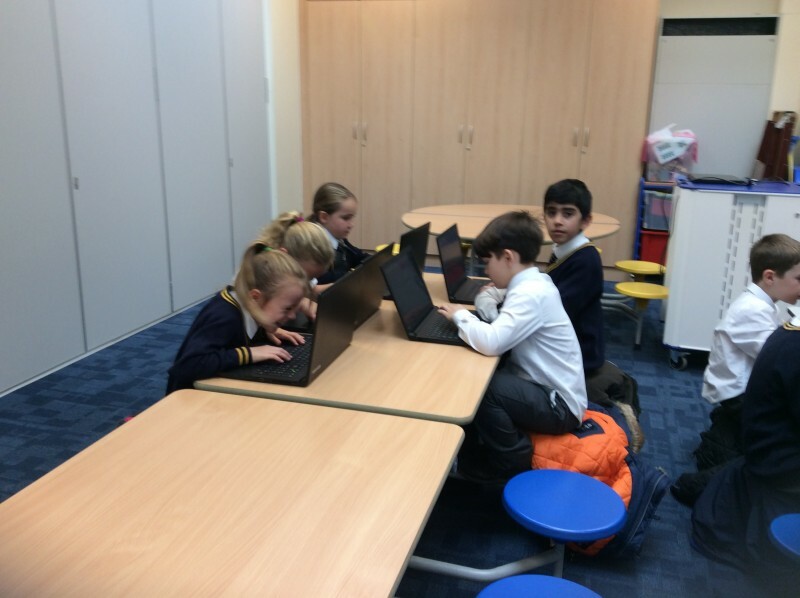 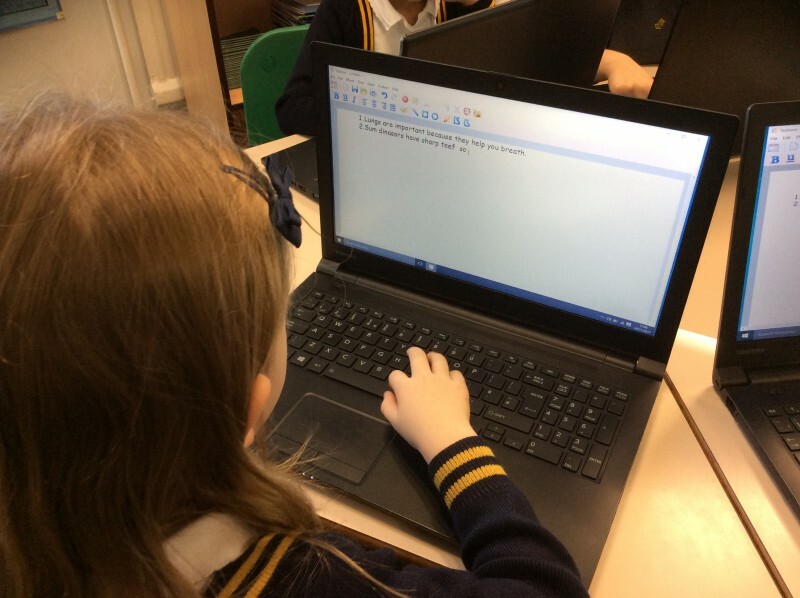 During our computing lessons, we are taught how to safely use emails and are given our own school email address. 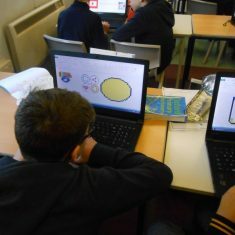 Furthermore, we are introduced to Scratch and simple coding, we also use Pro-Bots to draw shapes. 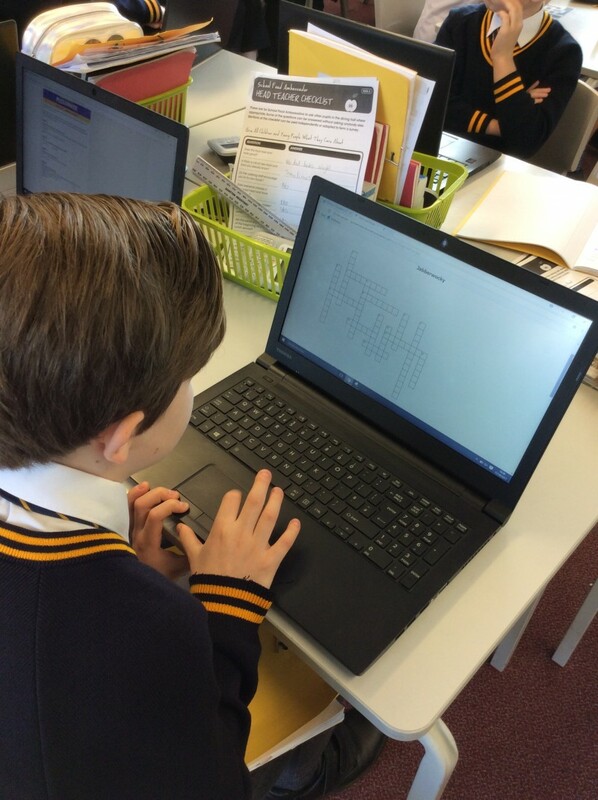 In the Summer term, we look at data collection and are taught how to use programmes such as Excel. 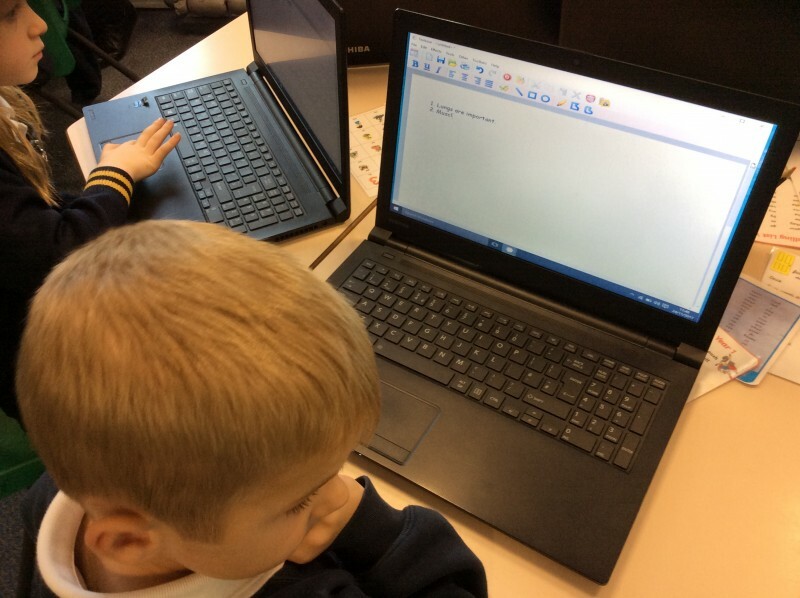 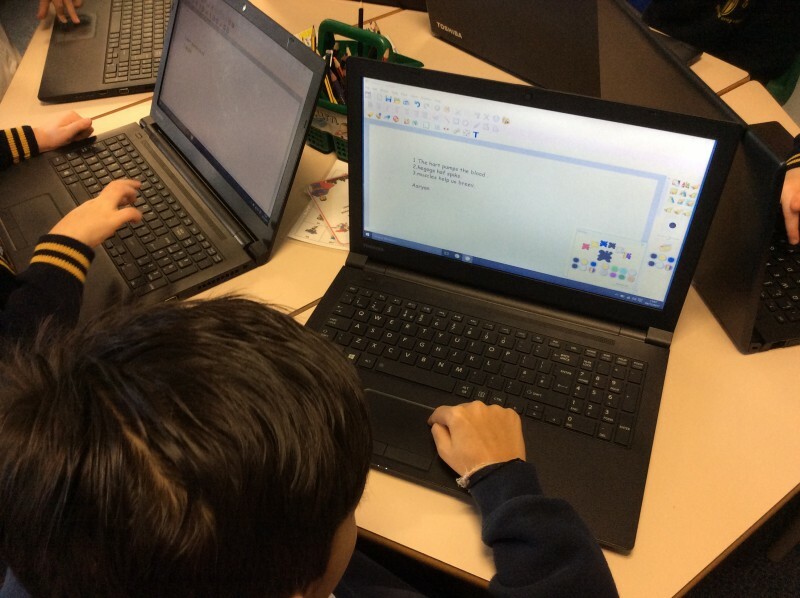 In Year 4 we use the laptops to create posters, advancing our word processing skills and are introduced to Publisher. 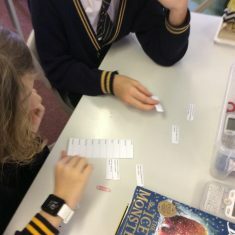 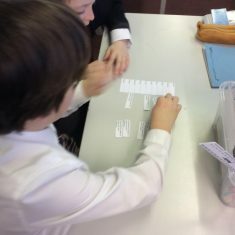 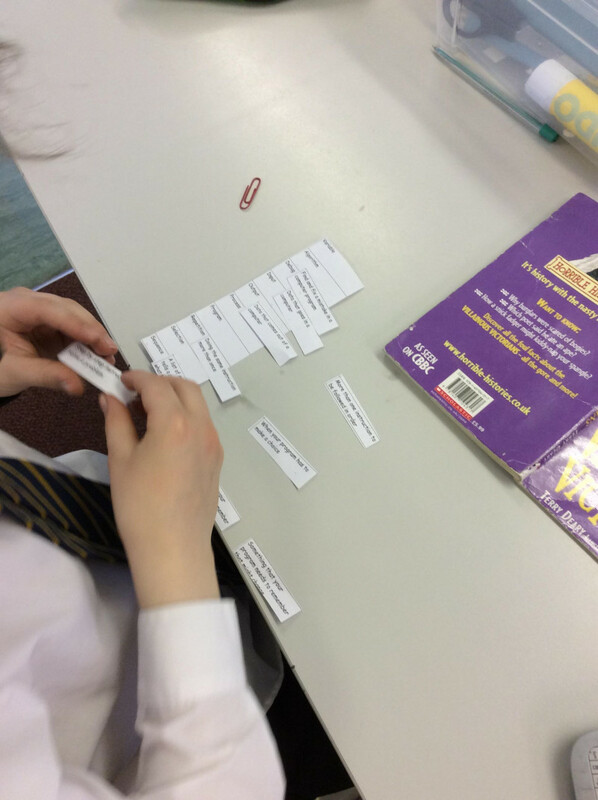 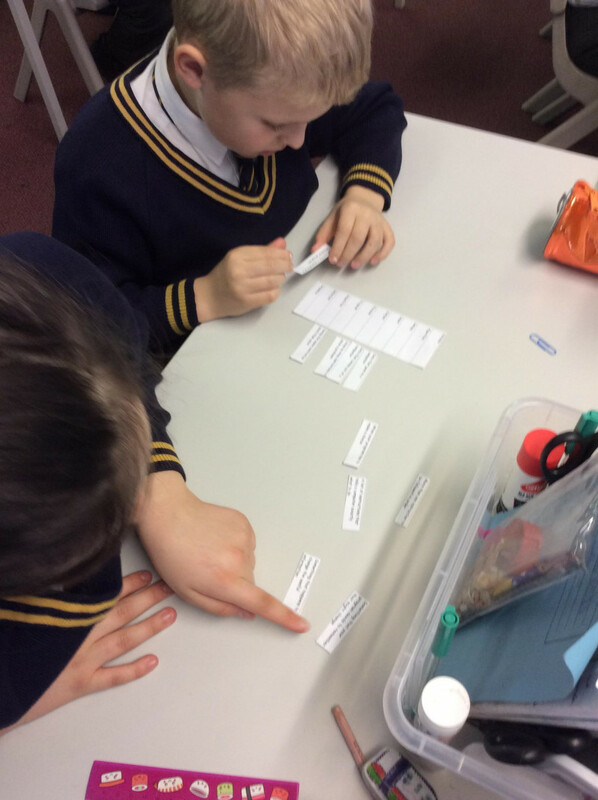 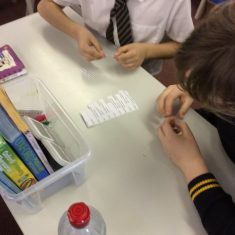 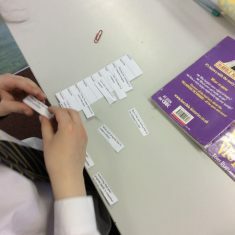 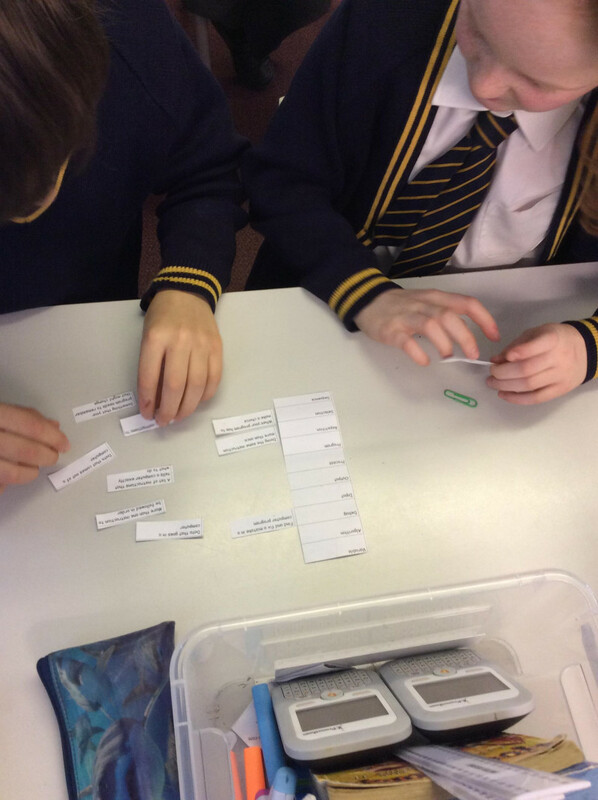 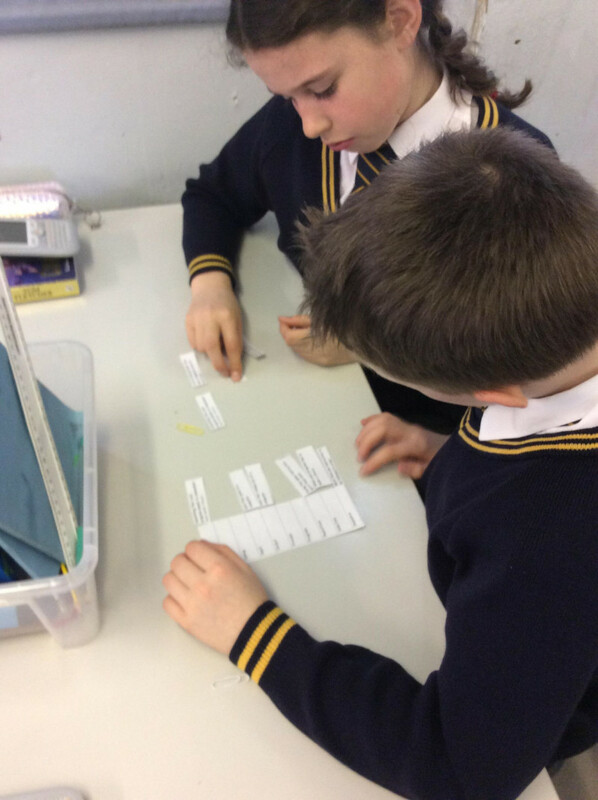 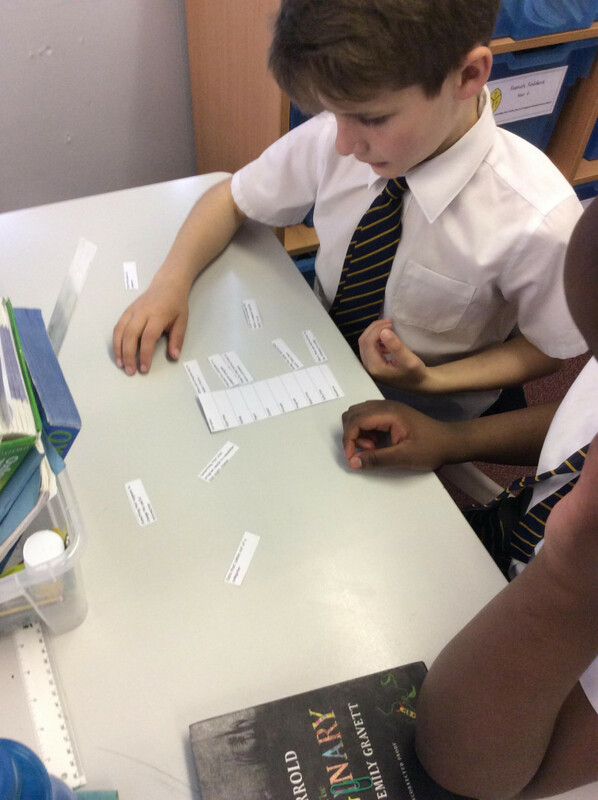 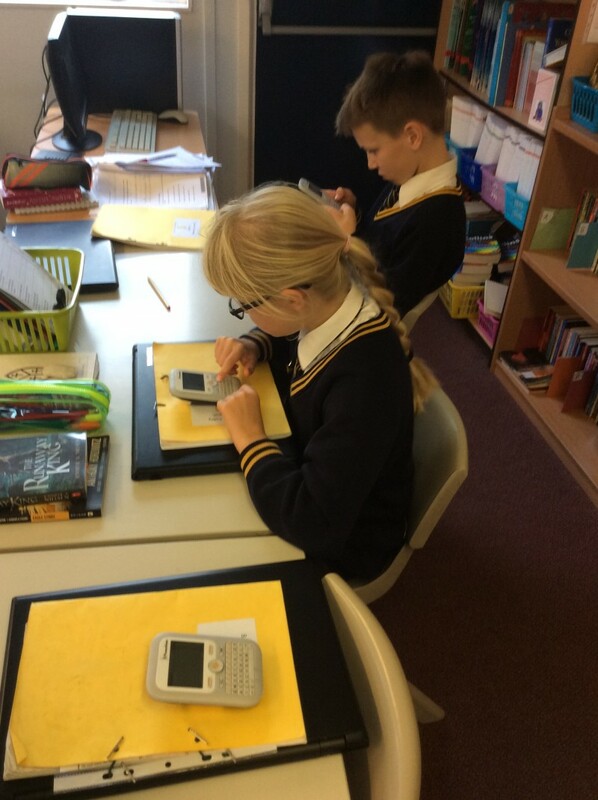 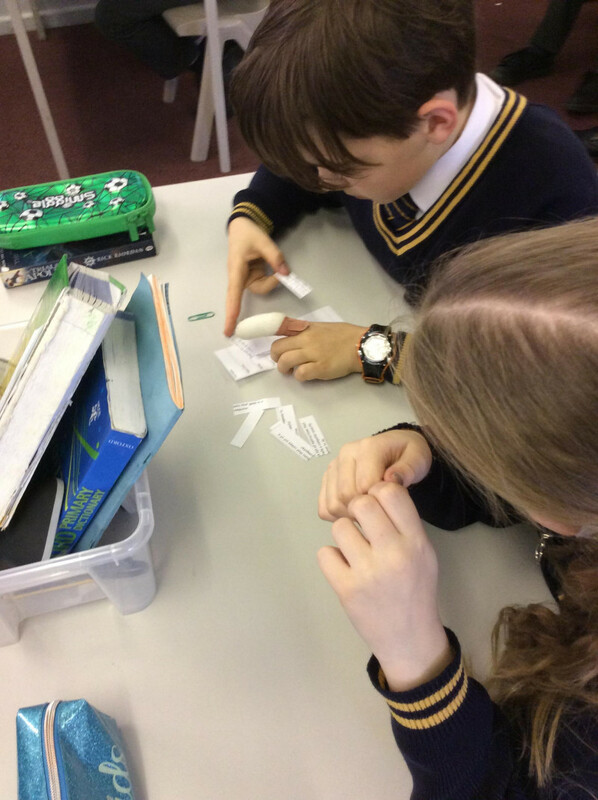 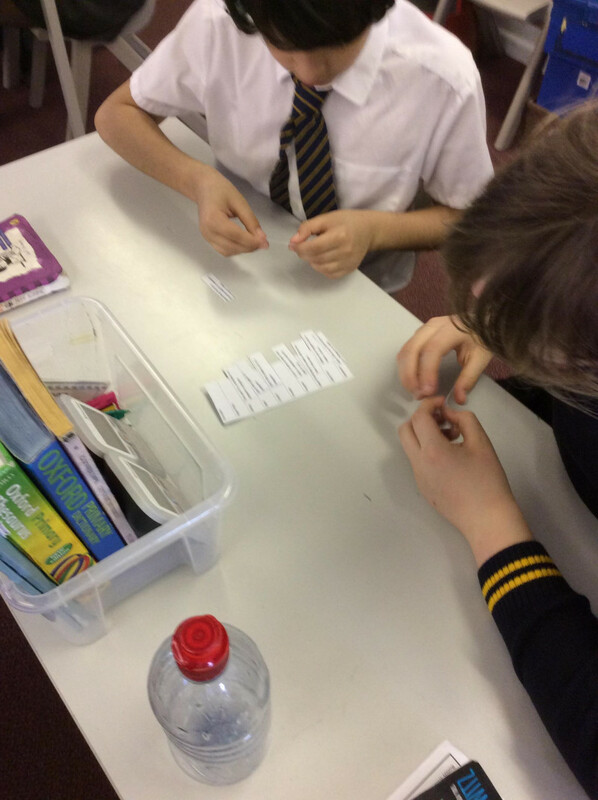 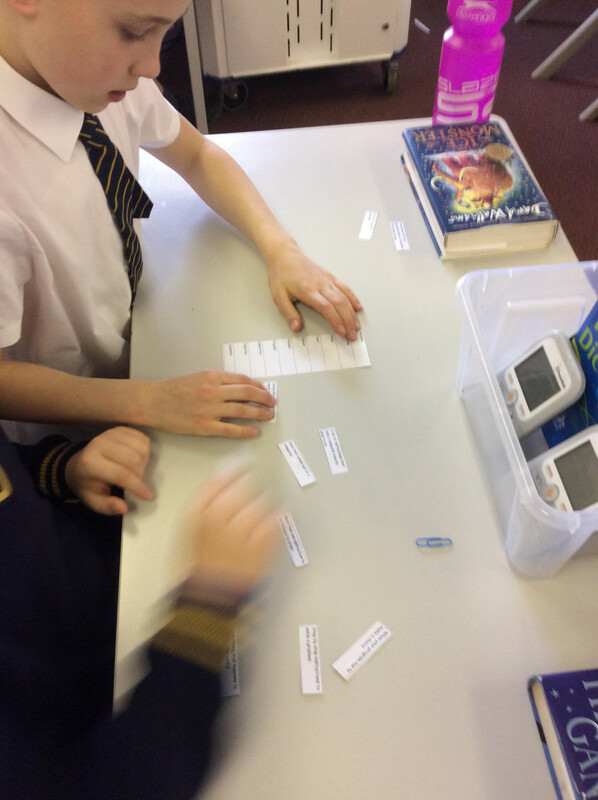 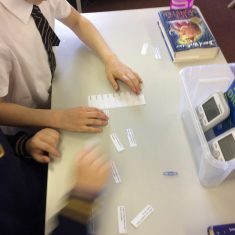 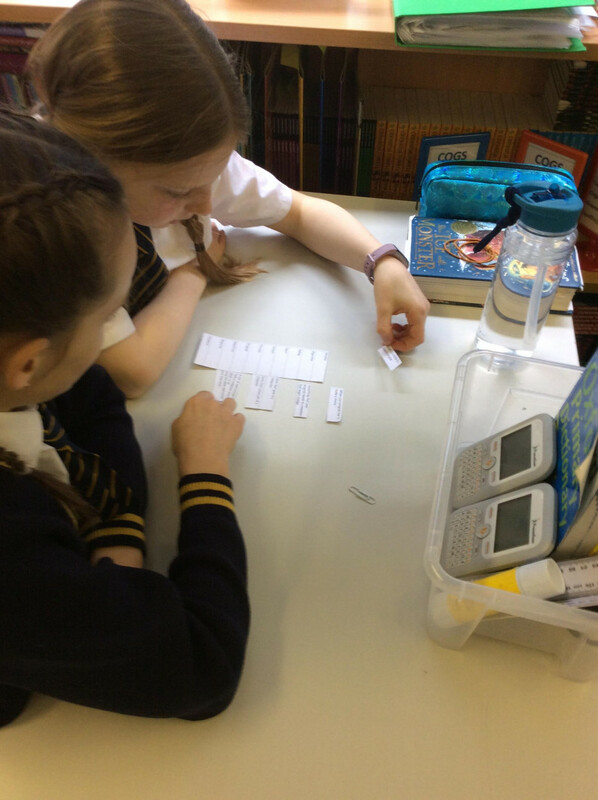 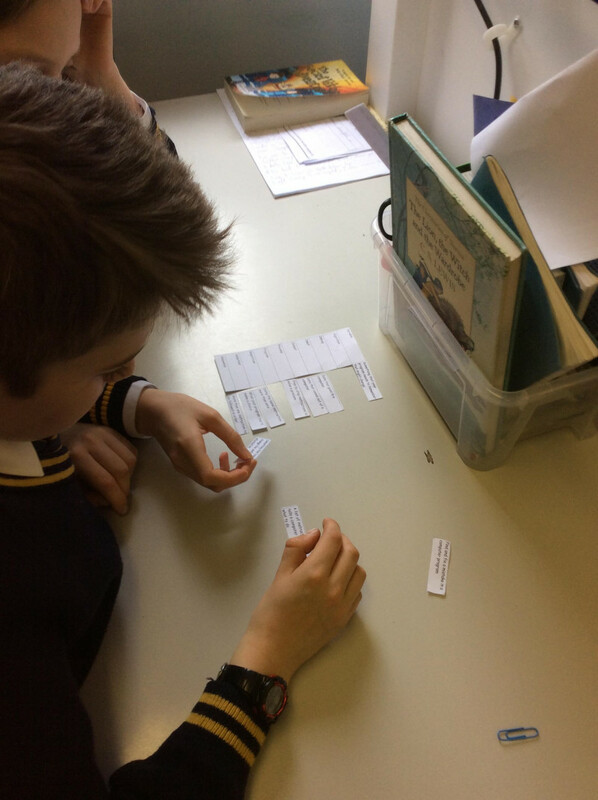 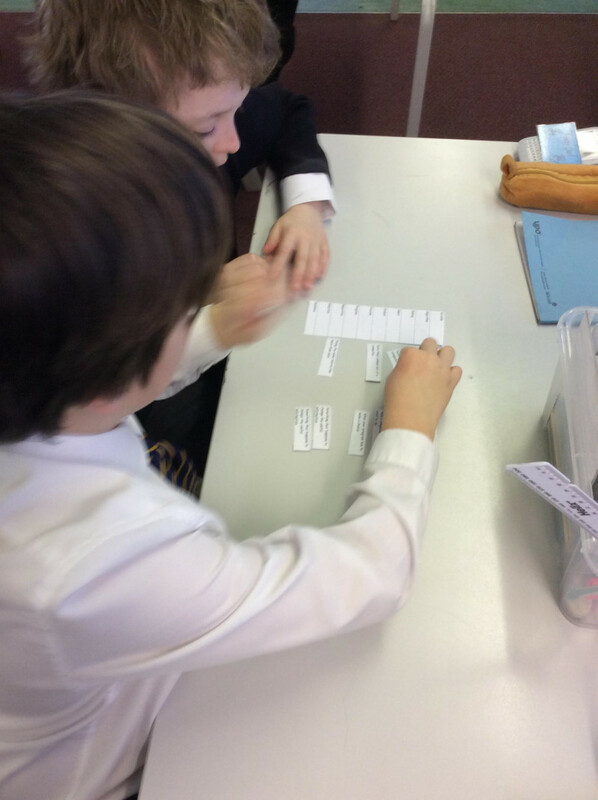 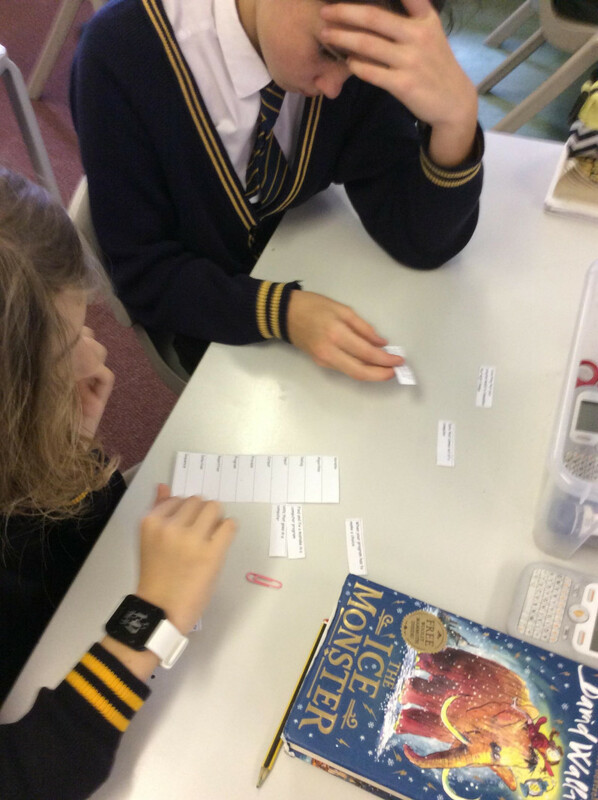 We progress out data collecting skills further, constructing data bases and graphs in Science and Maths. 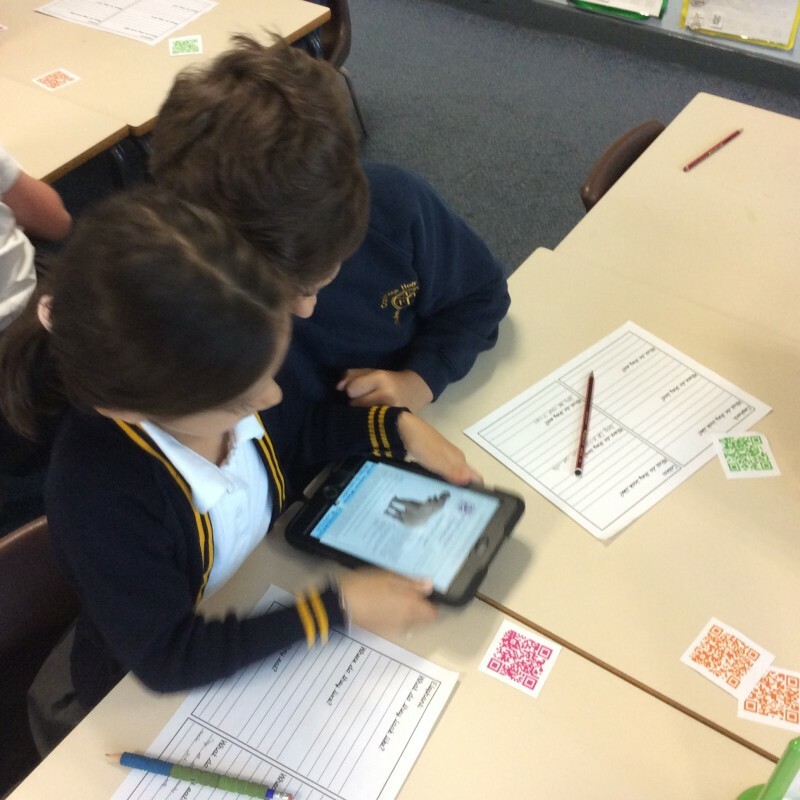 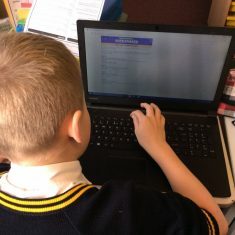 We learn about online risks and contribute to blogs on our school website. 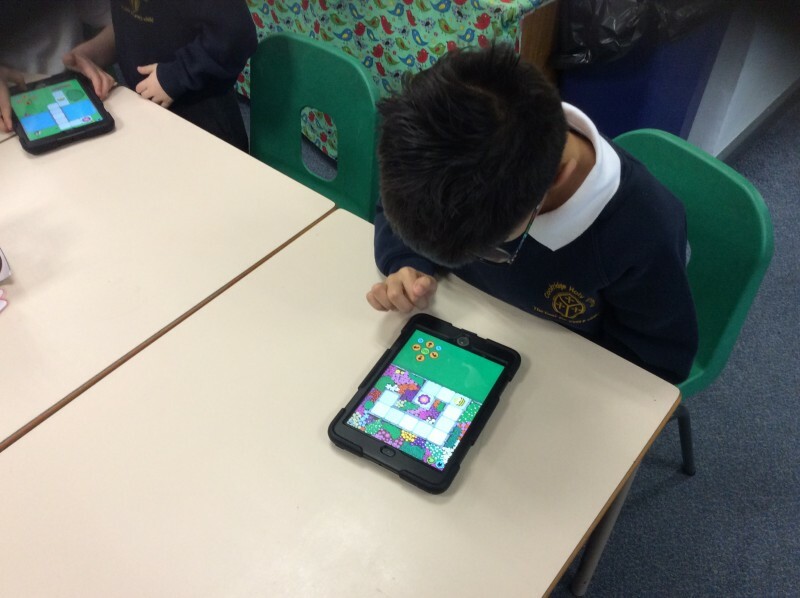 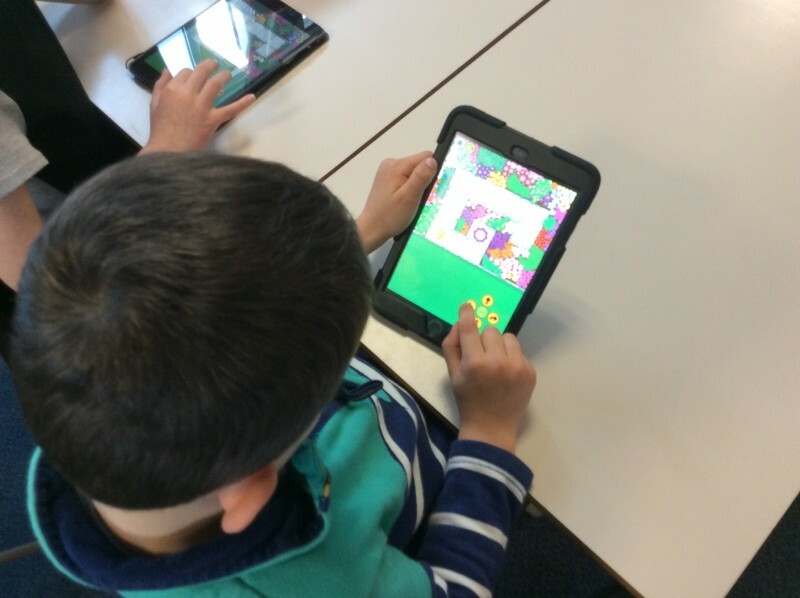 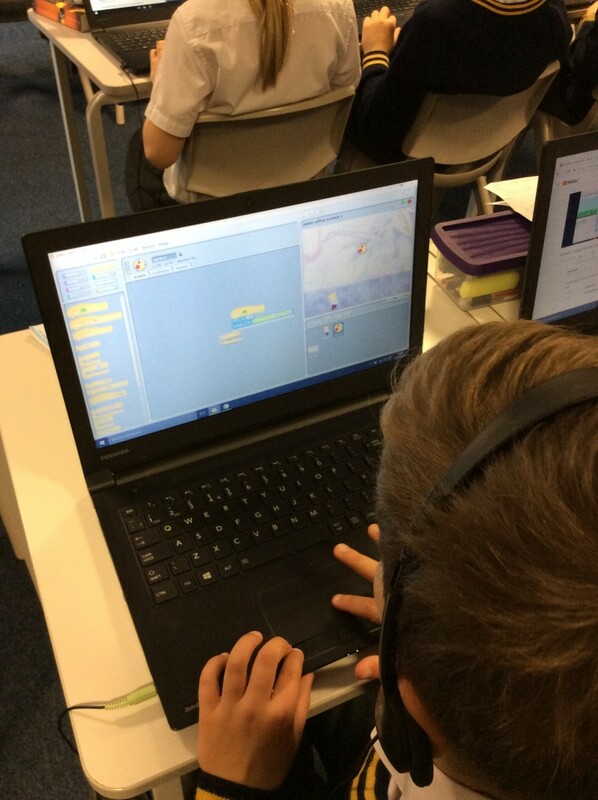 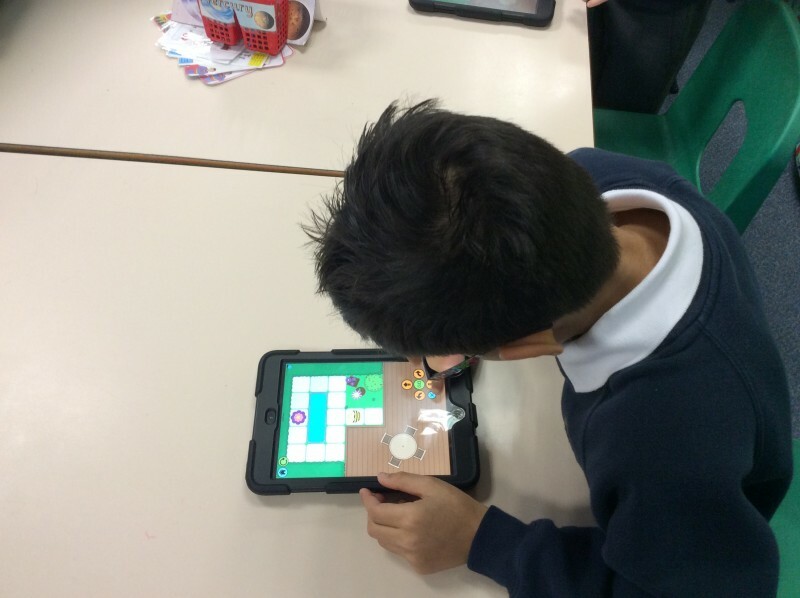 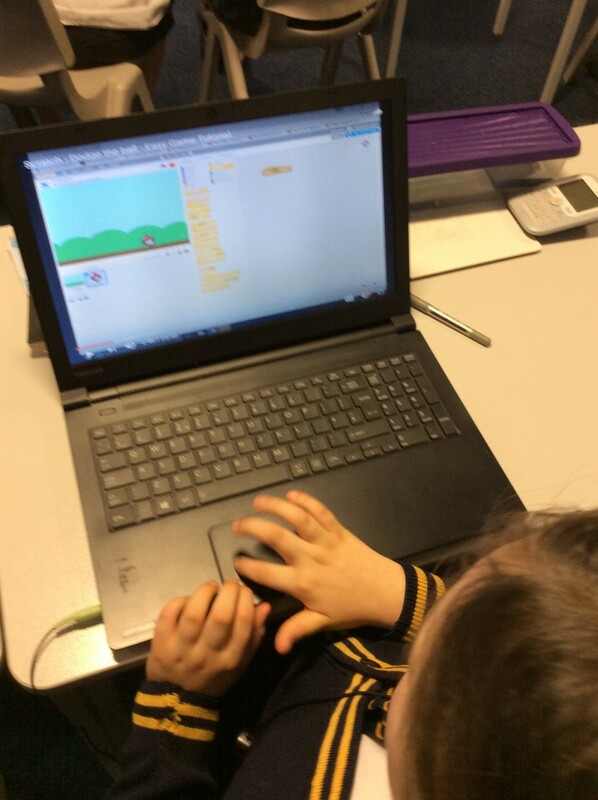 We deepen our understanding of coding through Scratch and Kodu. 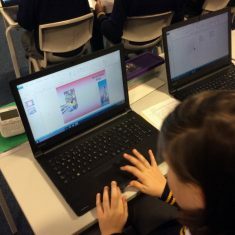 We create animations using Powerpoint. 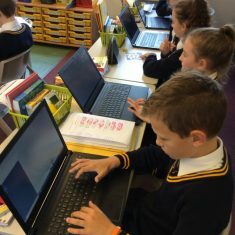 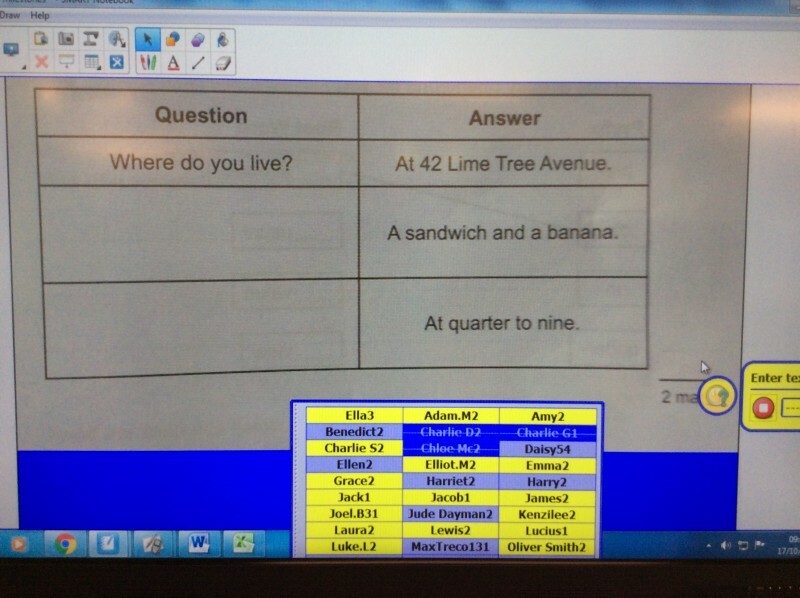 In year 5 we use computing for a variety of purposes. 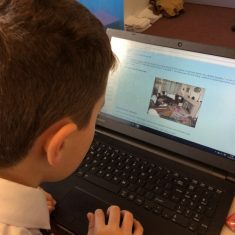 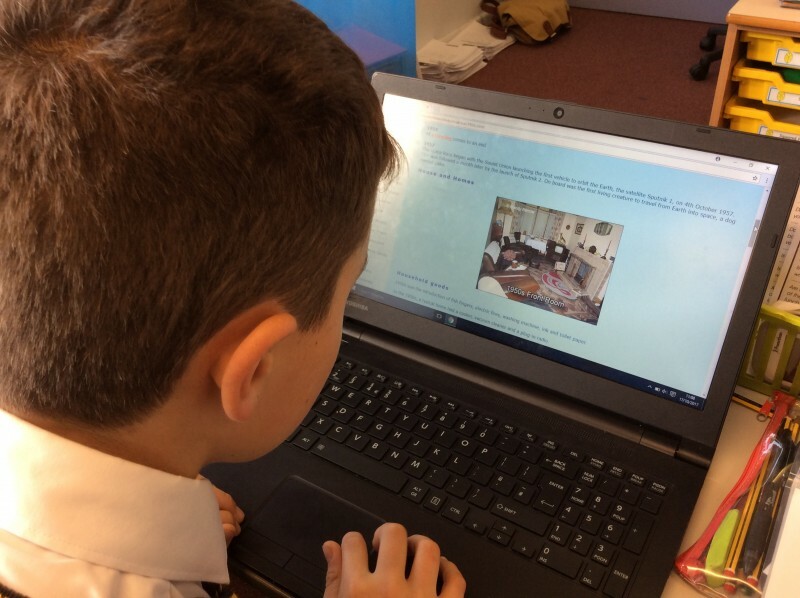 We use computing to research out Topic of North and South America, use Google Earth and Google Street View to enhance our knowledge of particular places. 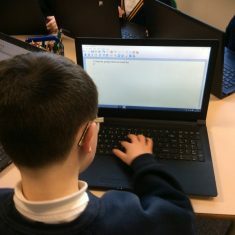 We put a lot of emphasis on typing speed, as we believe it to be important as we move into a more digital age. 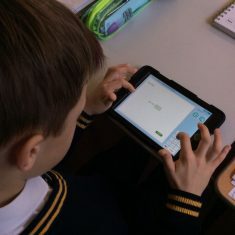 The children will also access coding through programs such as Scratch, and they will code their own digital quizzes for our handsets through ActivInspire. 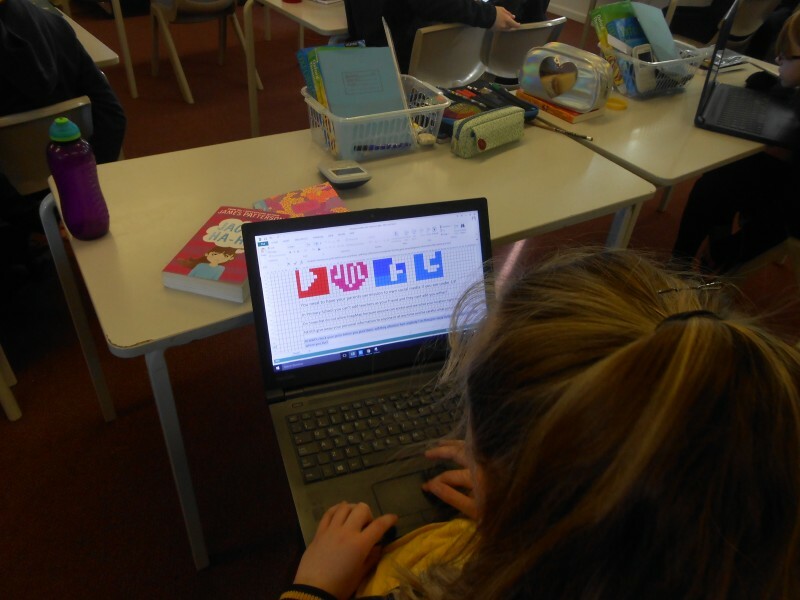 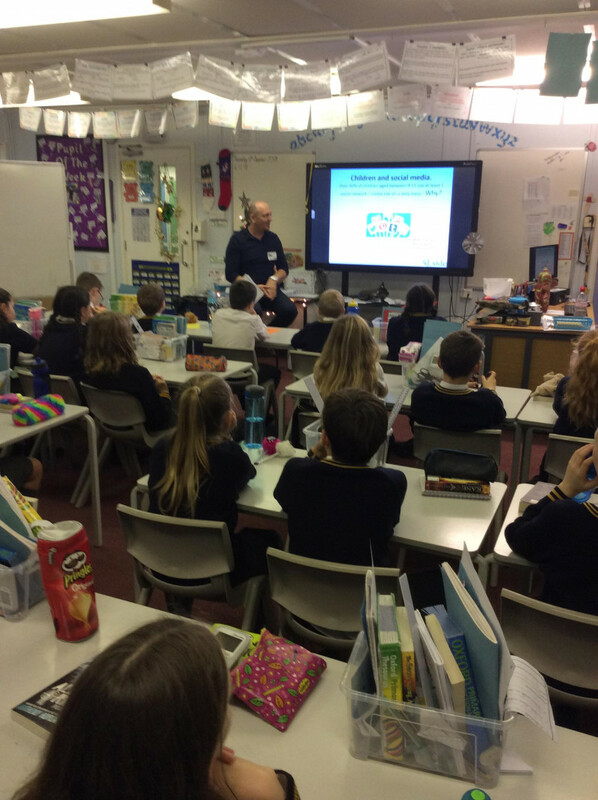 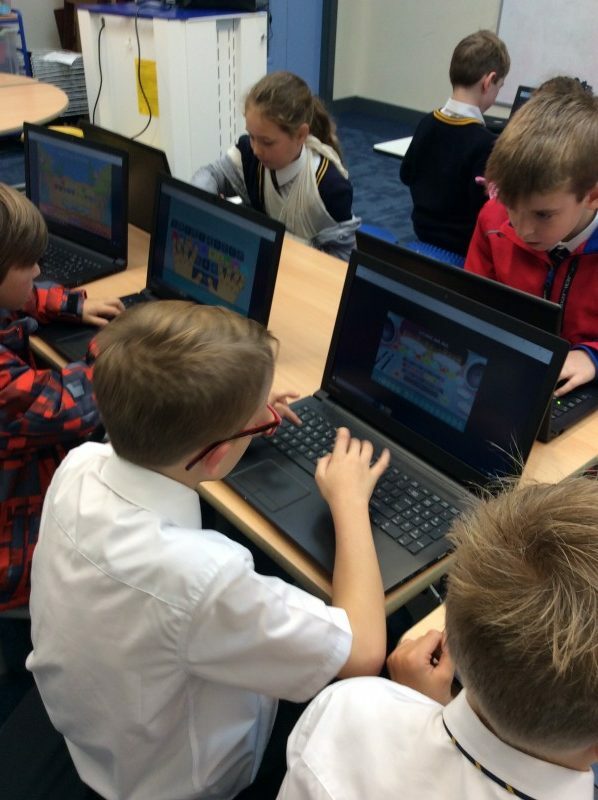 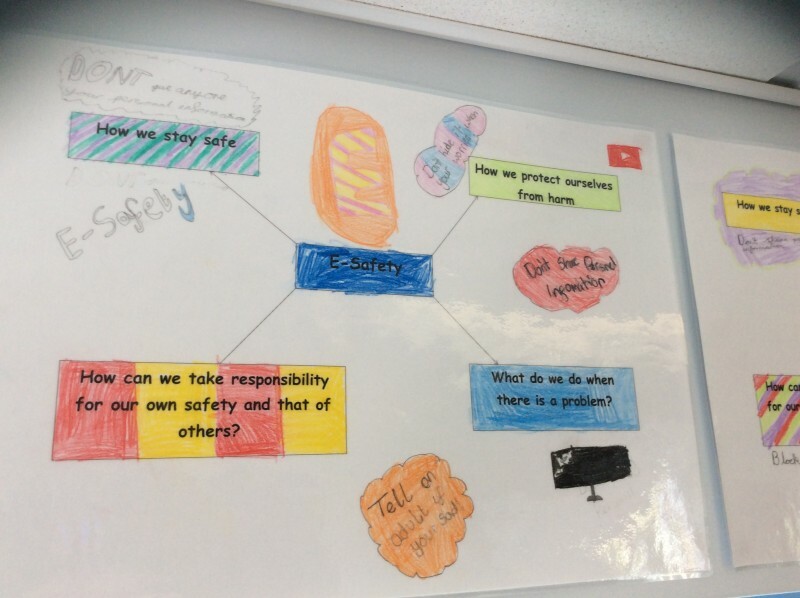 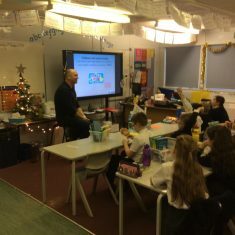 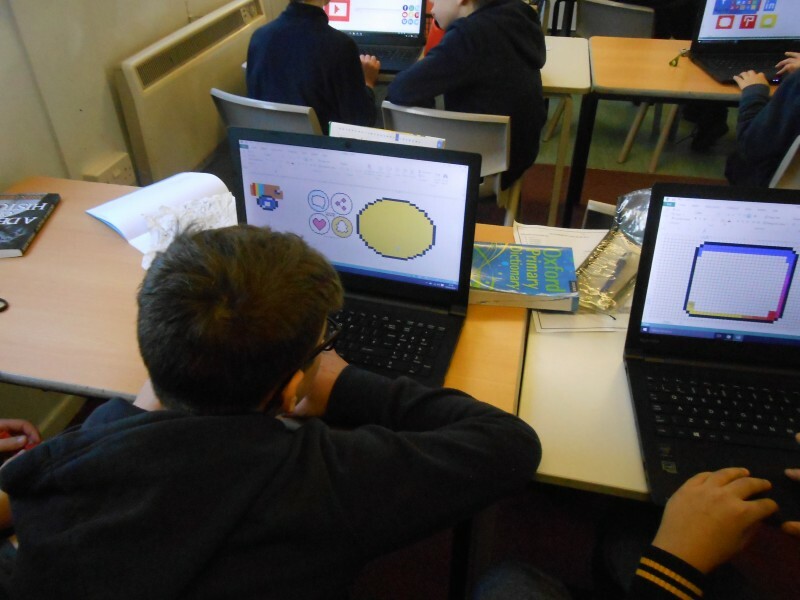 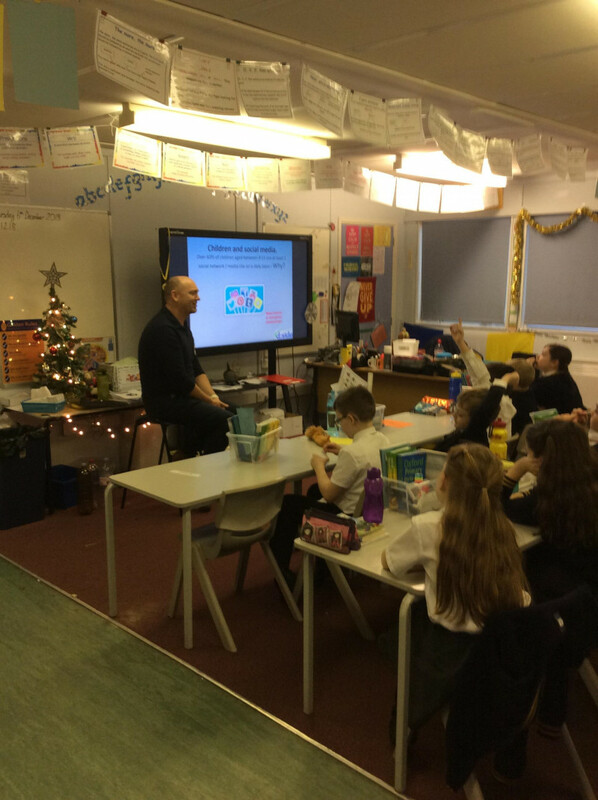 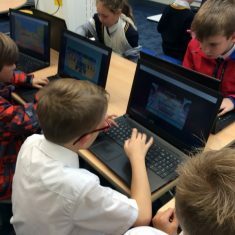 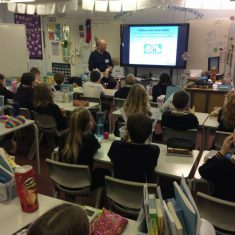 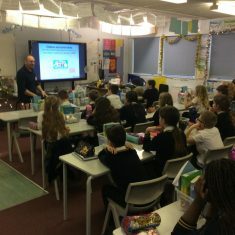 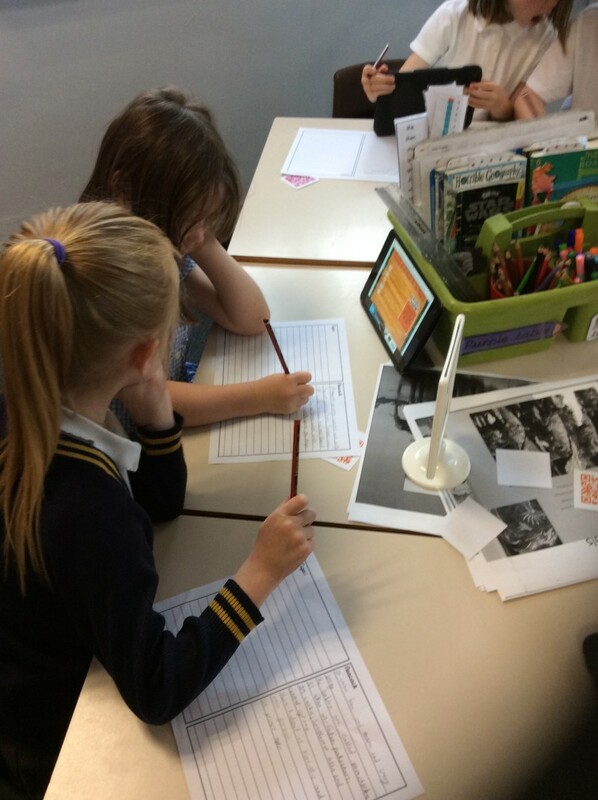 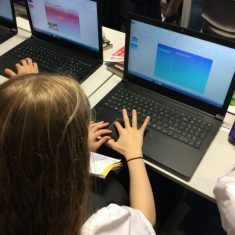 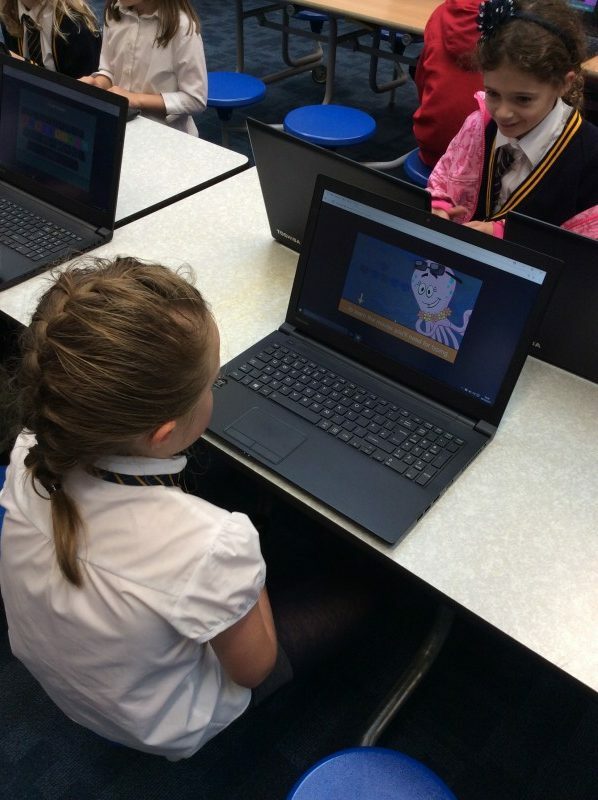 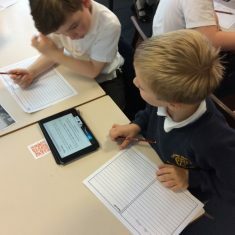 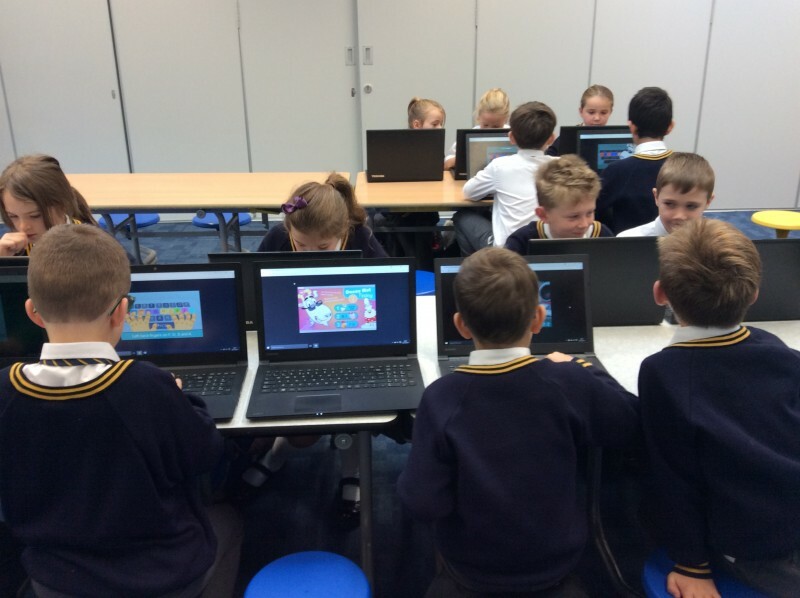 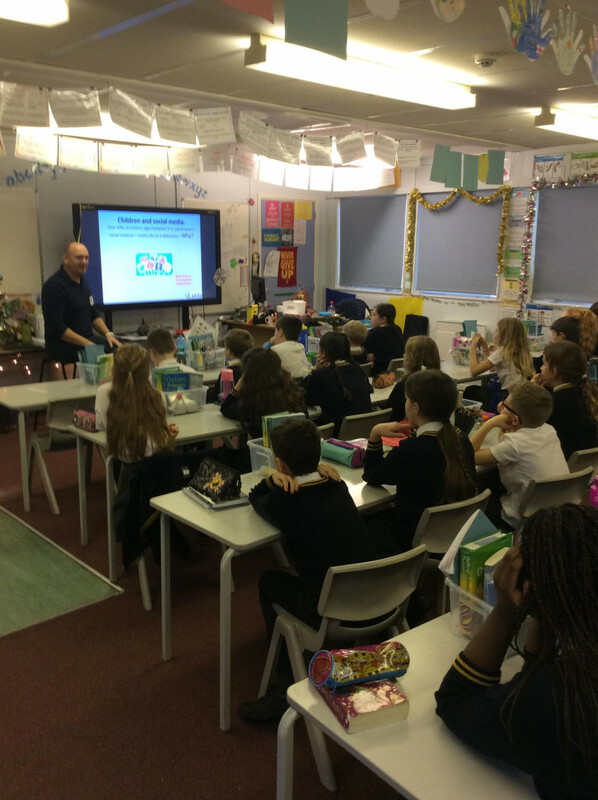 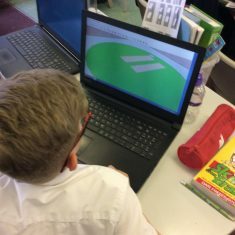 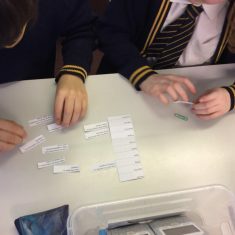 As always, E-Safety plays a big part in our computing lessons, where the children will use different media platforms to demonstrate their knowledge of how to stay safe online. 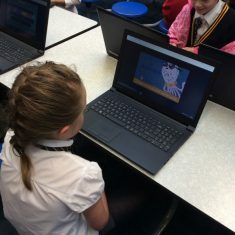 We also have a fun module on stop-start animation, where we use Microsoft Powerpoint to demonstrate how it works, before moving onto real-life, photographic animations. 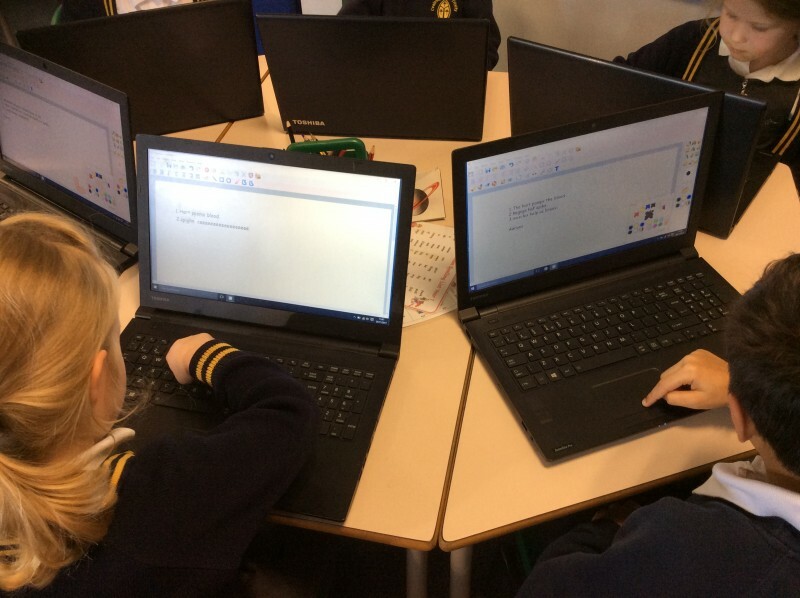 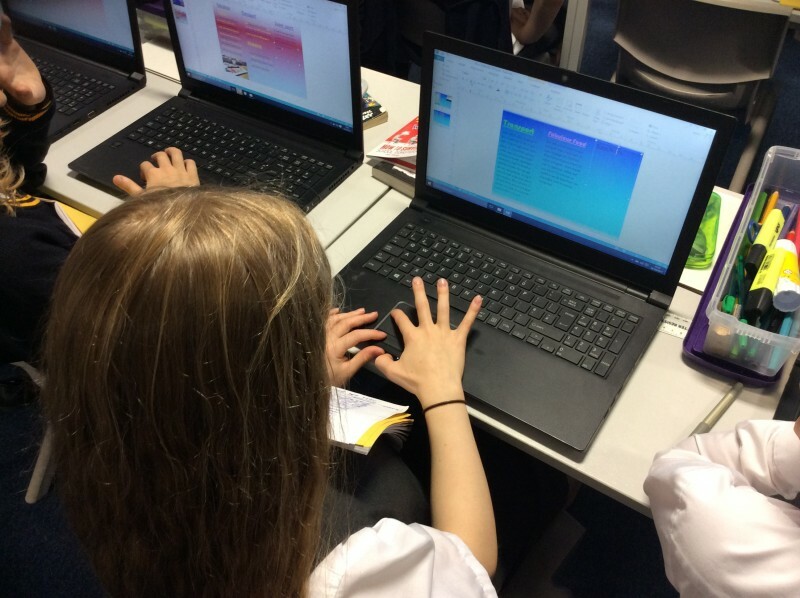 By the end of the year, the children should be familiar with all the basic Microsoft Programs – Word (for presenting written work), Publisher (to create eye-catching posters), Excel (for data-handling) and PowerPoint (for creating slideshows and animations). 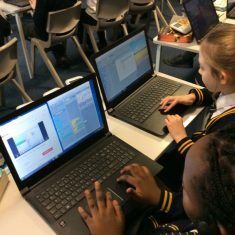 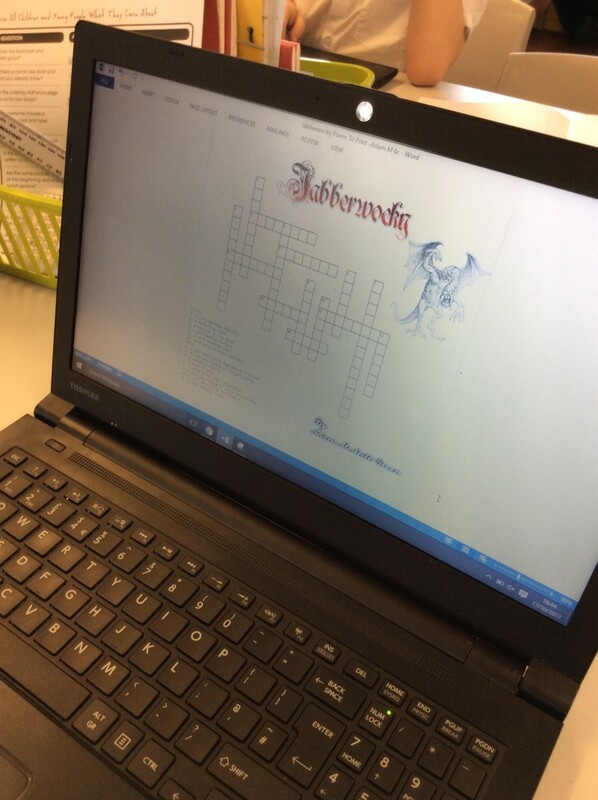 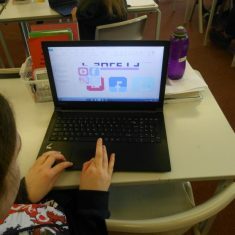 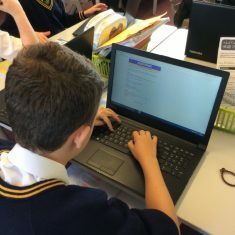 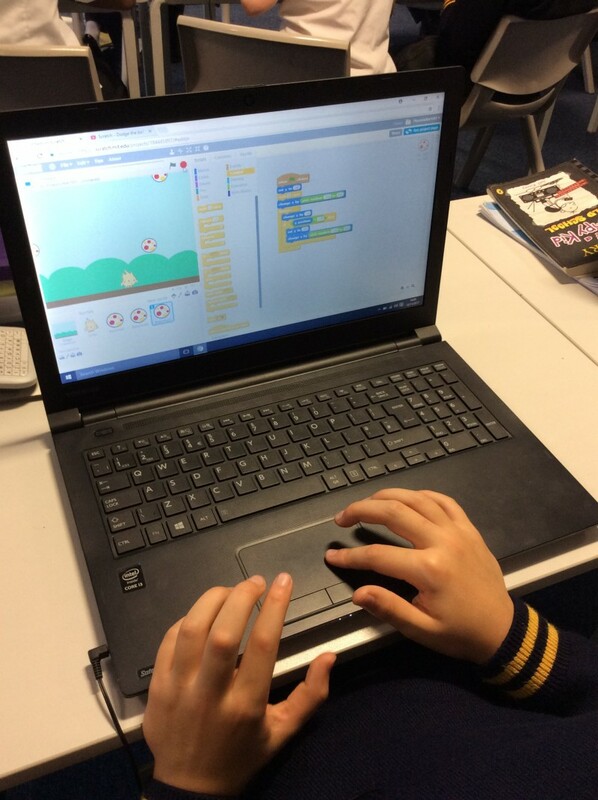 5C create their own game using coding. 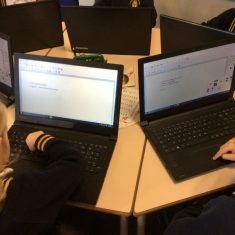 In year 6 we use computing for a variety of purposes. 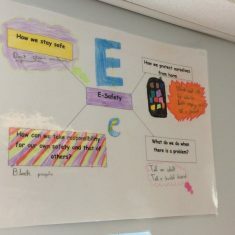 E-Safety is vital throughout school life when using any computing equipment which allows the children to go online. 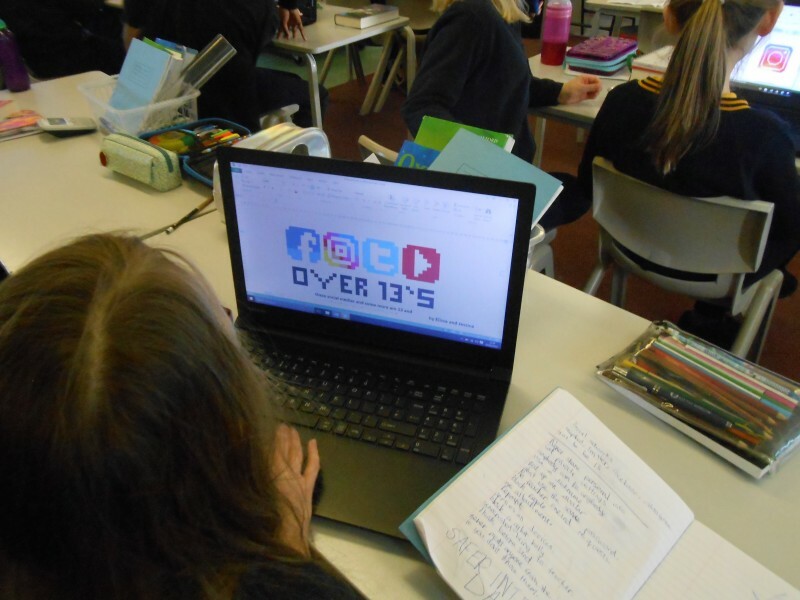 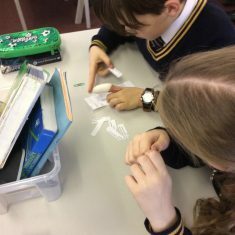 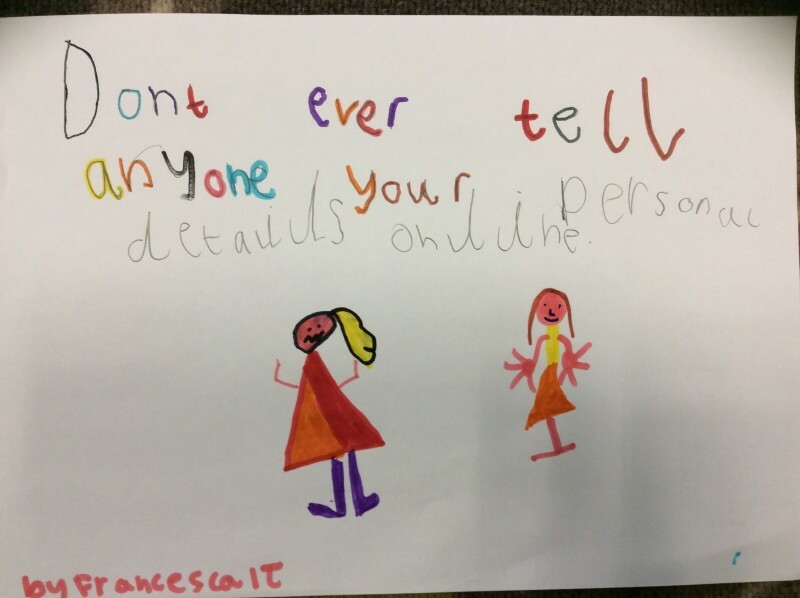 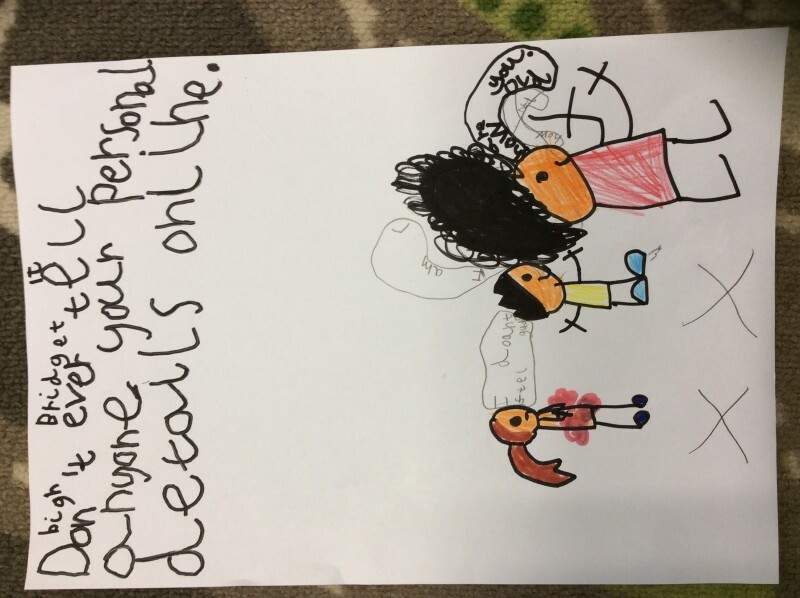 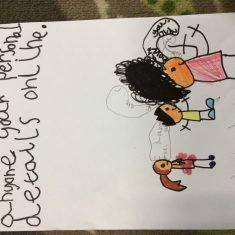 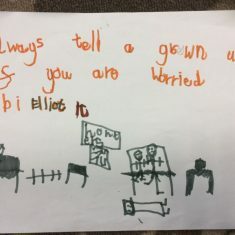 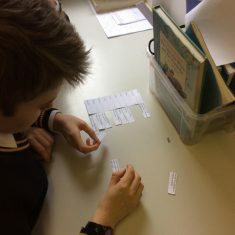 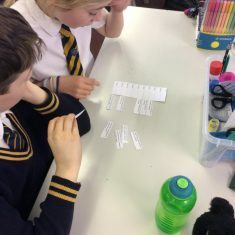 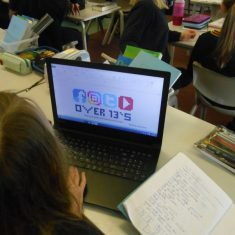 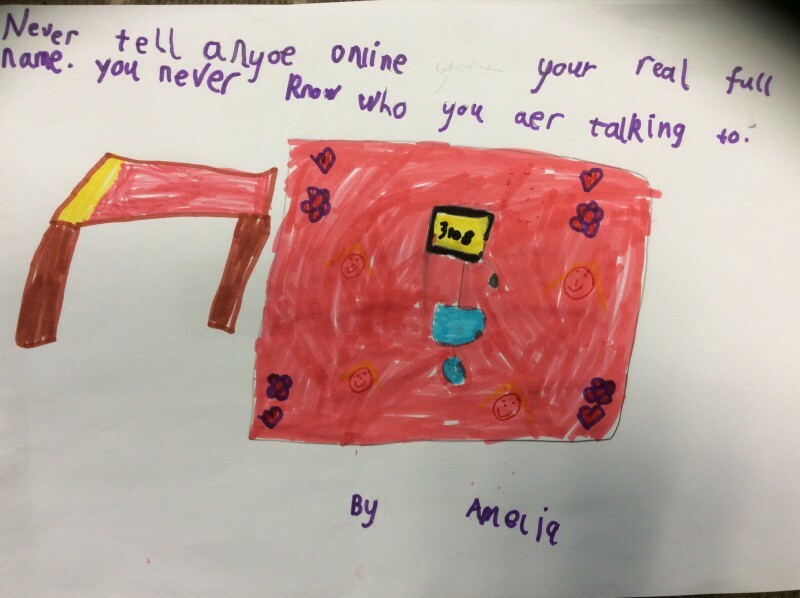 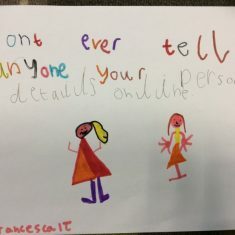 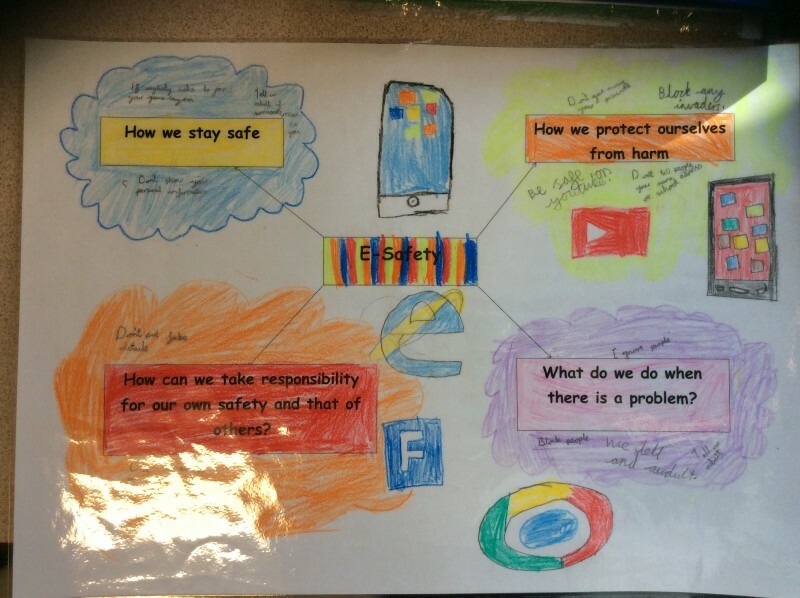 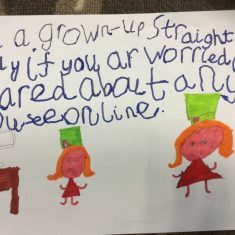 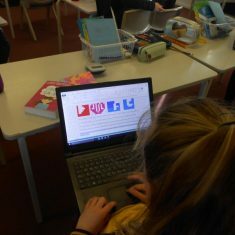 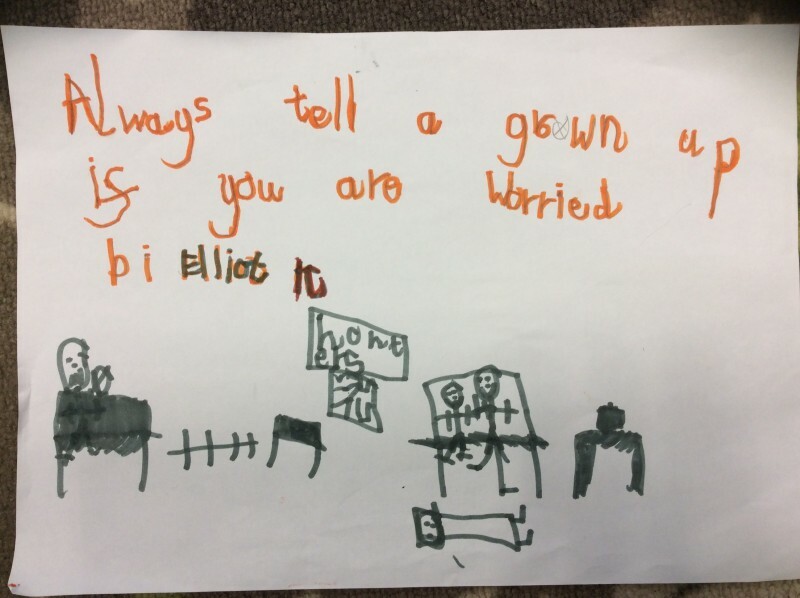 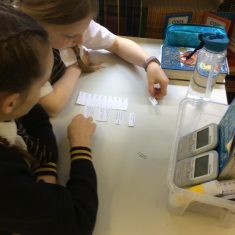 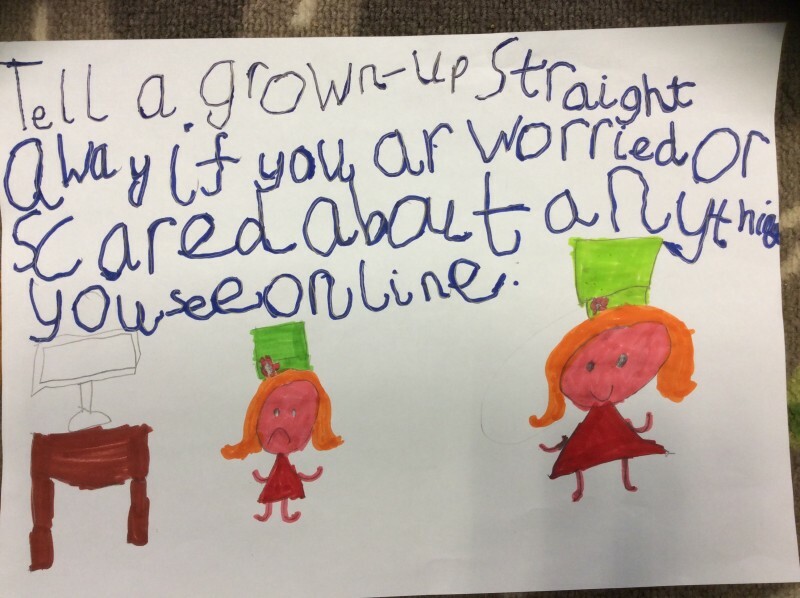 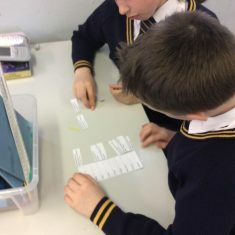 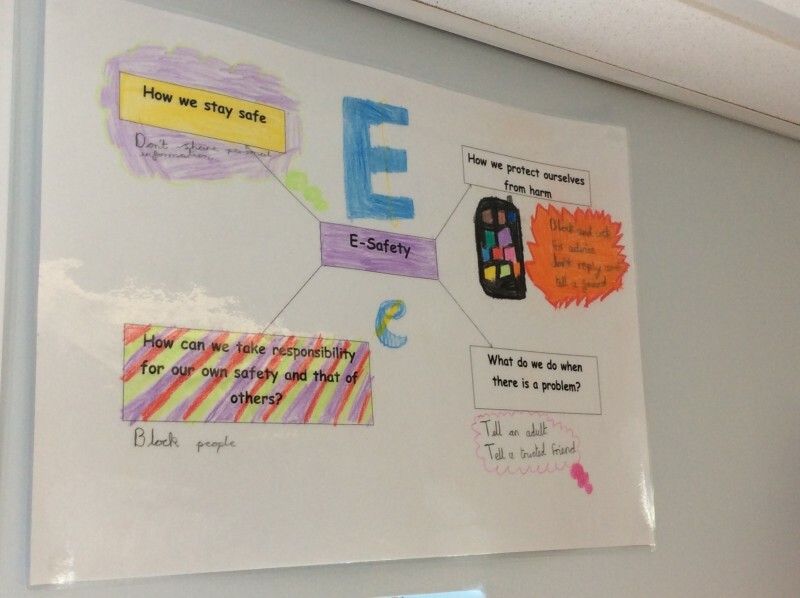 We ensure E-Safety is prominent in all of our lessons and the children understand the importance of keeping safe online; understand the age restrictions and privacy settings on social media and know what to do if anything inappropriate is flagged up. 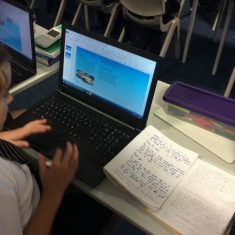 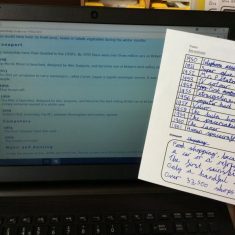 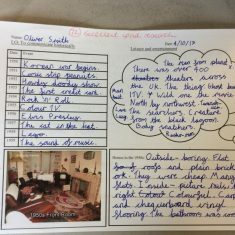 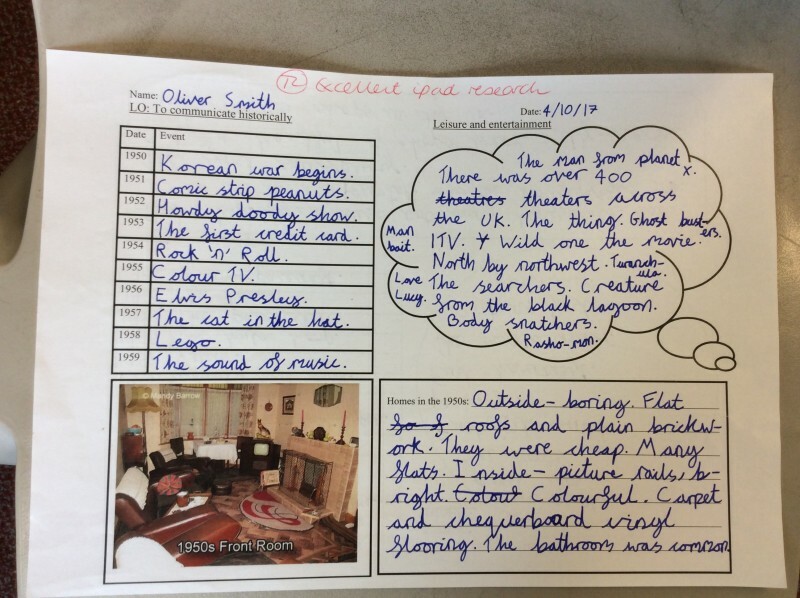 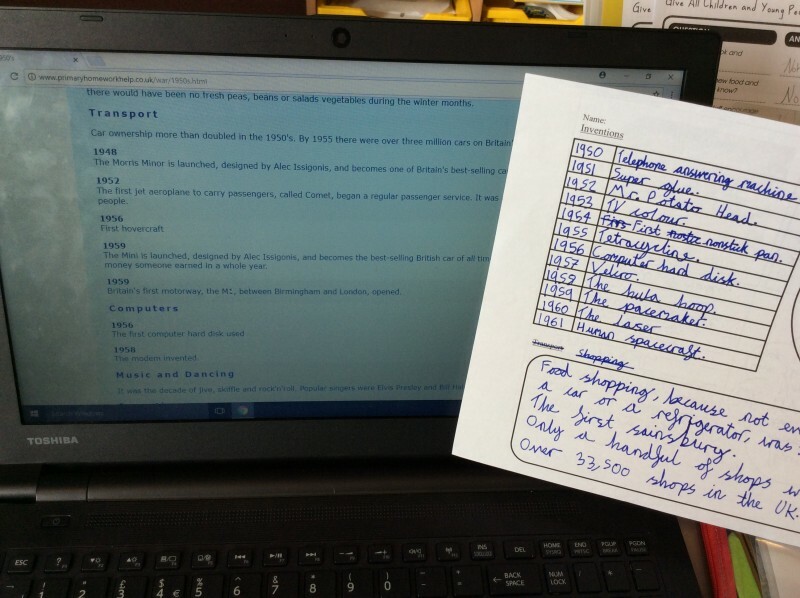 We use computing for research purposes throughout our topic lessons on WWII and mountains- using Google to enhance the children’s learning and produce work suited to the task. 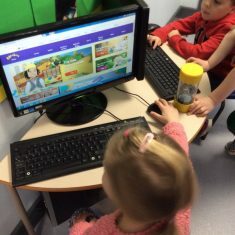 We make sure that the children are taught about not copying and pasting directly from the internet, and using websites that are reliable. 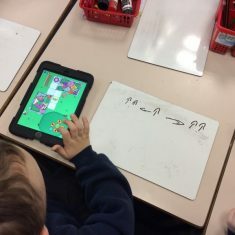 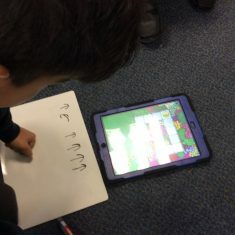 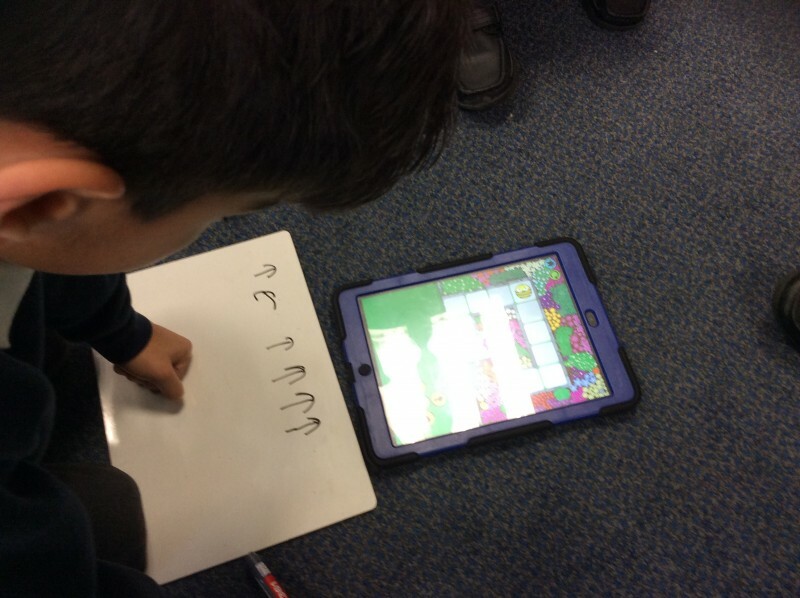 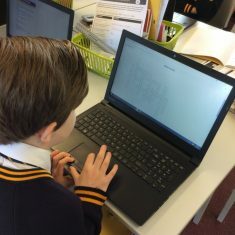 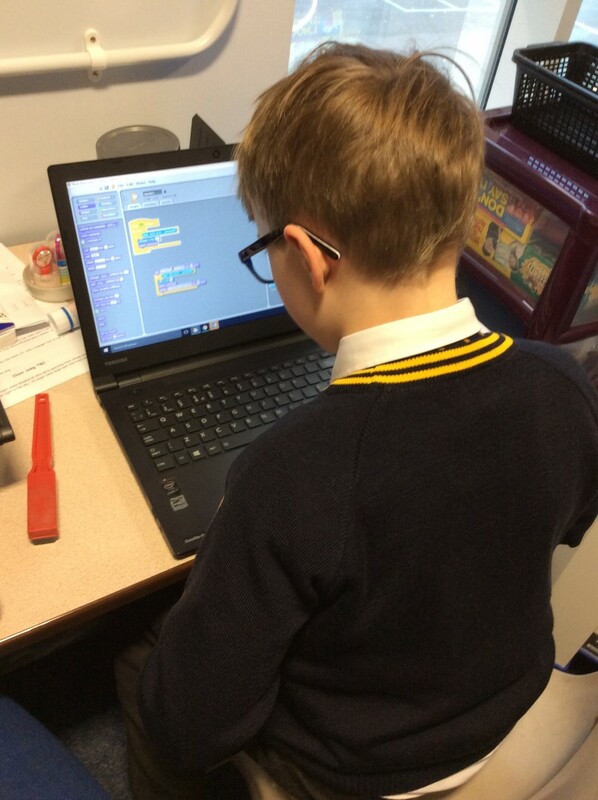 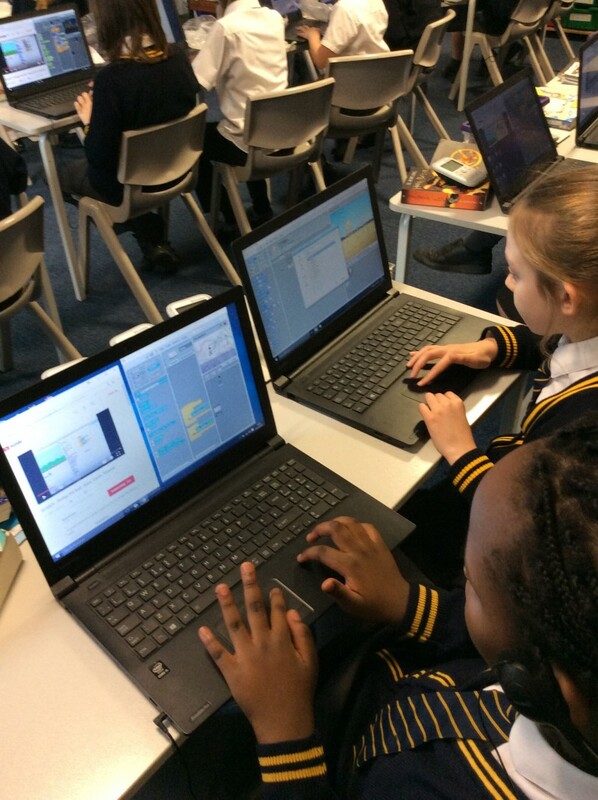 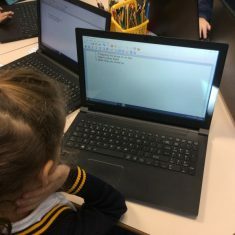 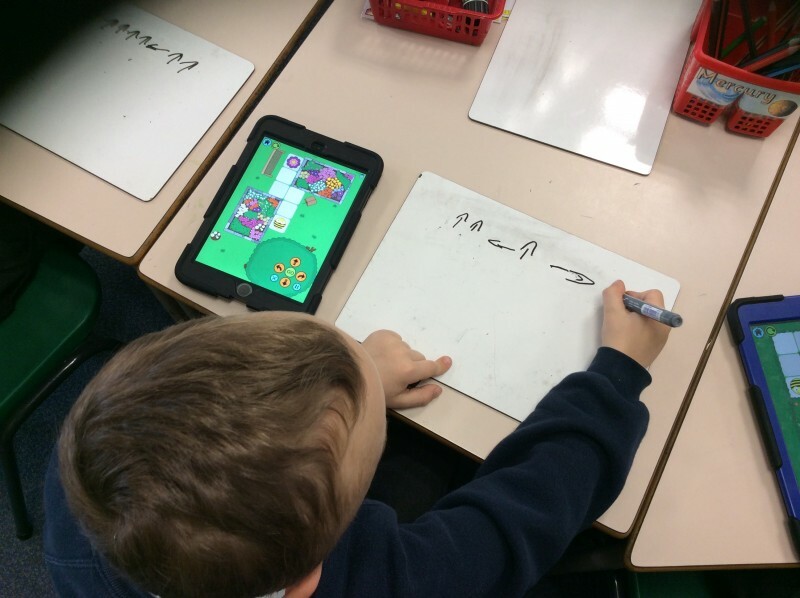 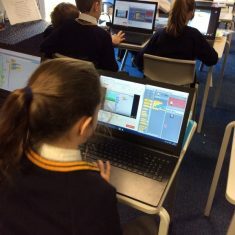 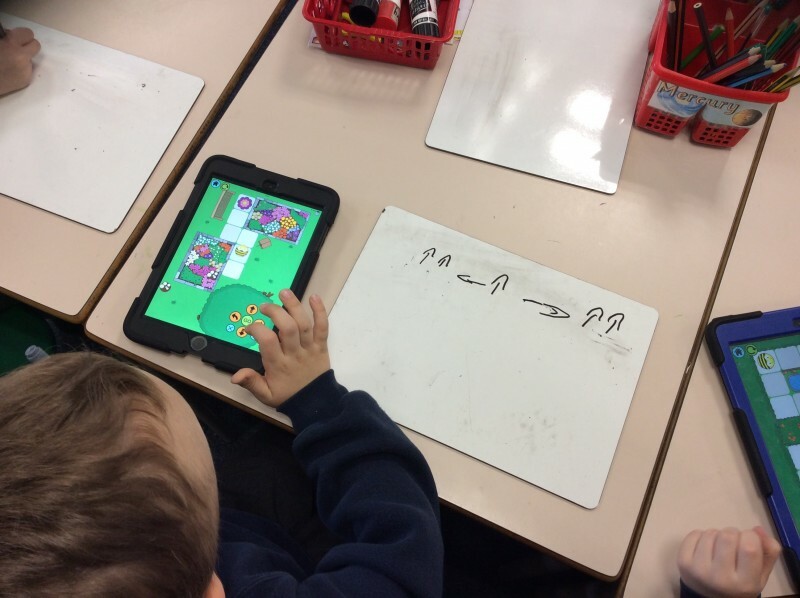 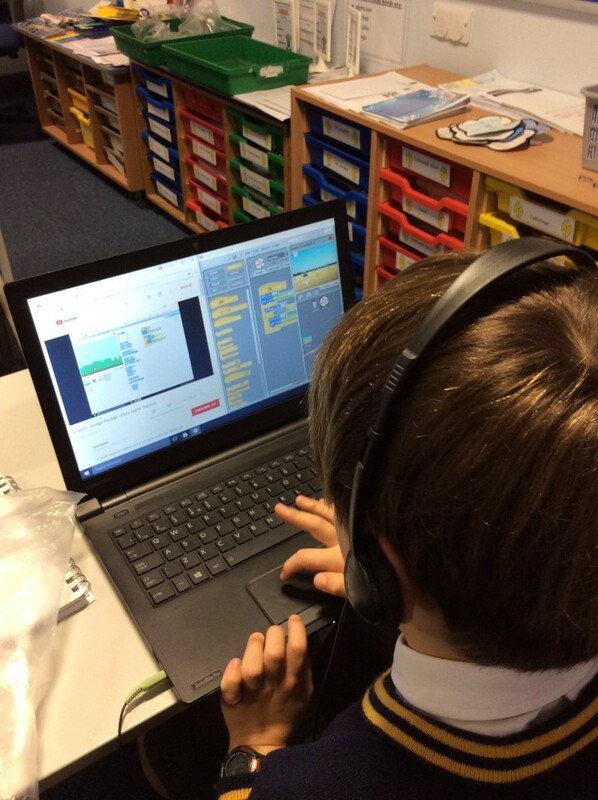 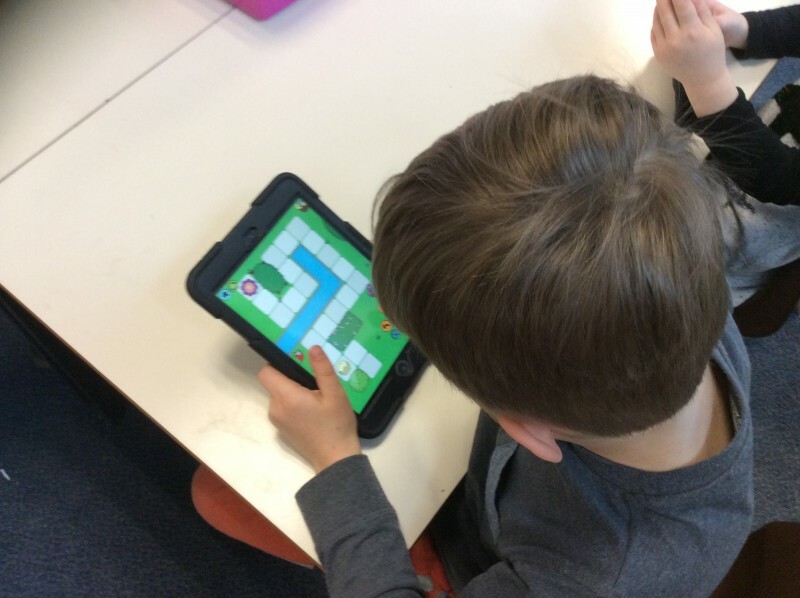 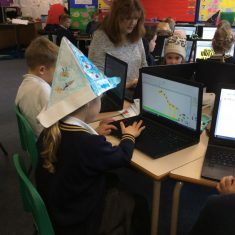 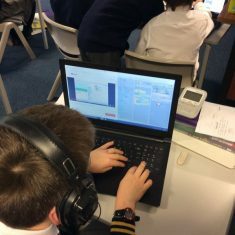 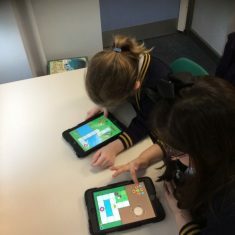 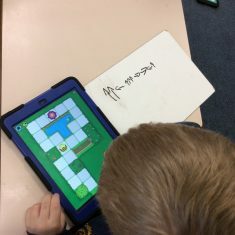 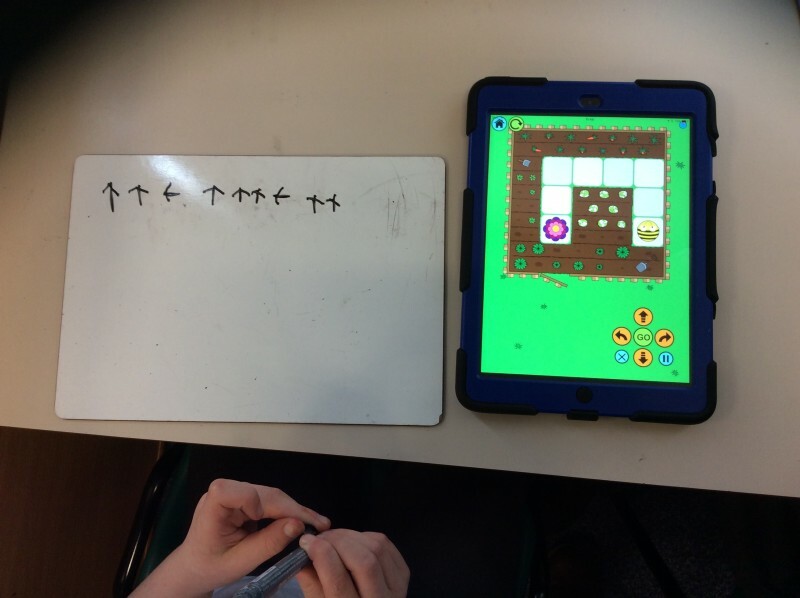 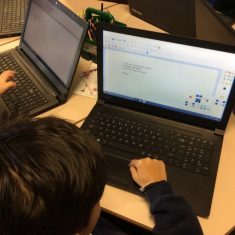 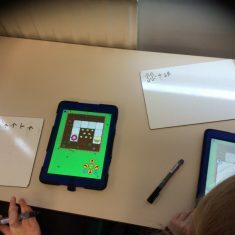 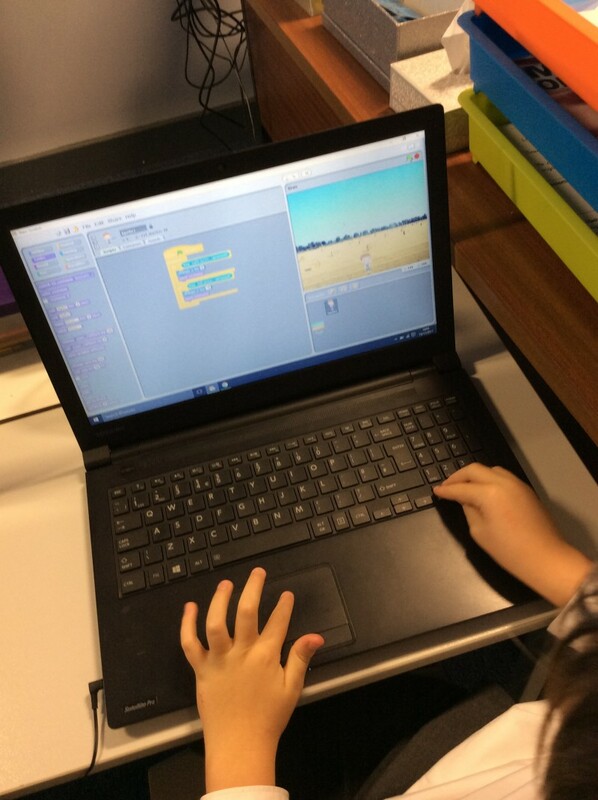 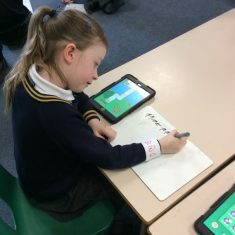 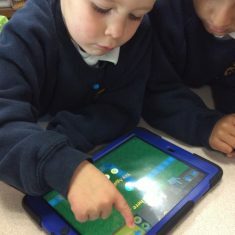 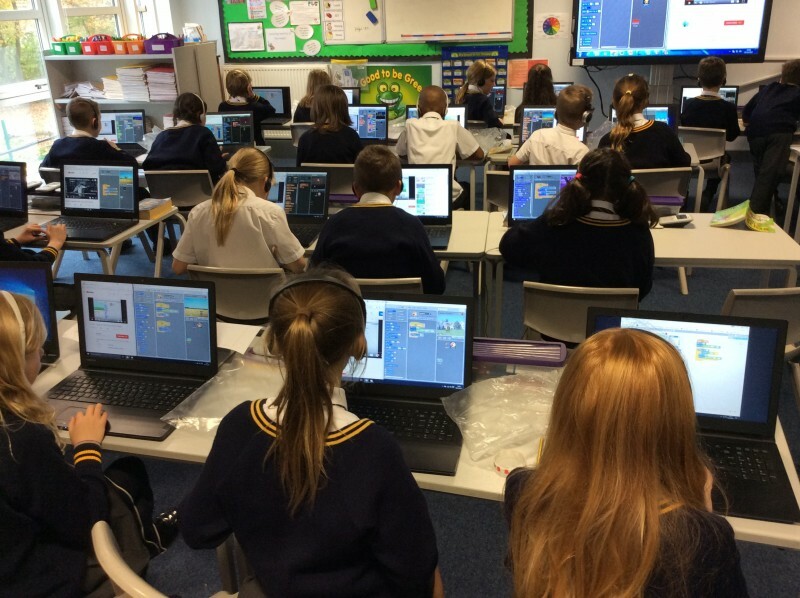 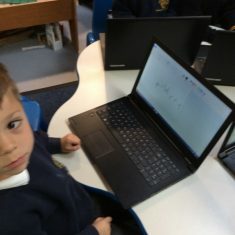 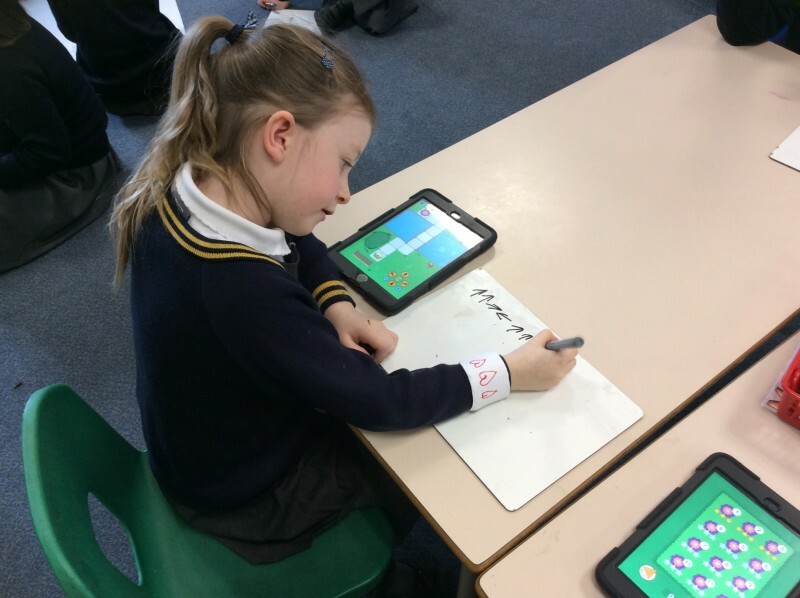 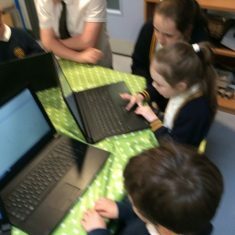 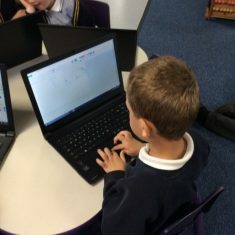 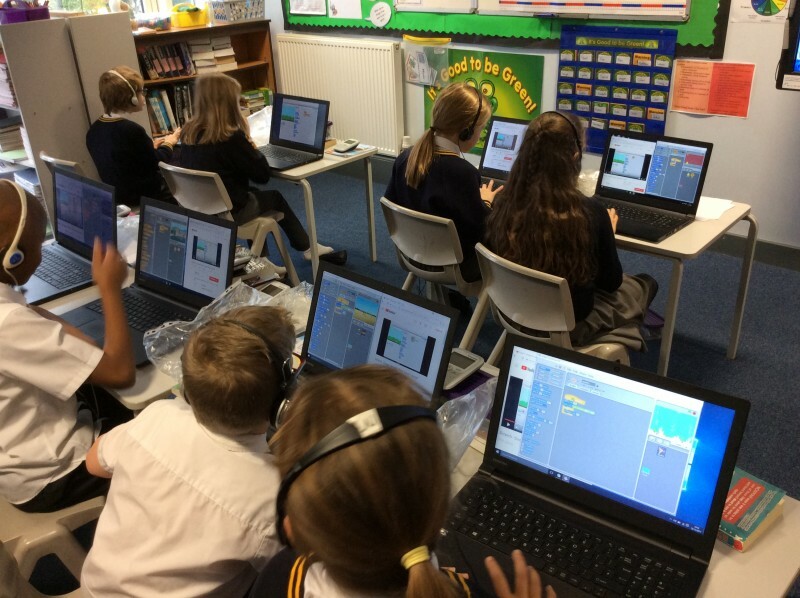 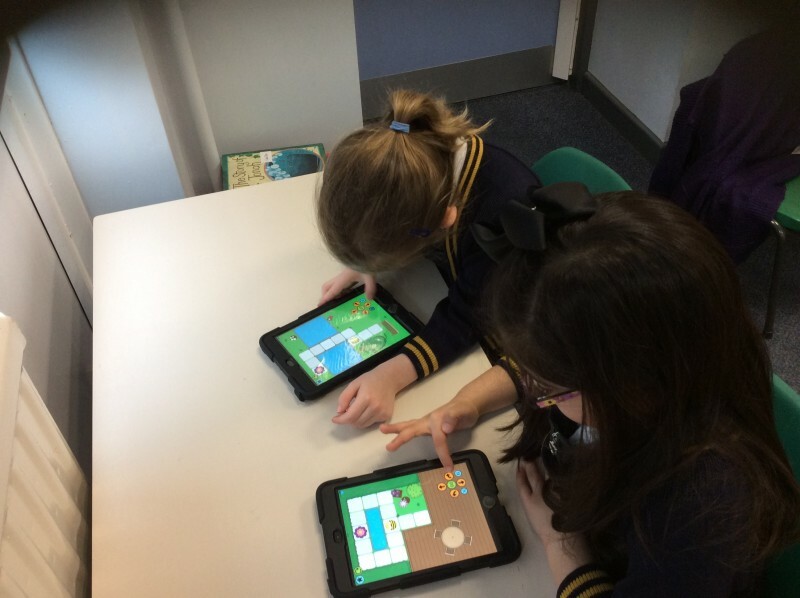 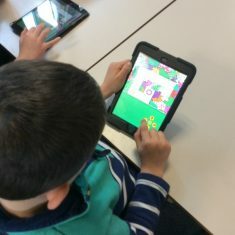 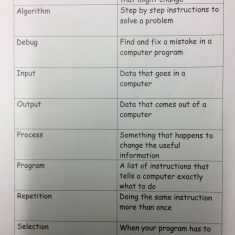 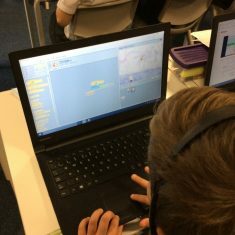 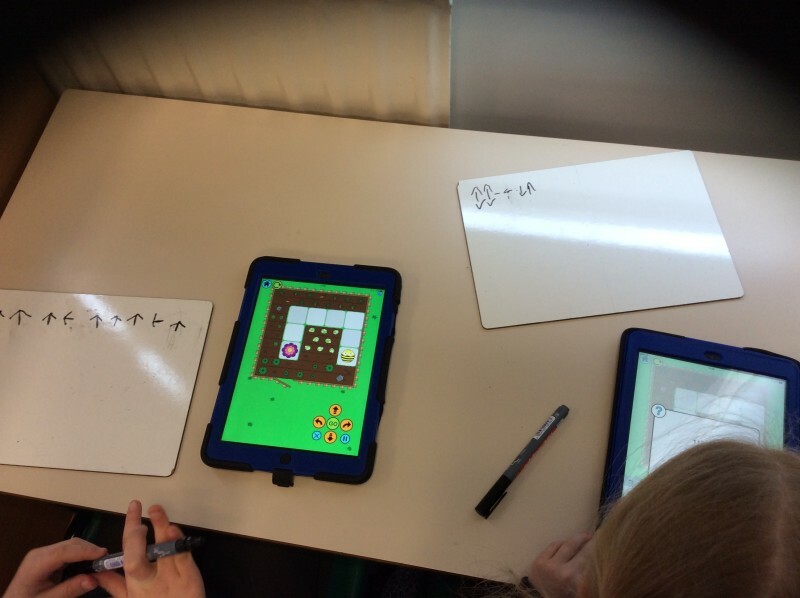 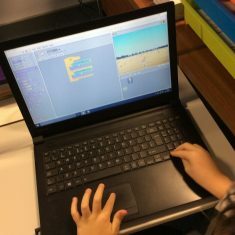 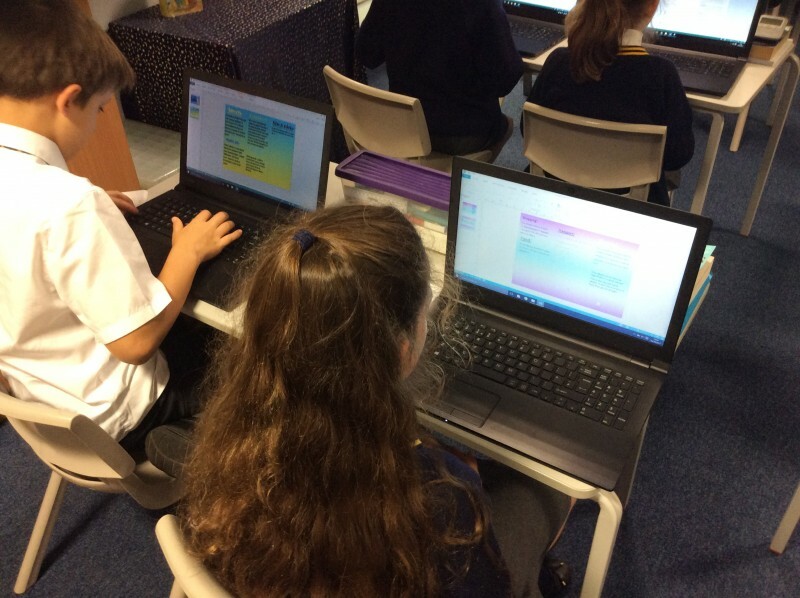 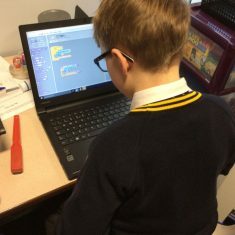 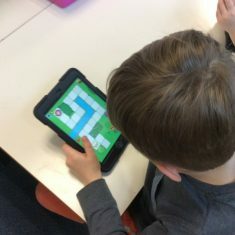 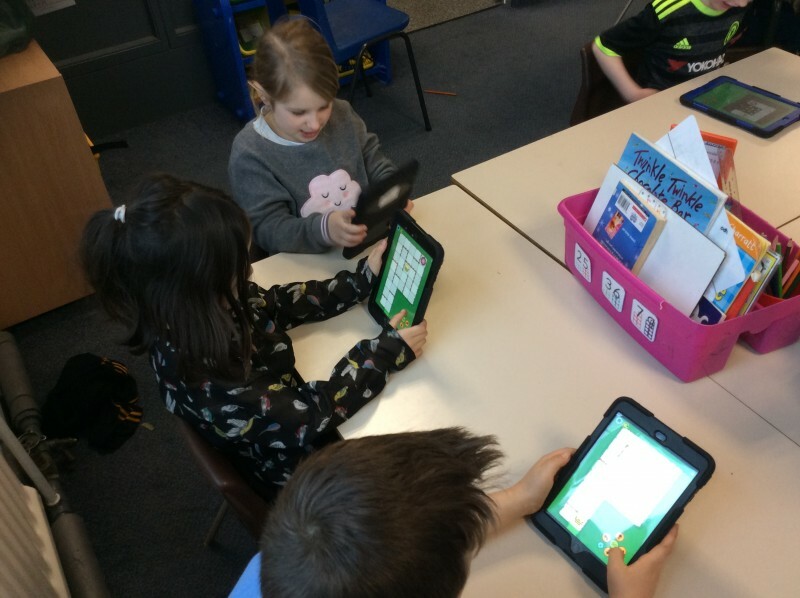 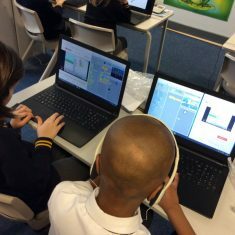 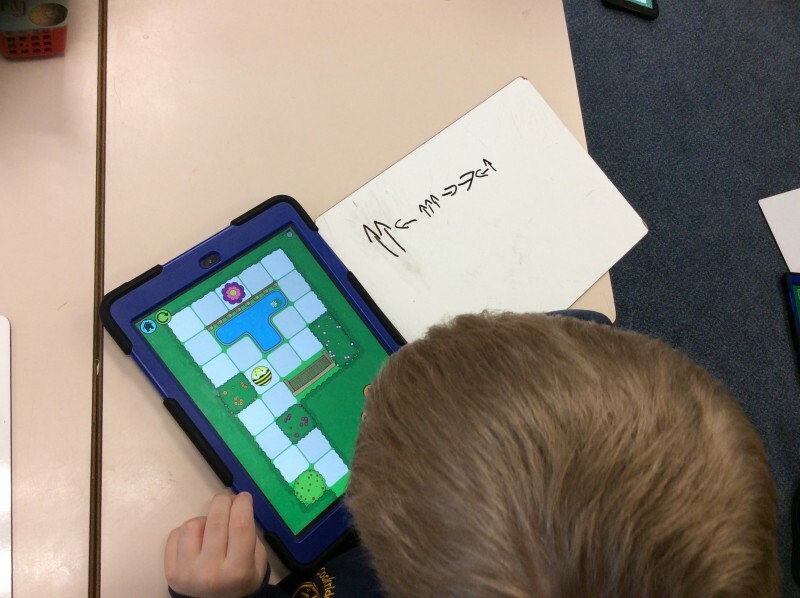 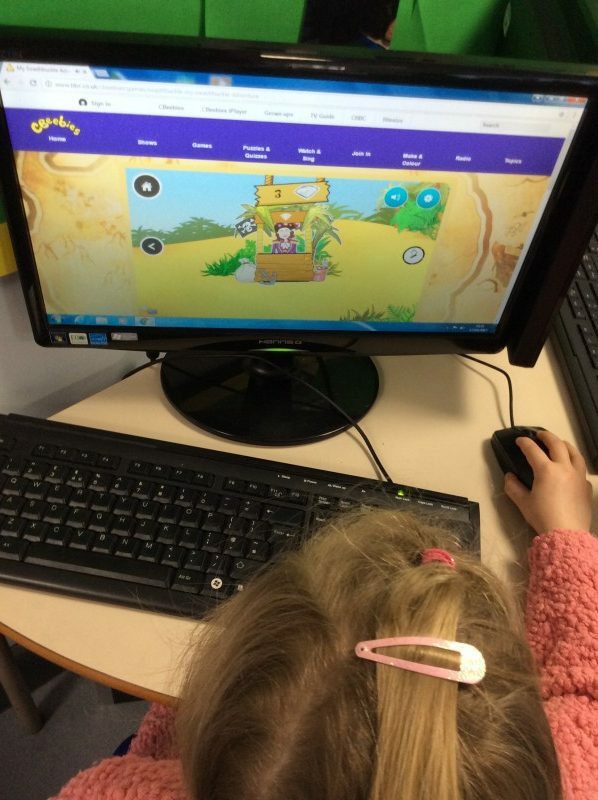 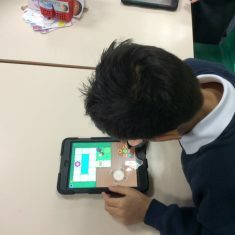 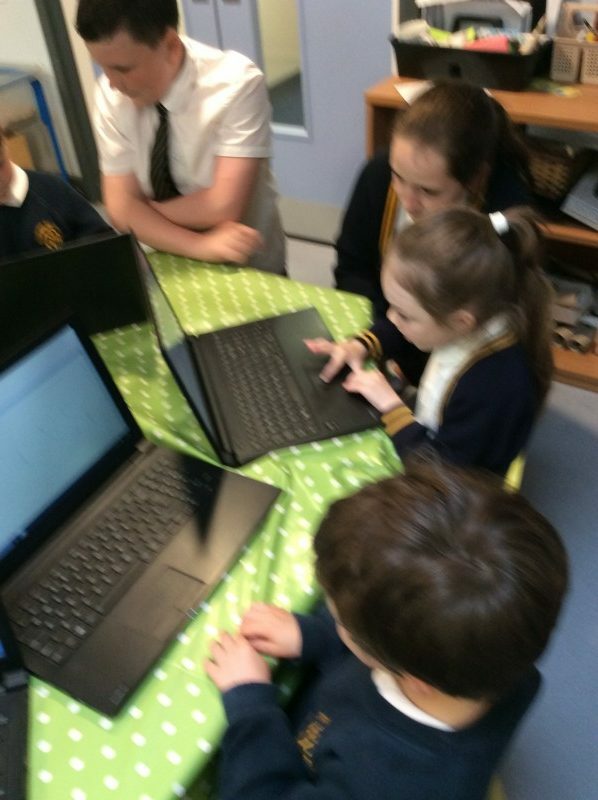 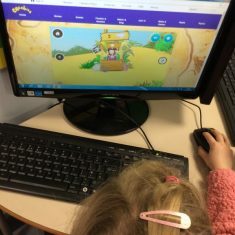 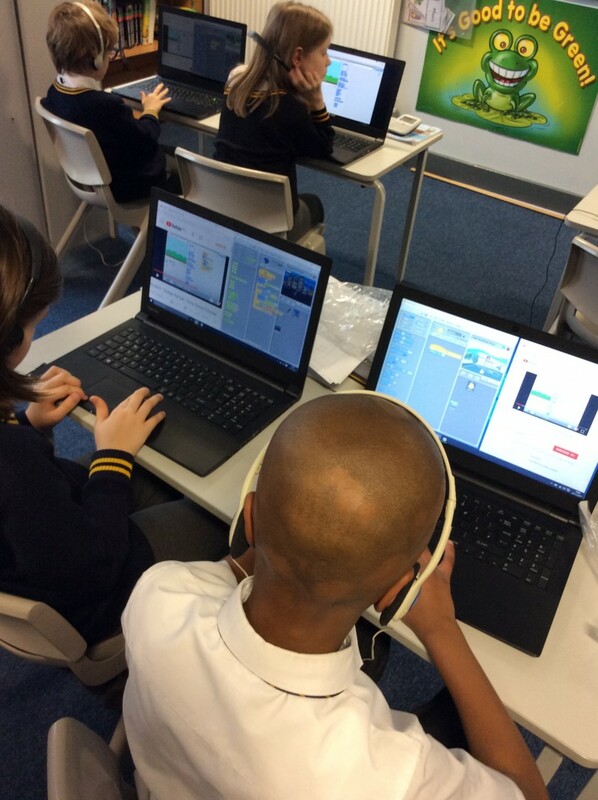 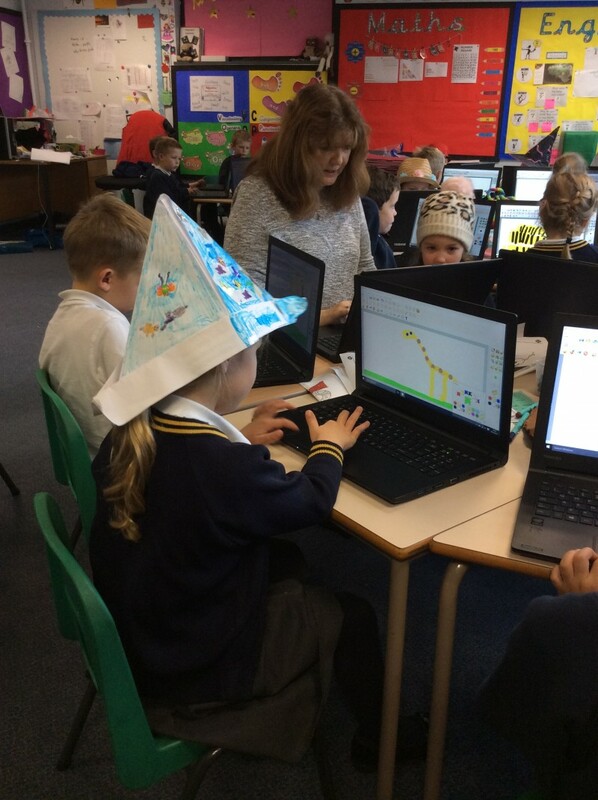 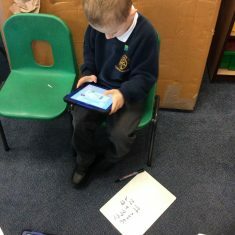 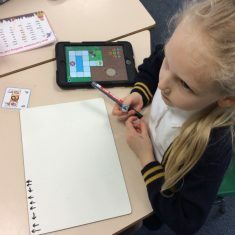 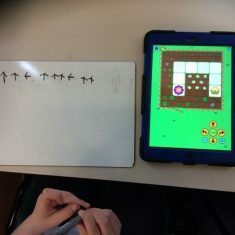 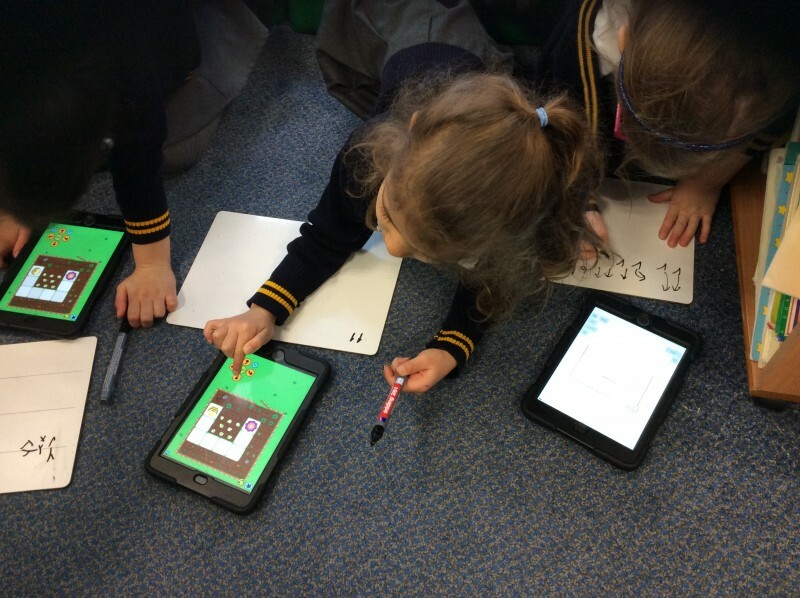 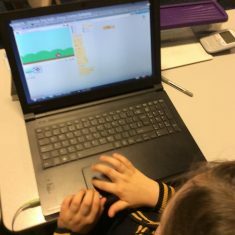 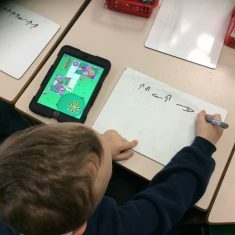 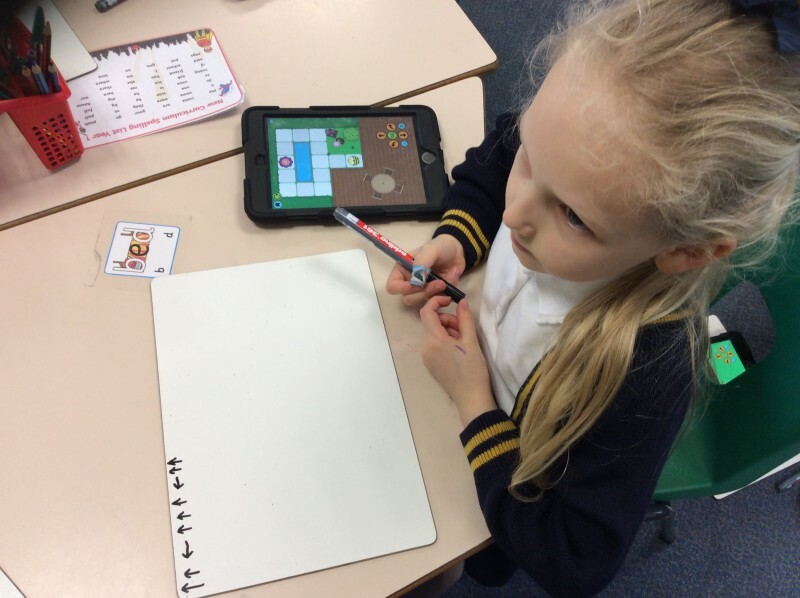 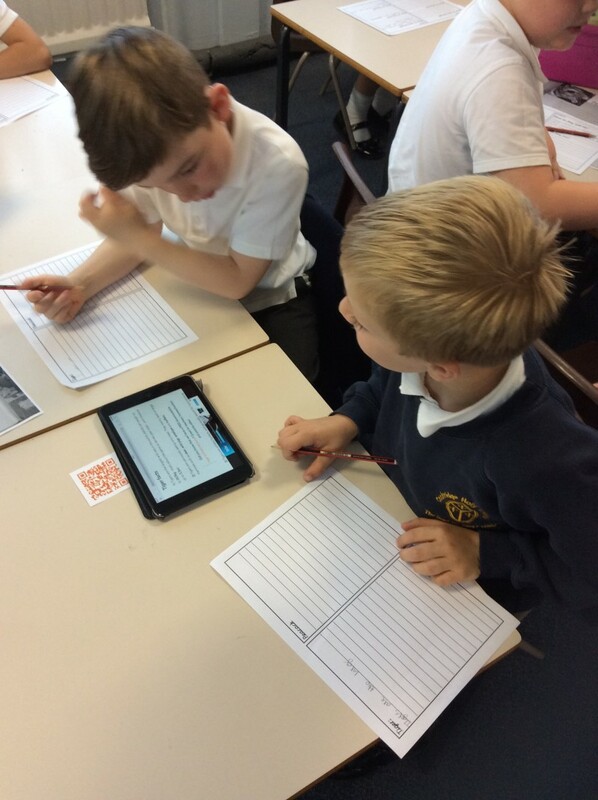 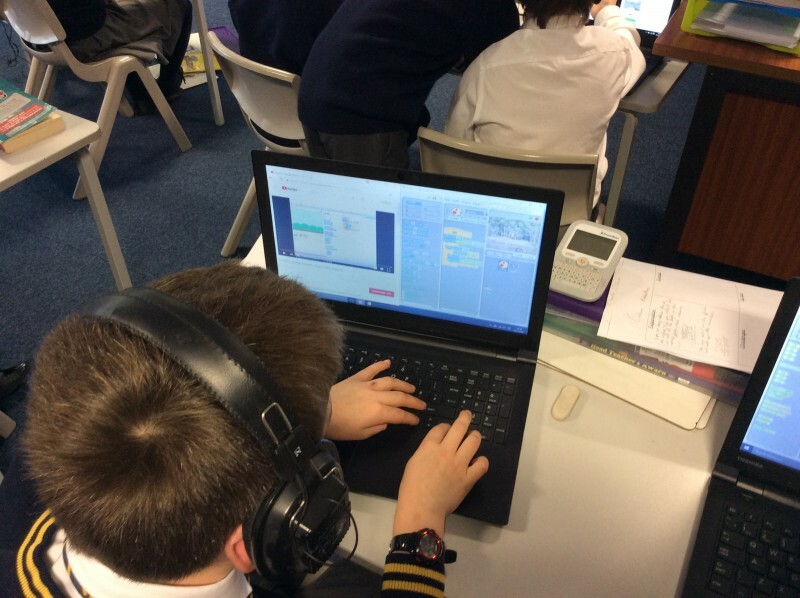 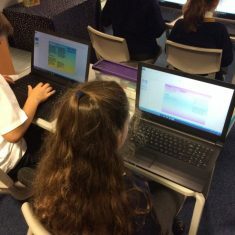 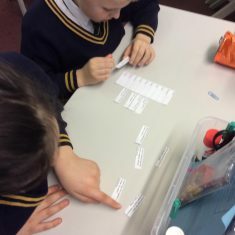 The children use their coding skills by using Scratch and build upon previous years by introducing variables for lists and ‘if, then, else’ conditions. 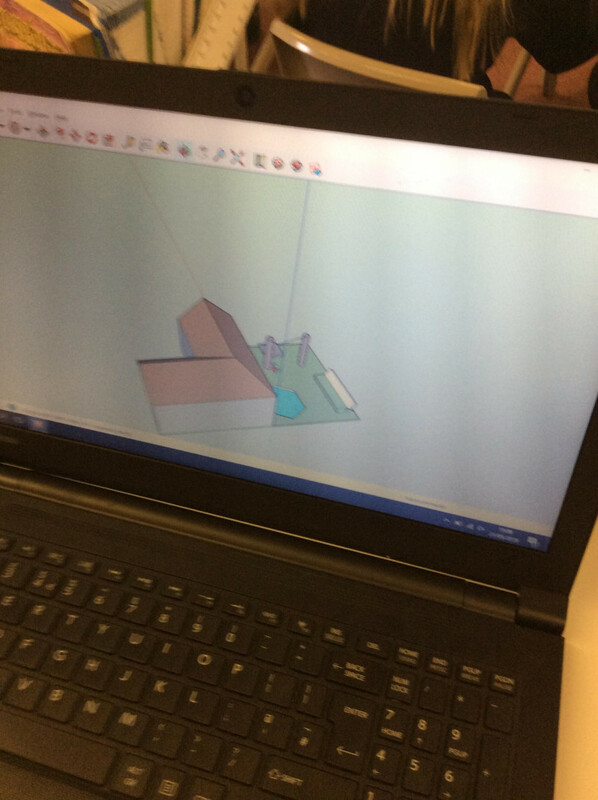 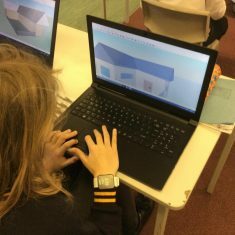 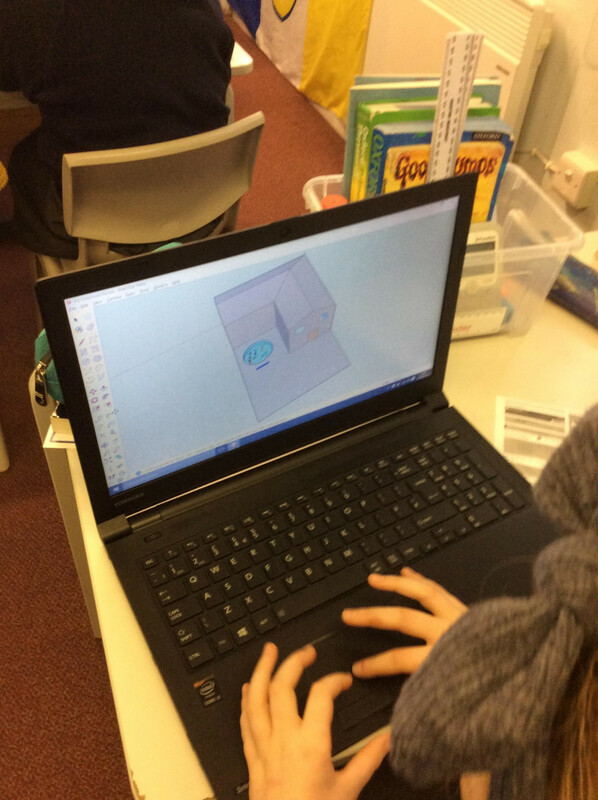 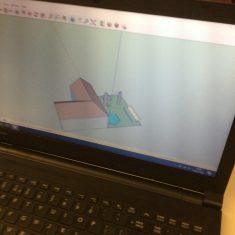 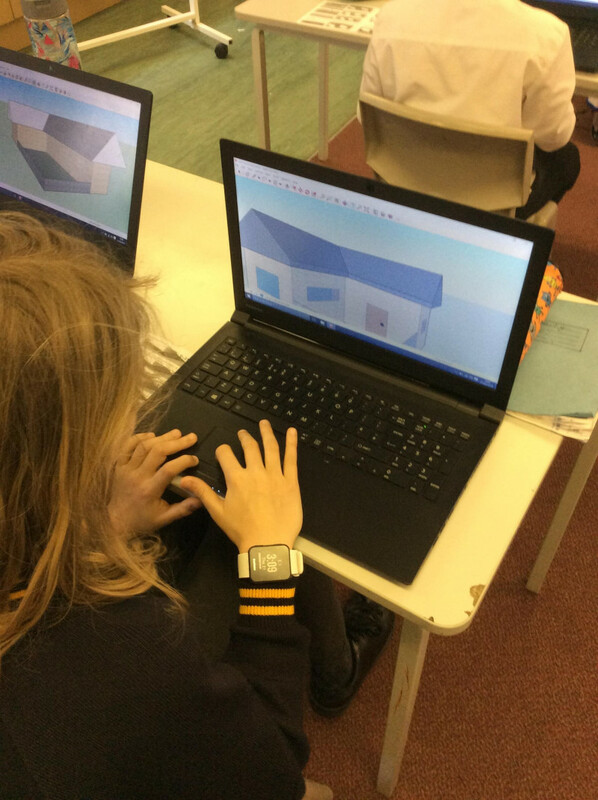 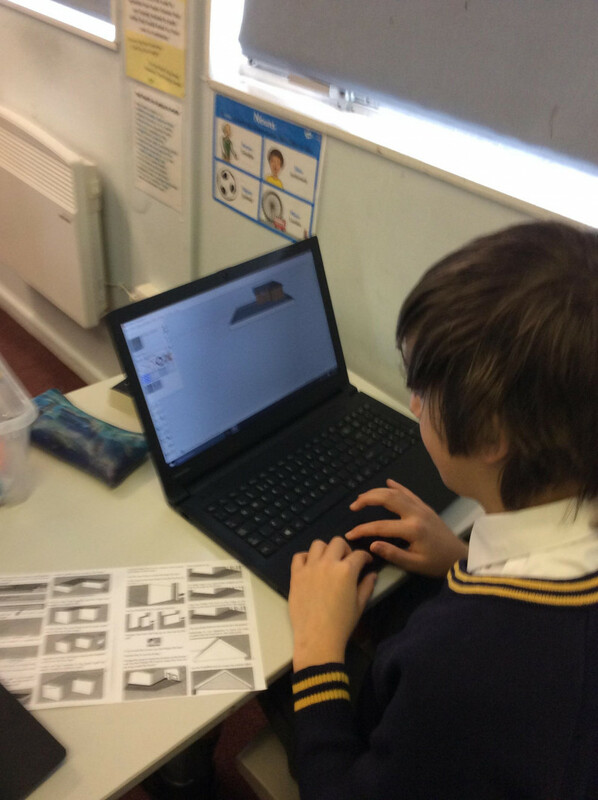 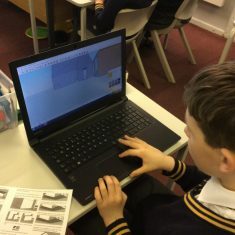 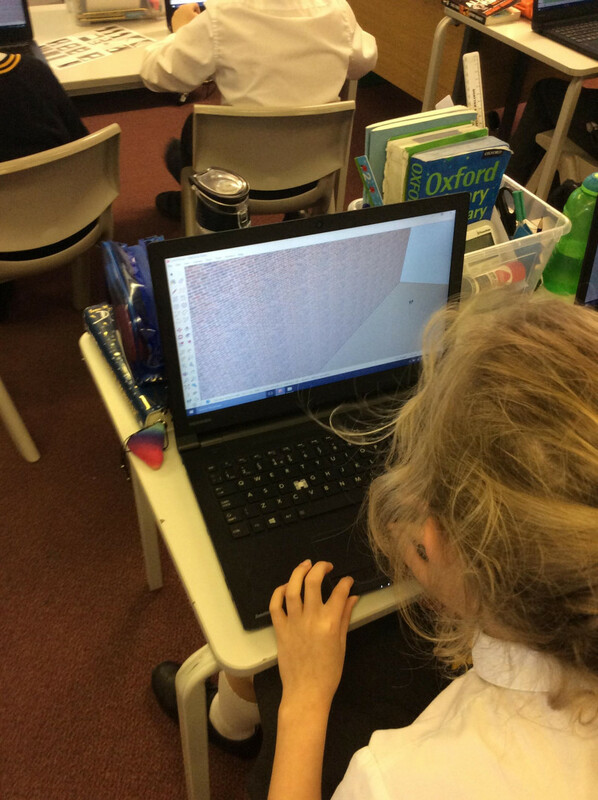 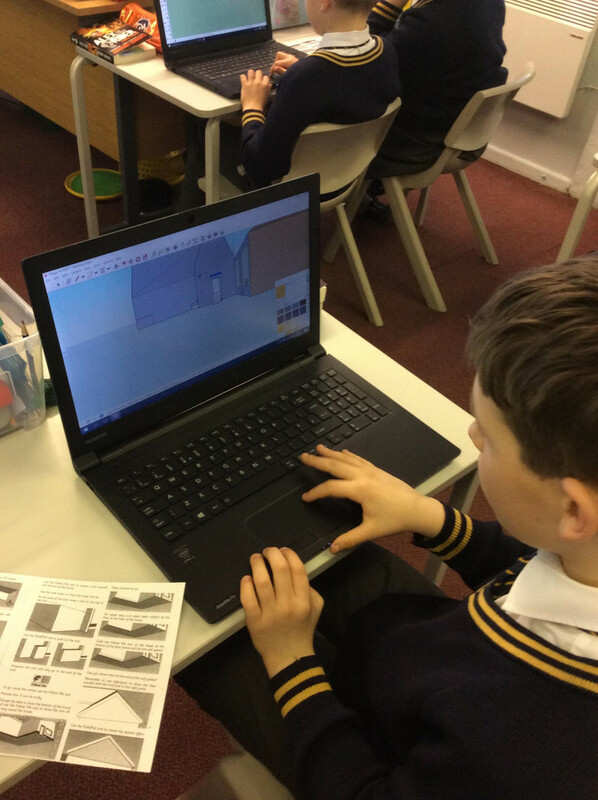 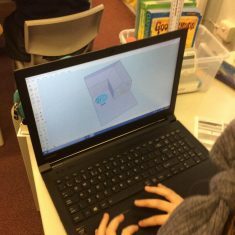 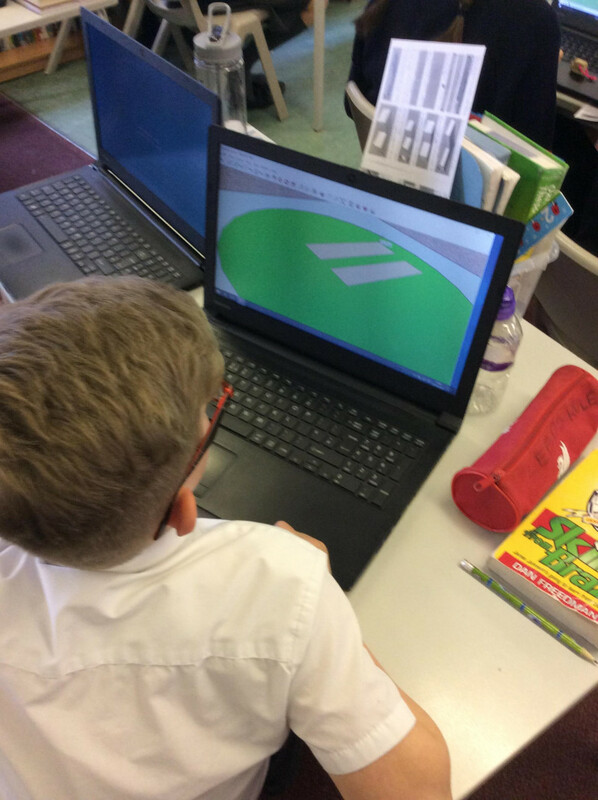 We also use Sketch-Up (a 3D modelling program), which allows the children to become a graphic designer- they use this to design their own ski resorts during our topic on mountains.